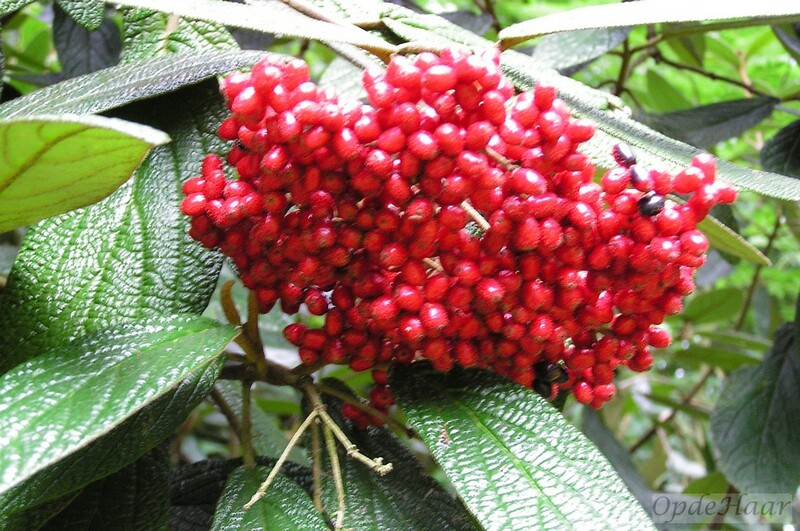 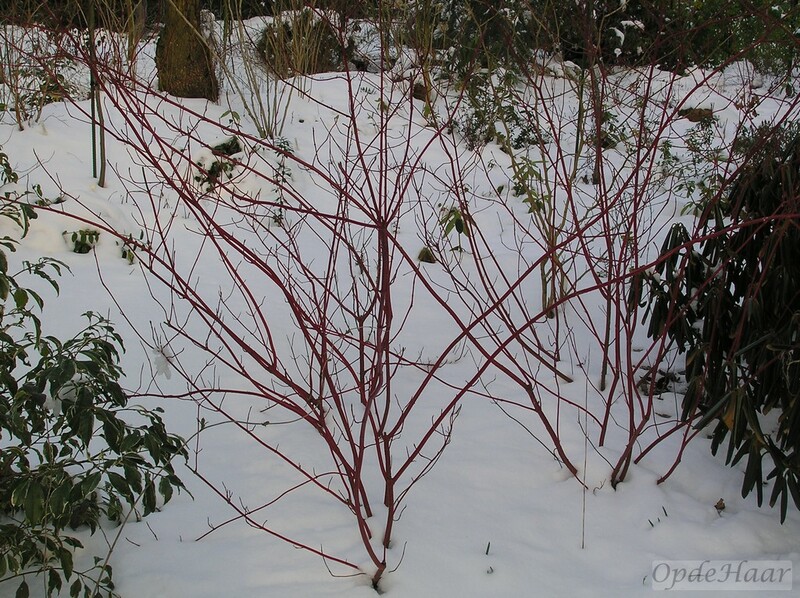 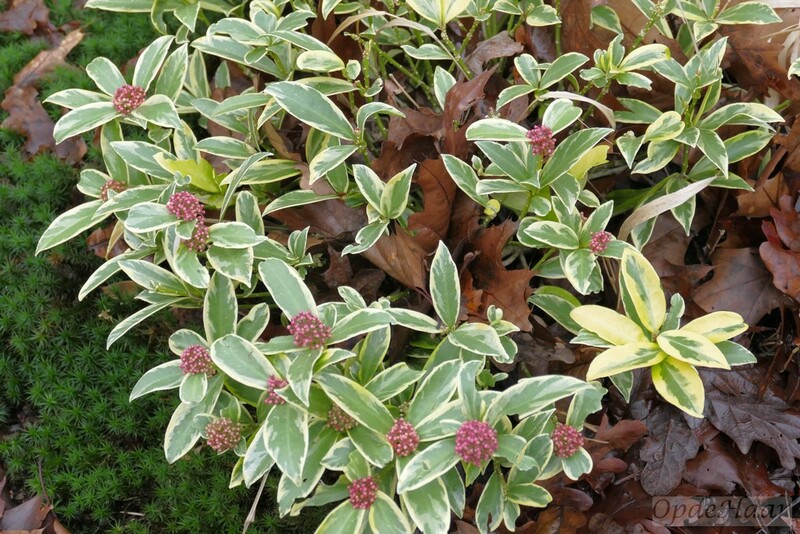 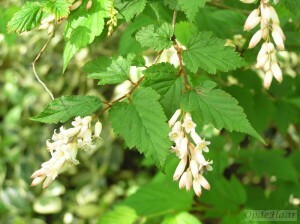 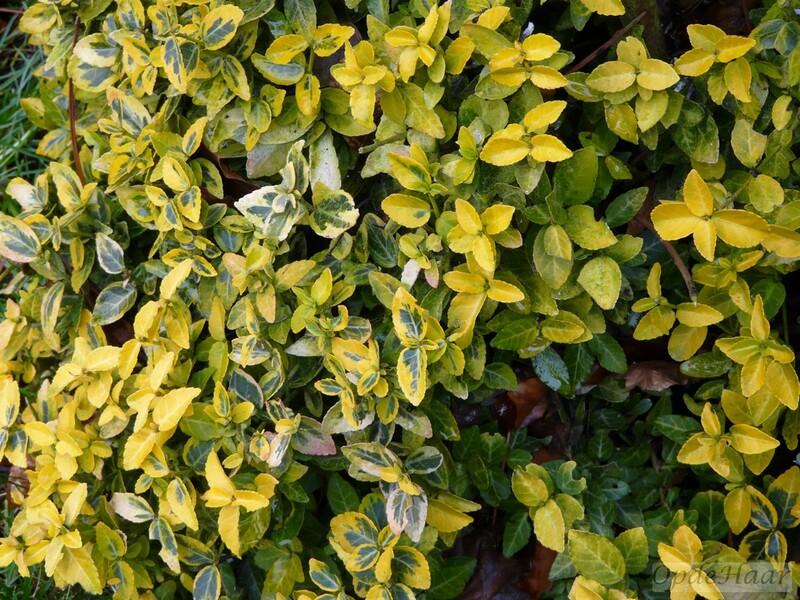 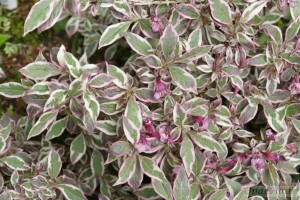 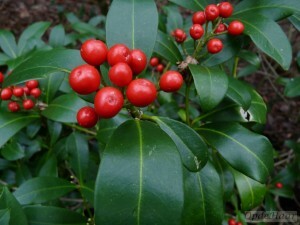 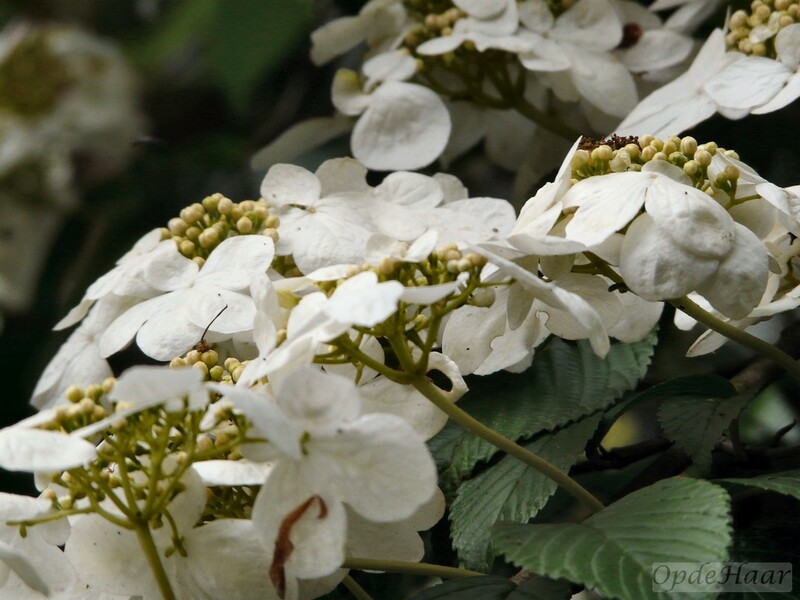 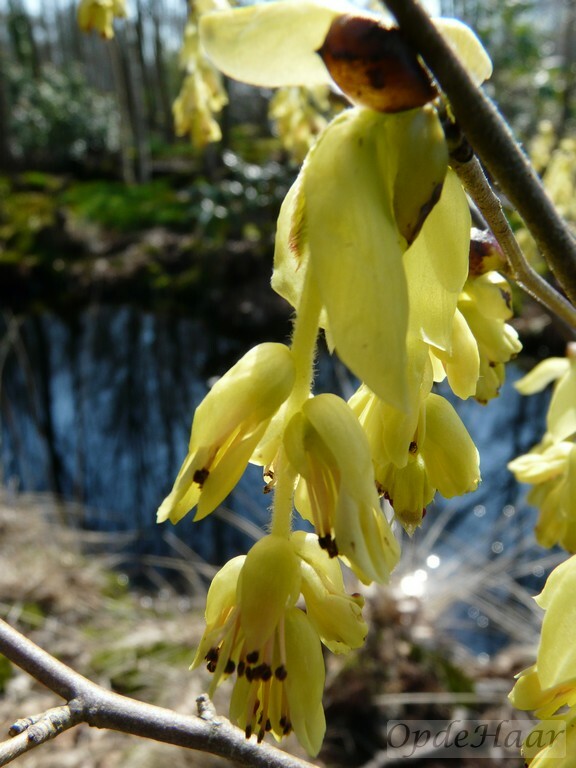 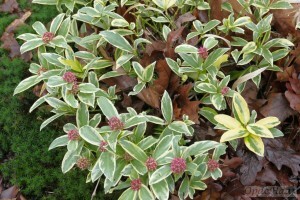 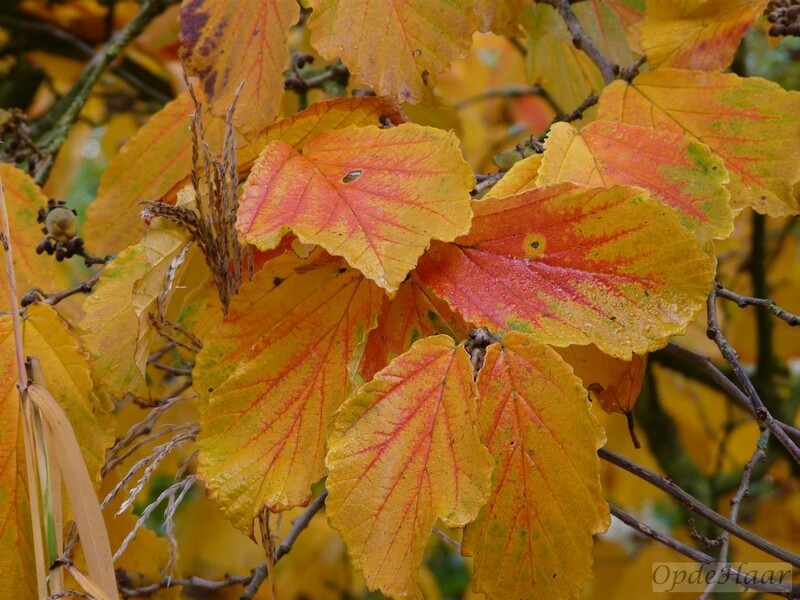 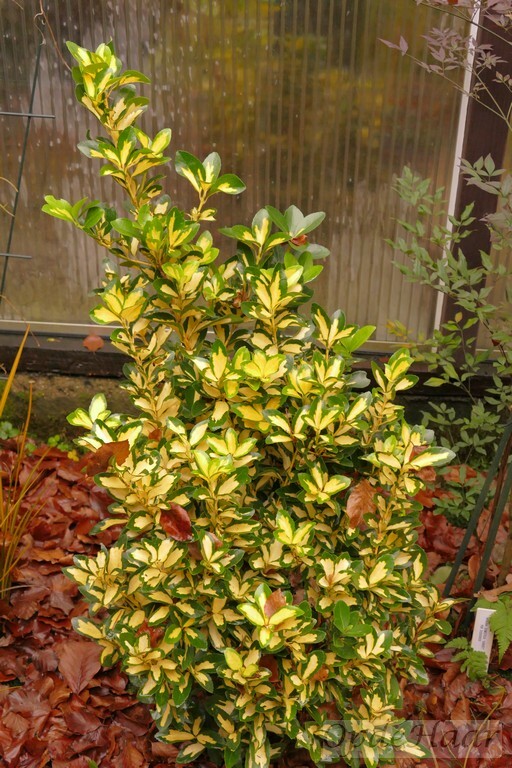 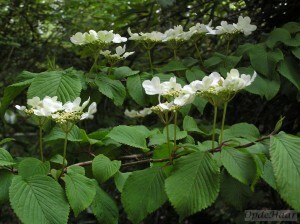 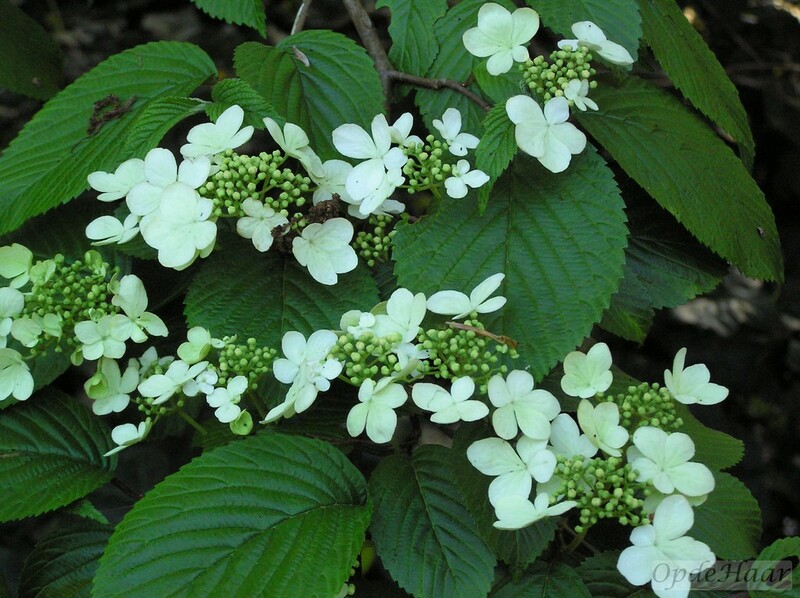 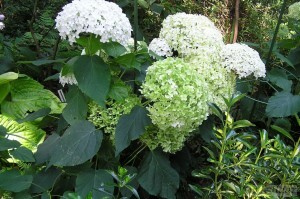 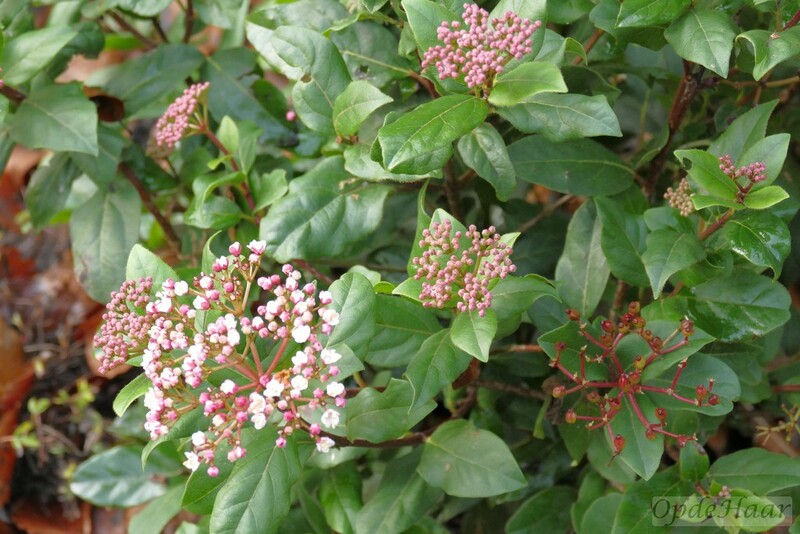 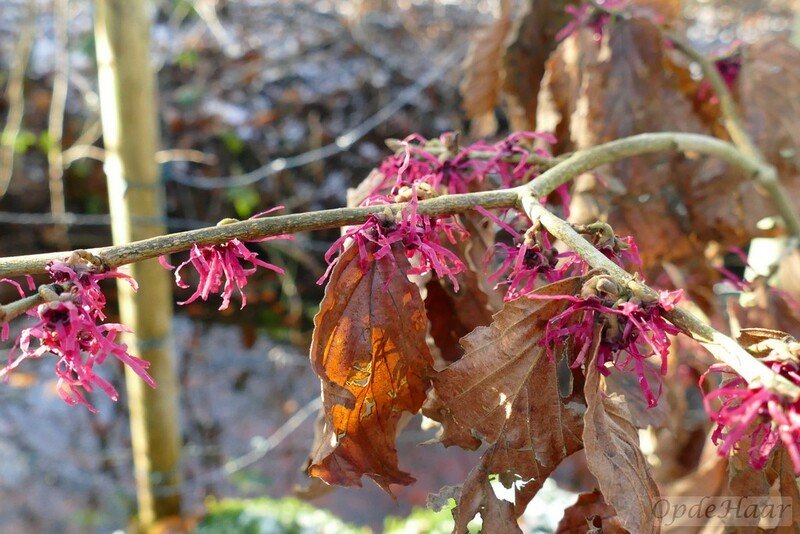 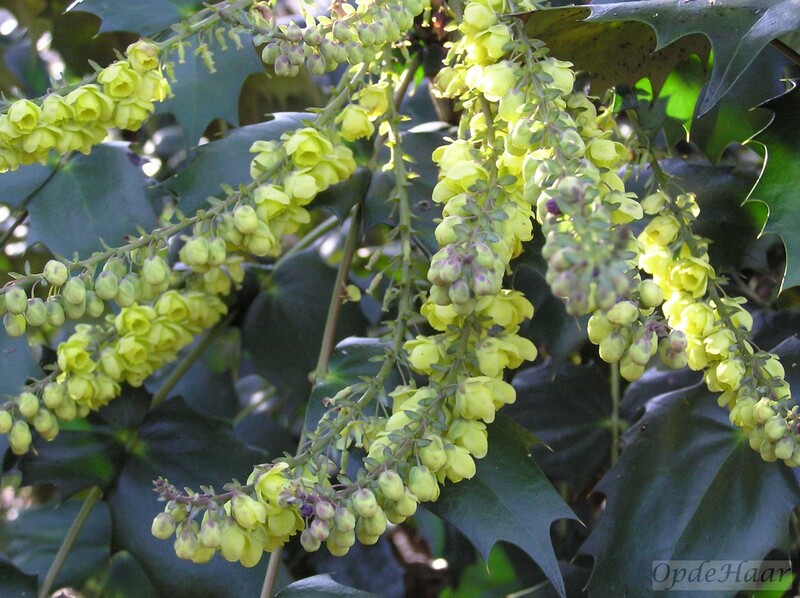 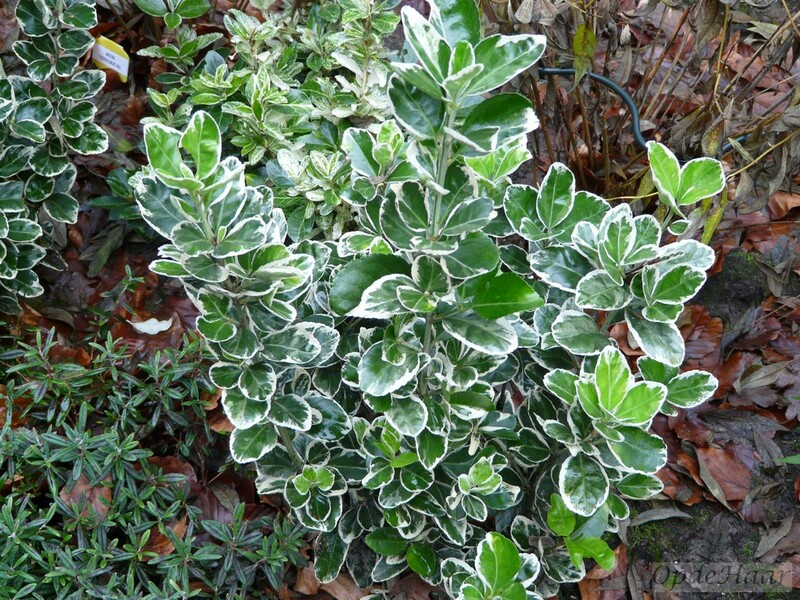 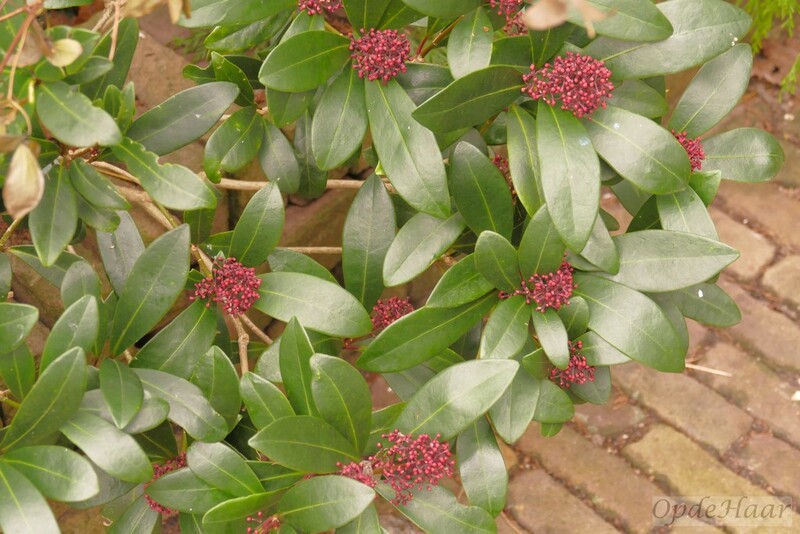 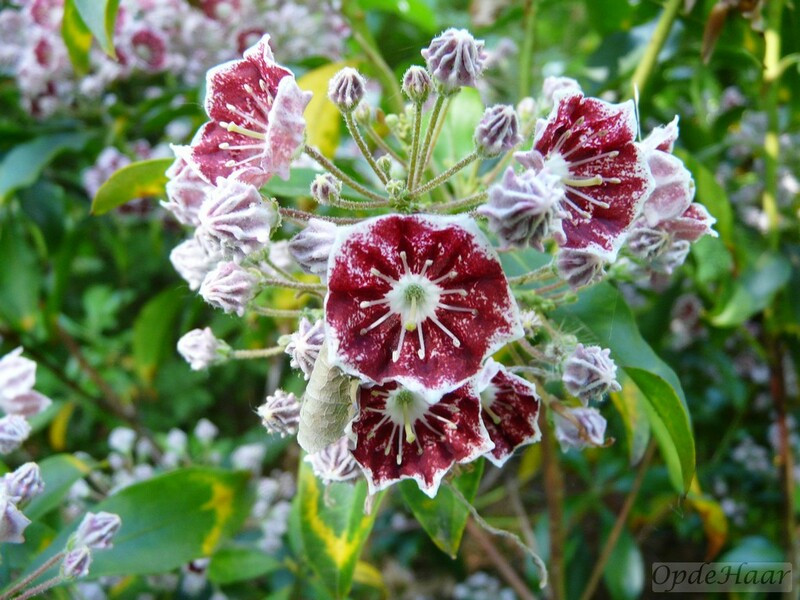 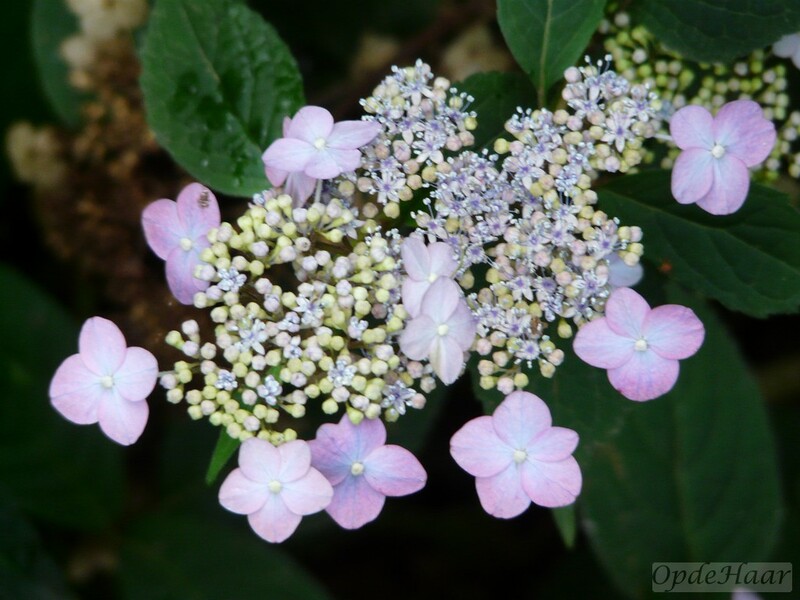 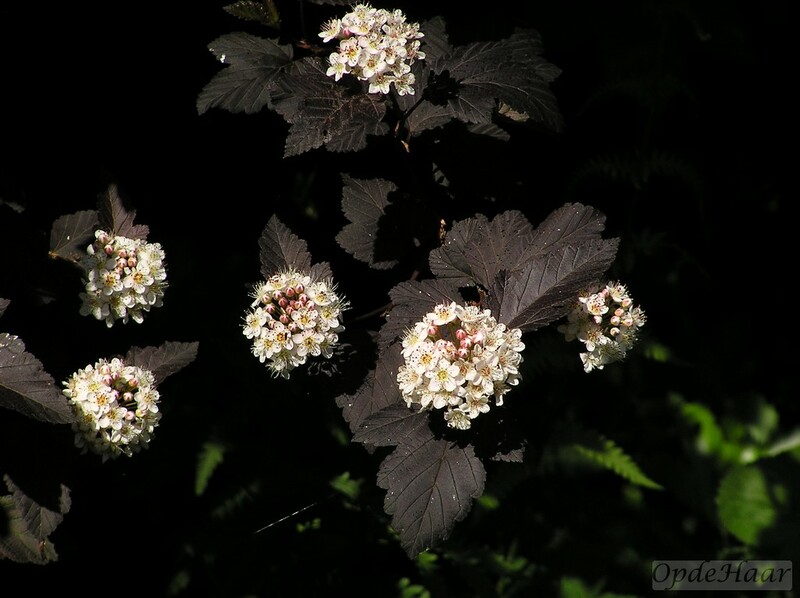 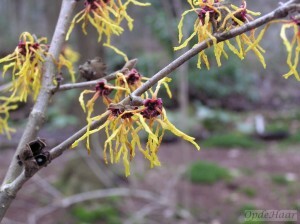 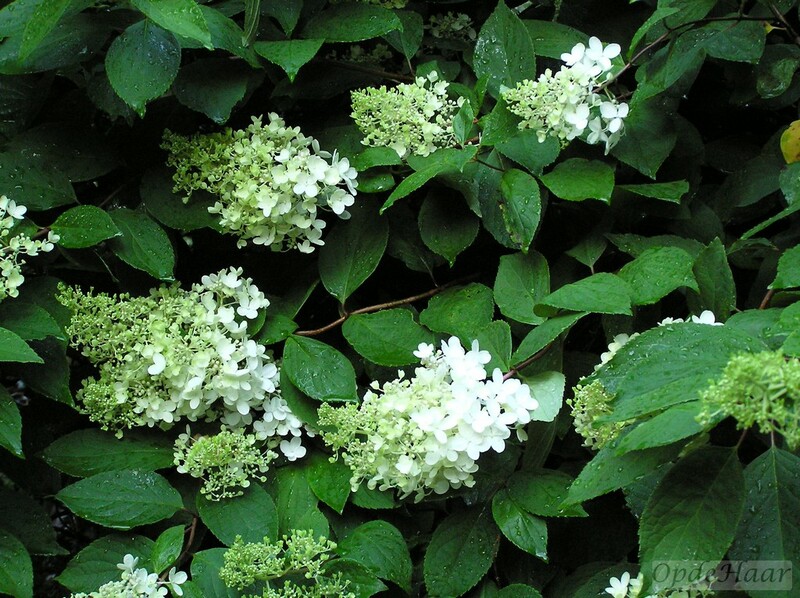 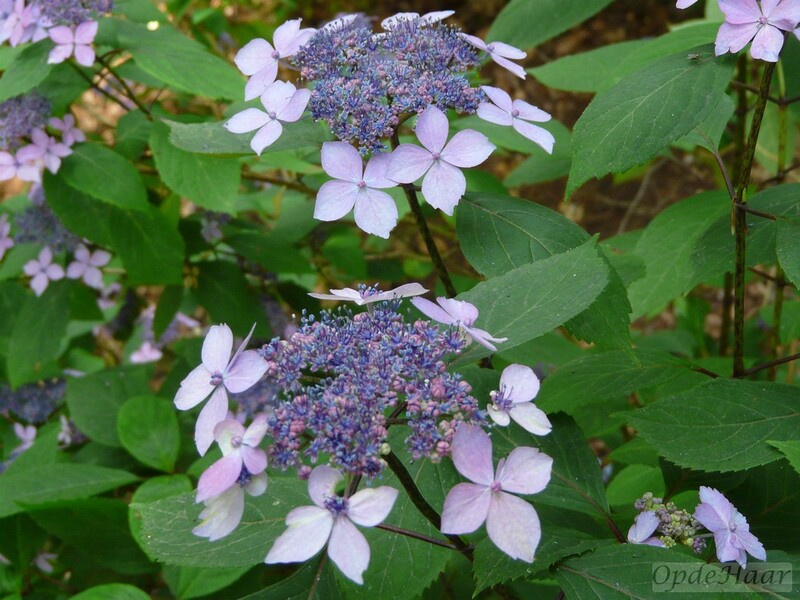 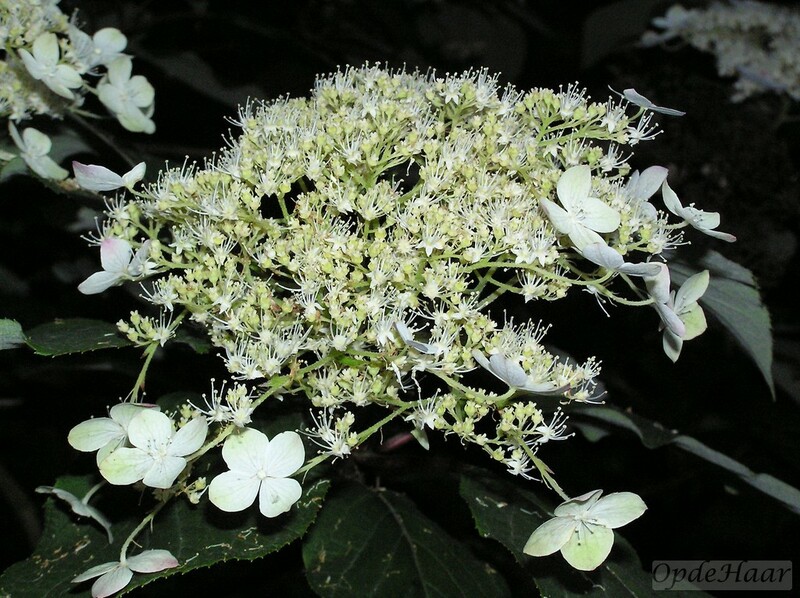 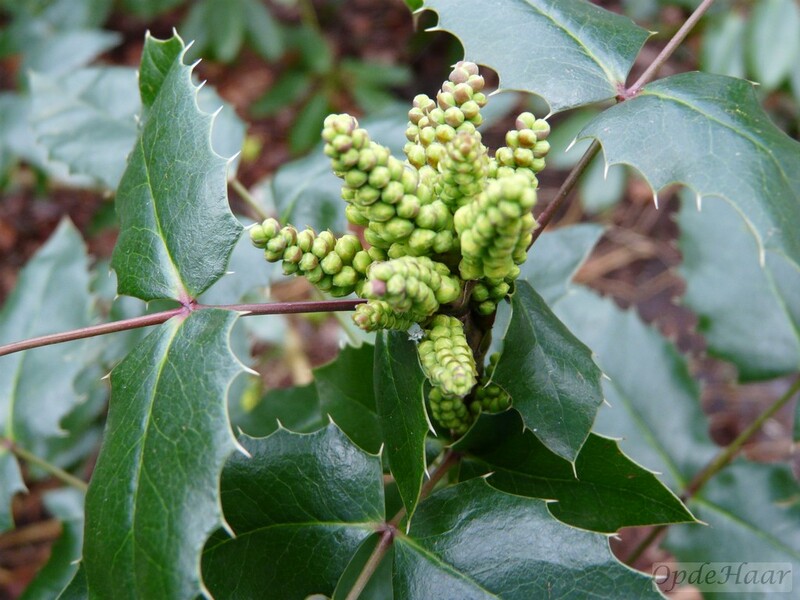 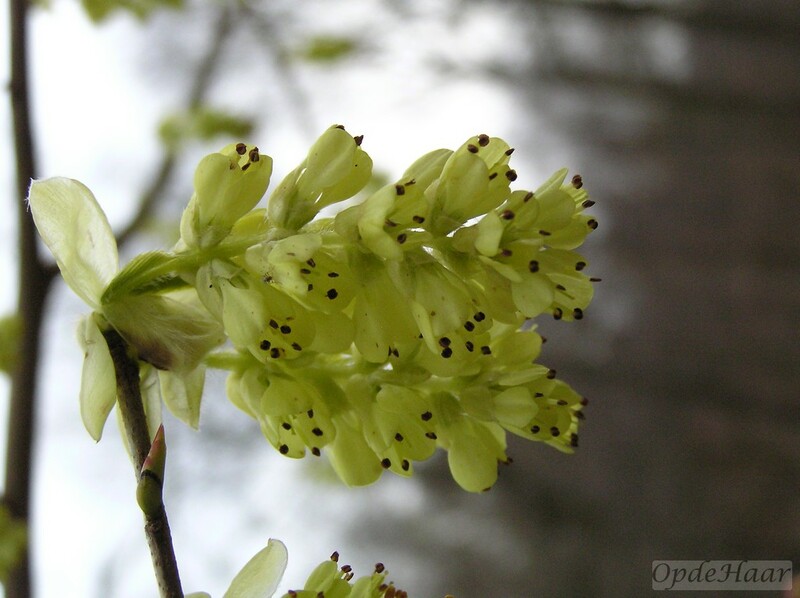 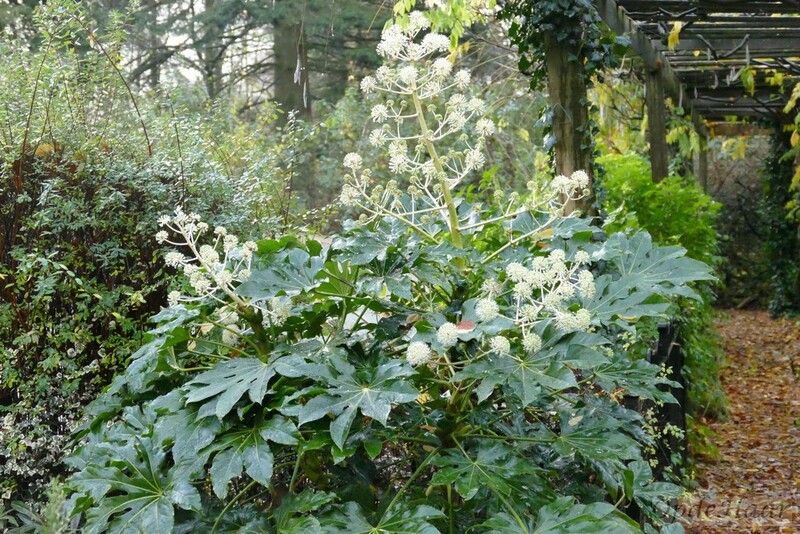 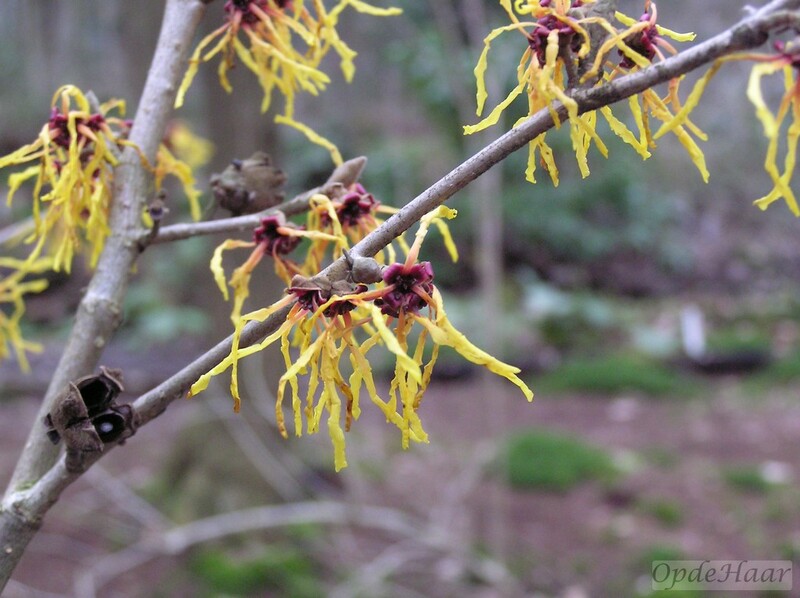 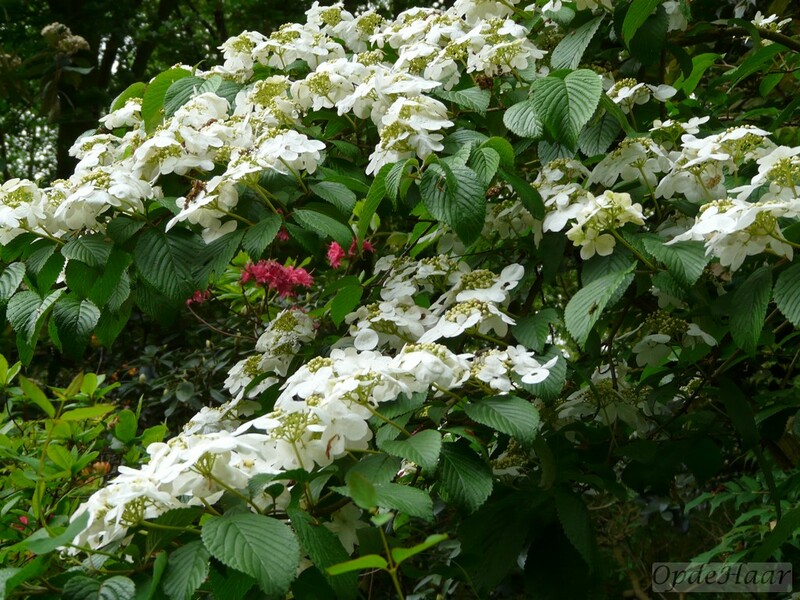 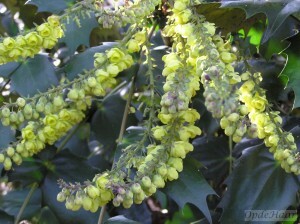 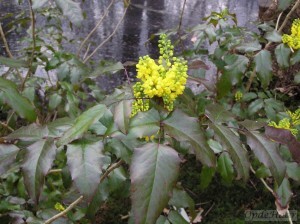 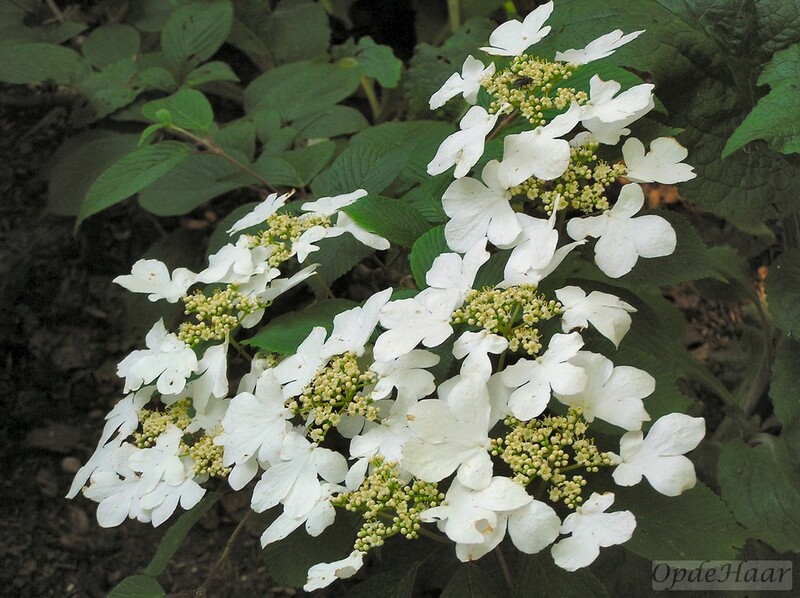 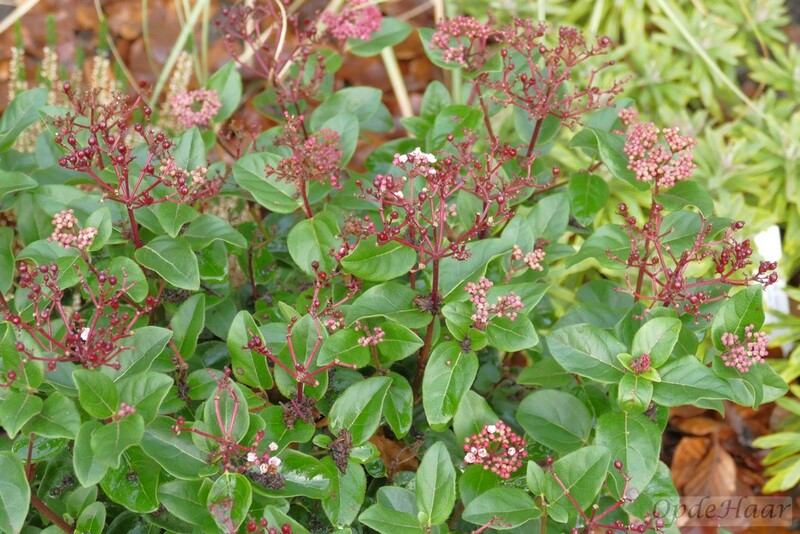 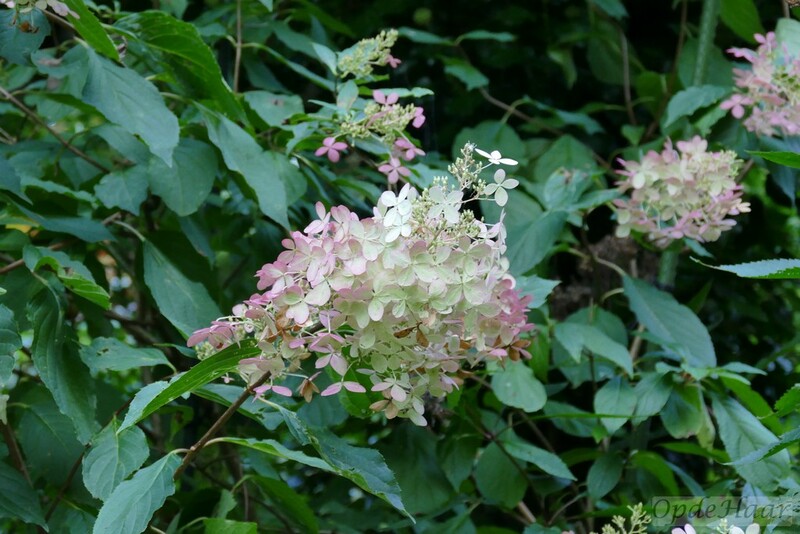 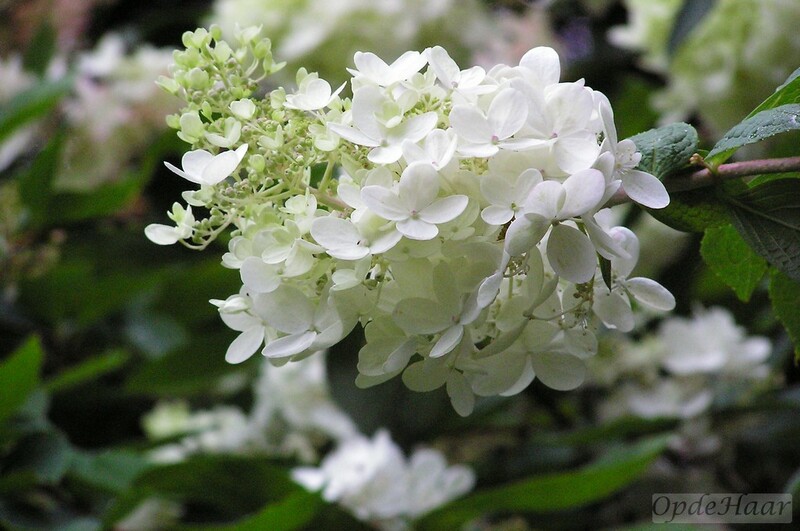 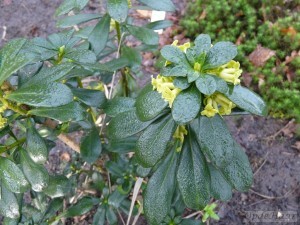 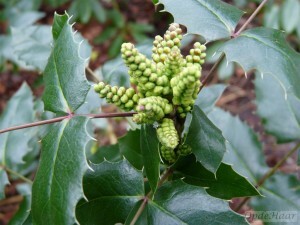 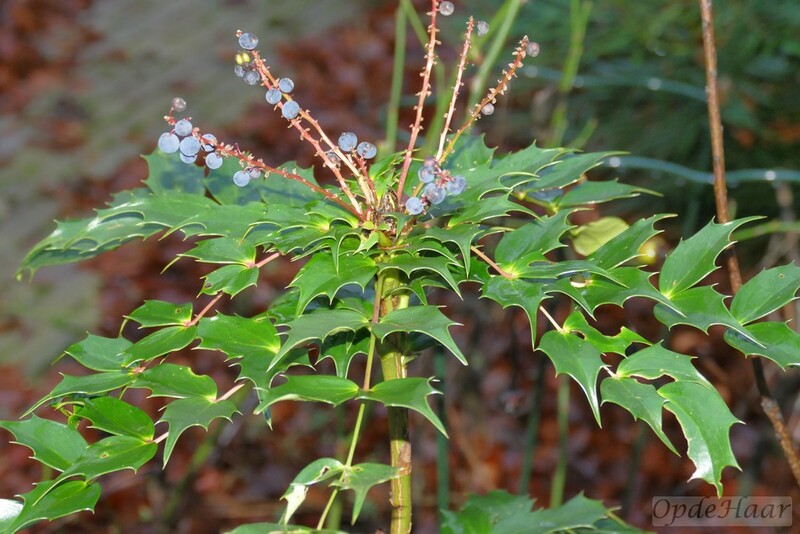 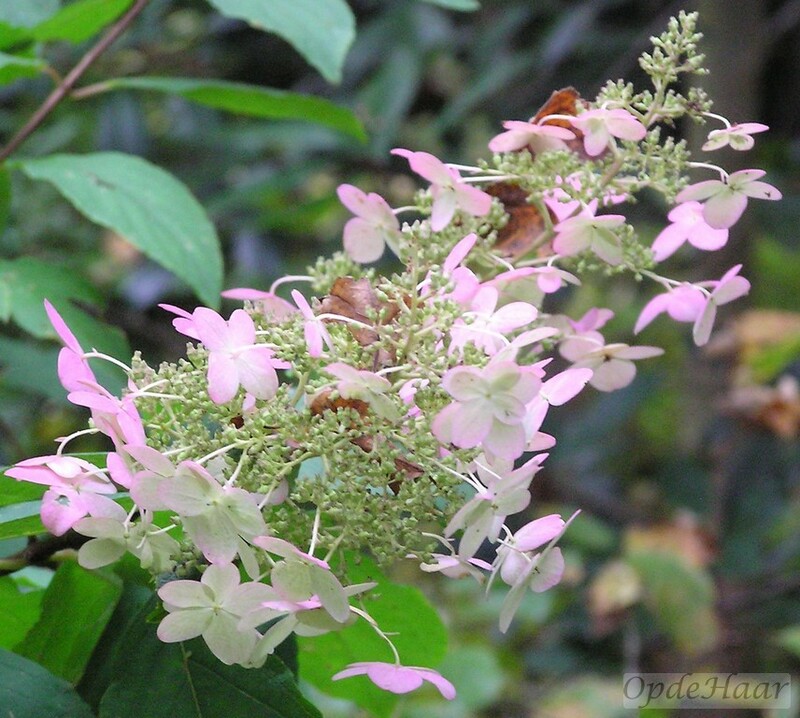 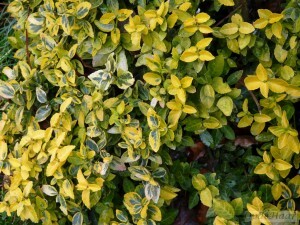 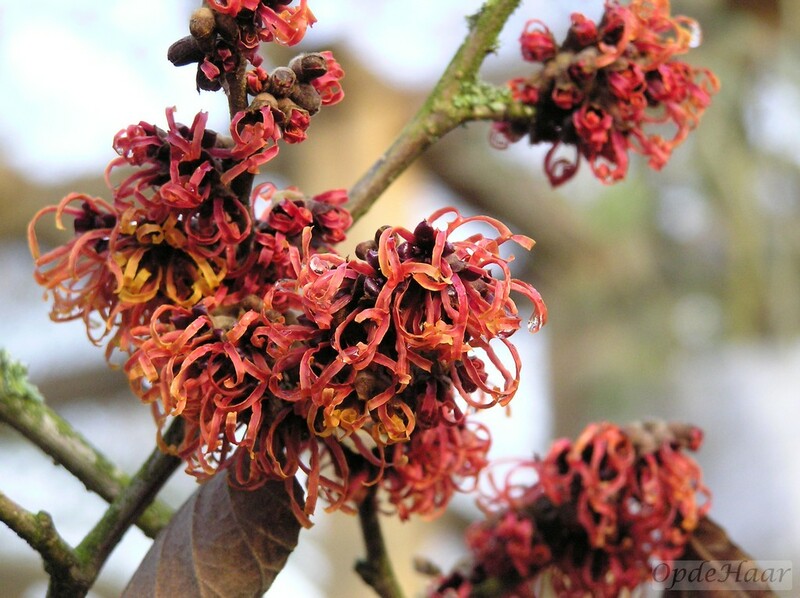 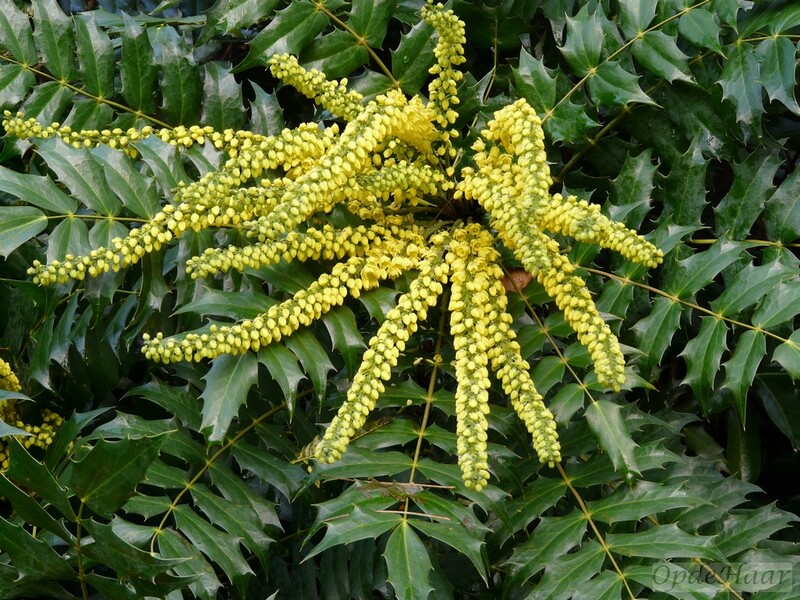 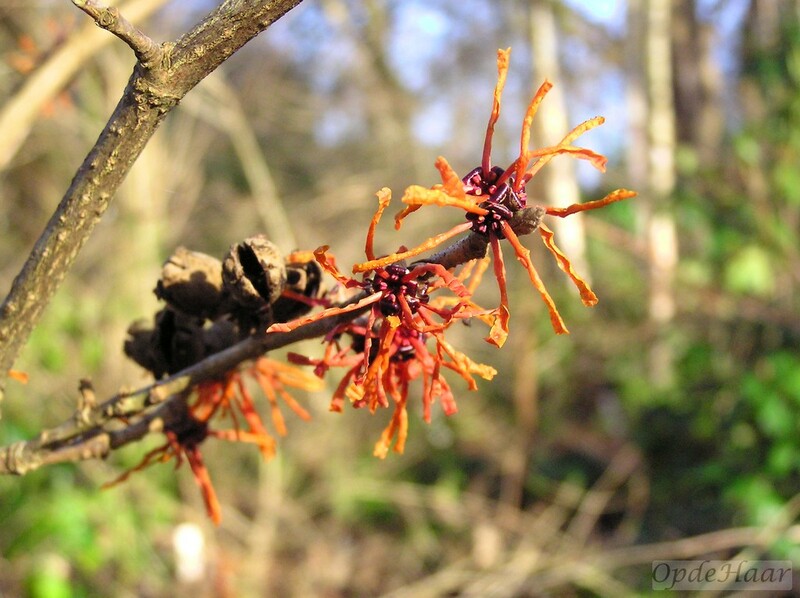 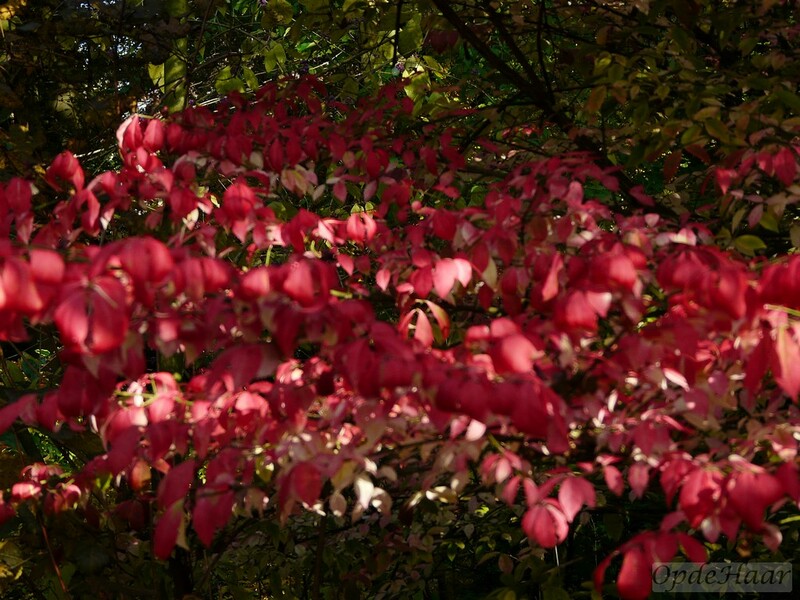 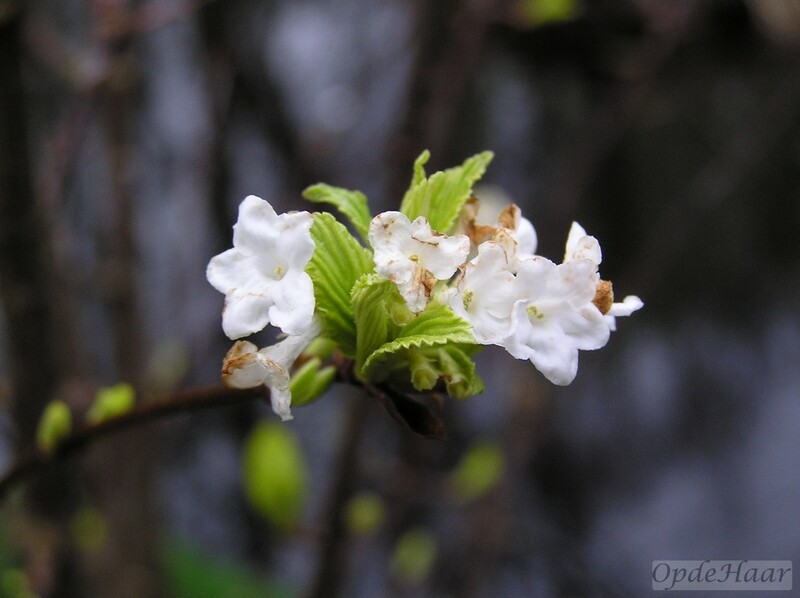 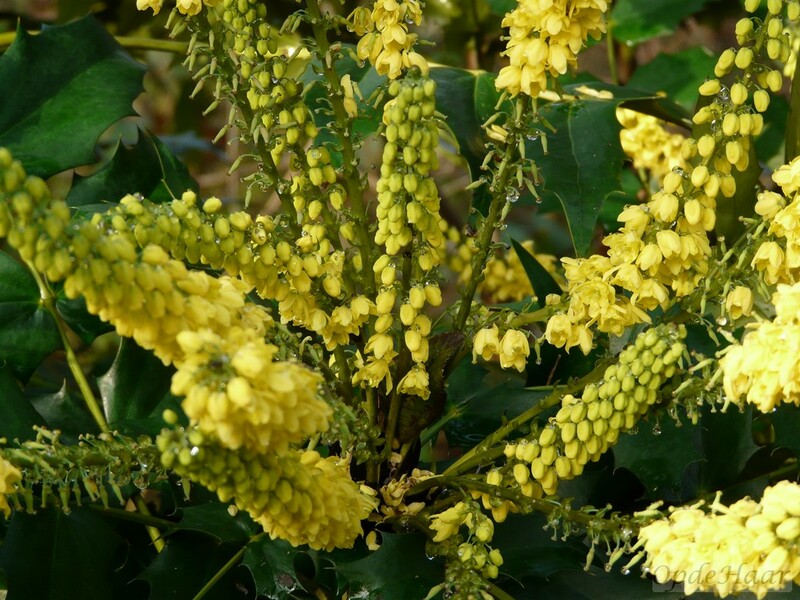 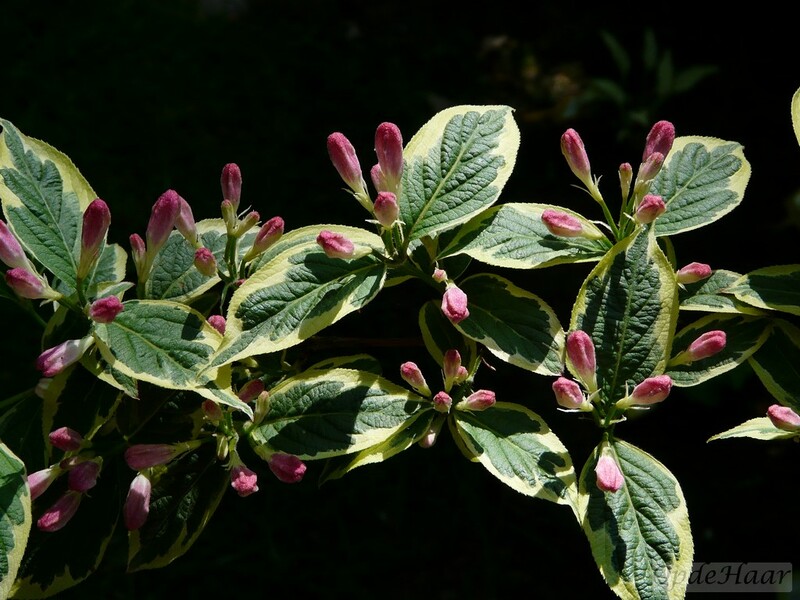 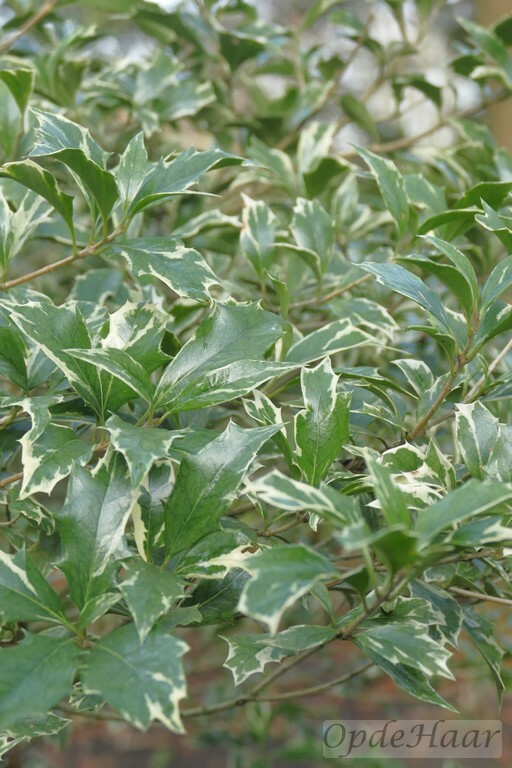 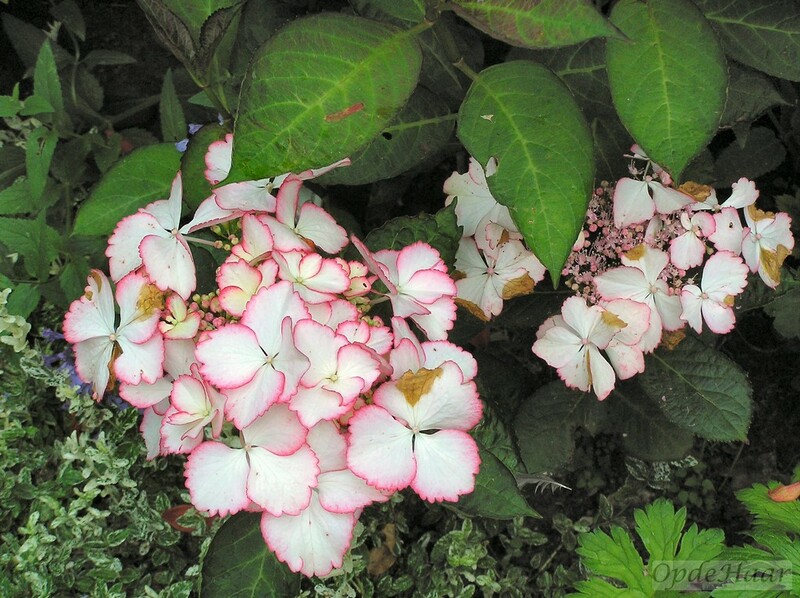 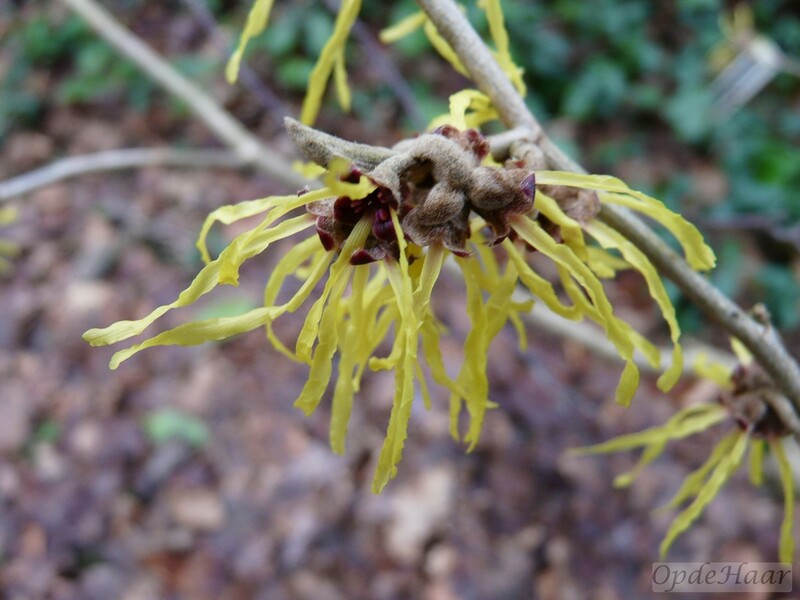 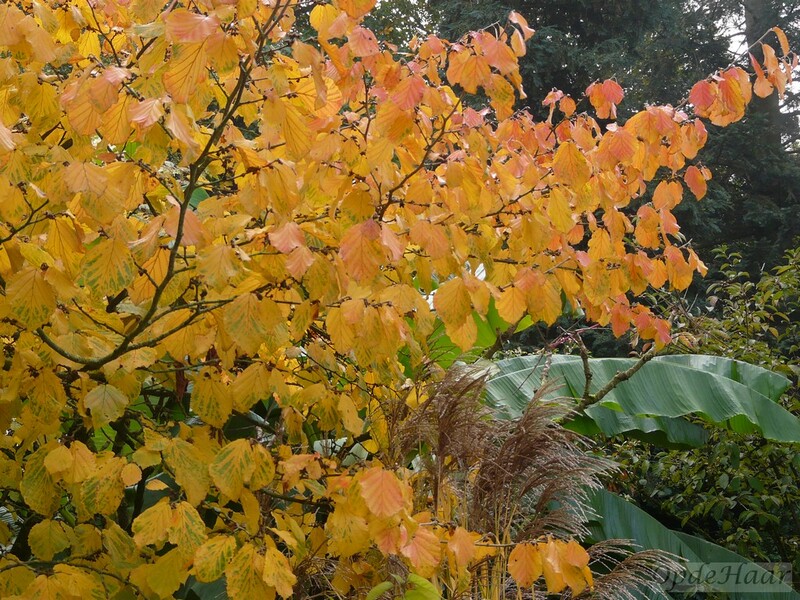 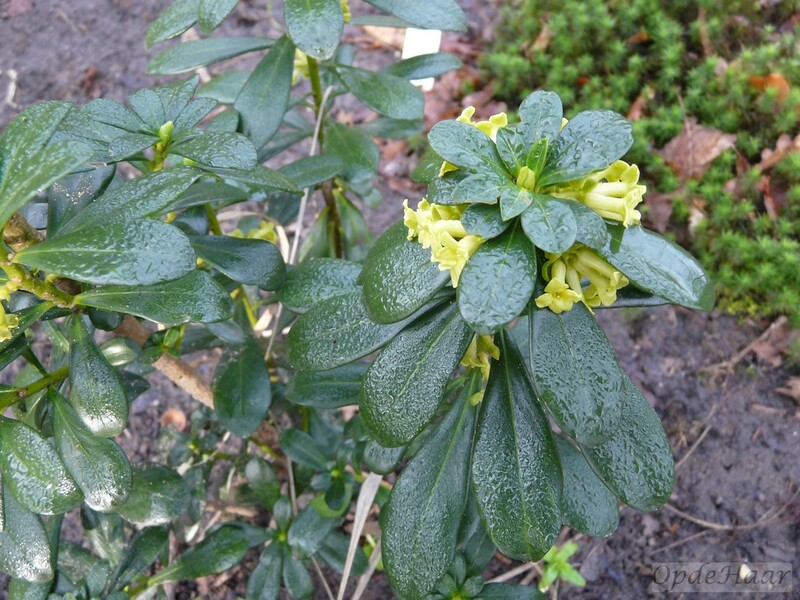 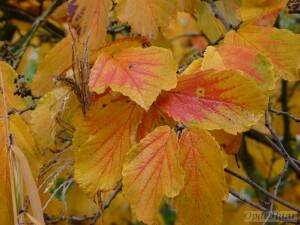 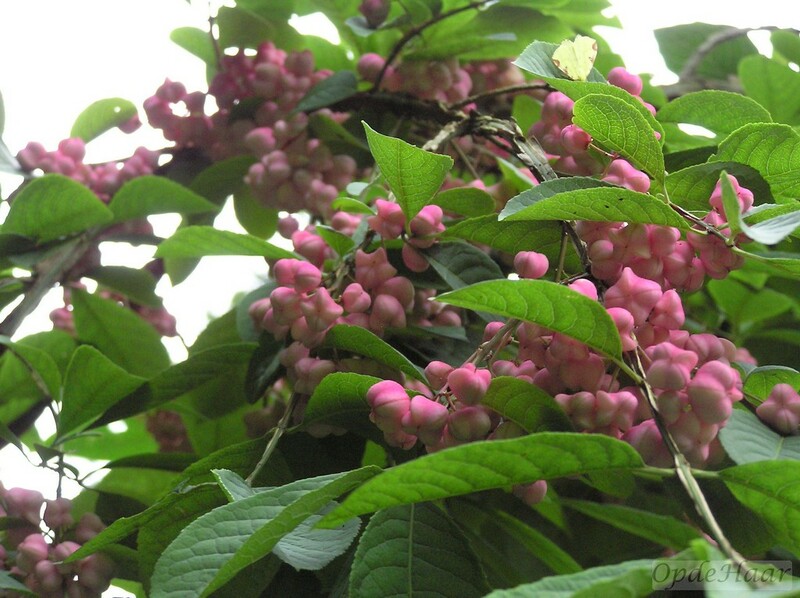 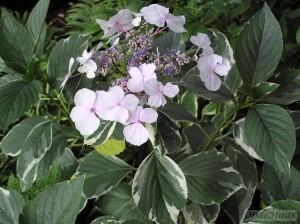 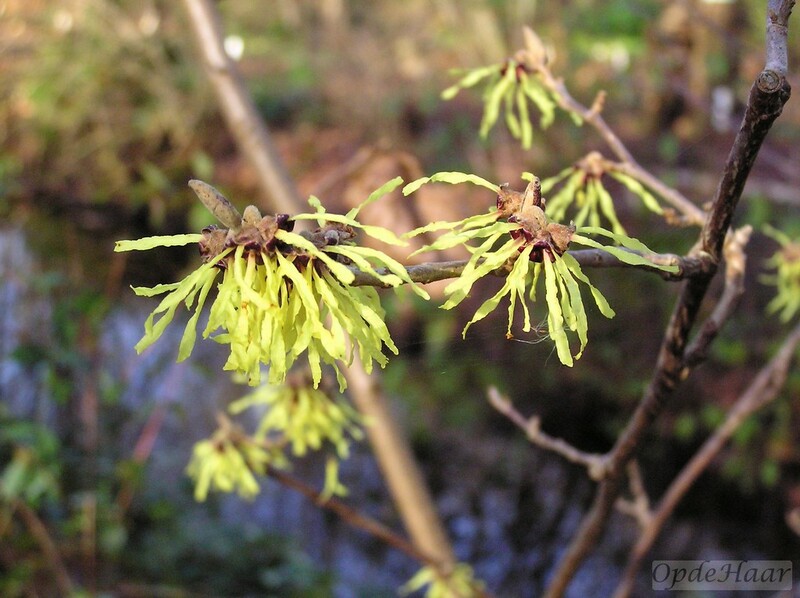 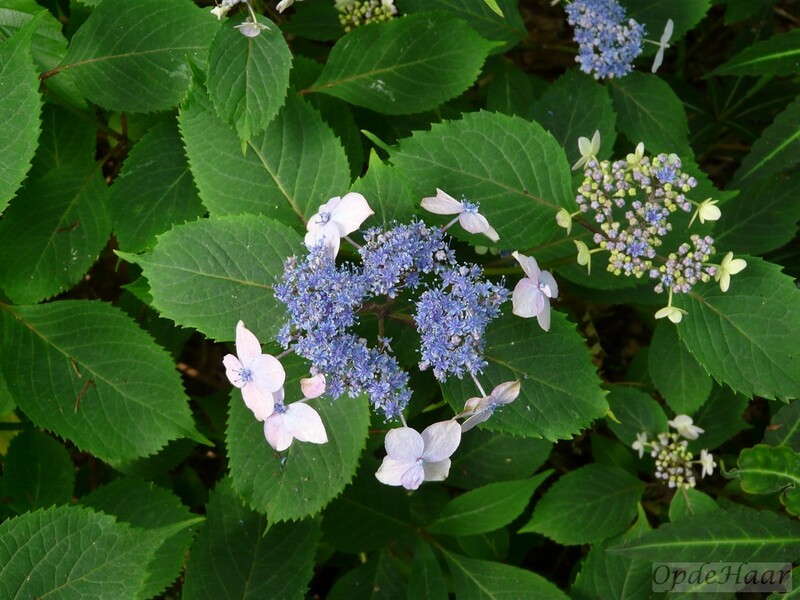 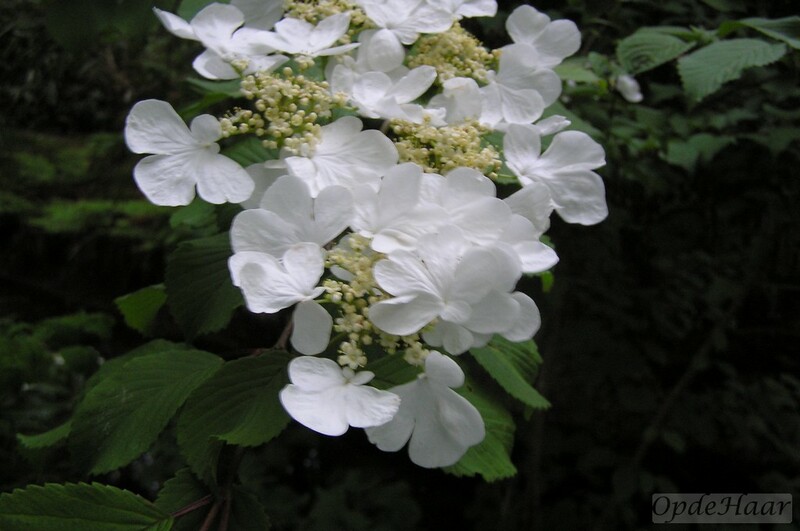 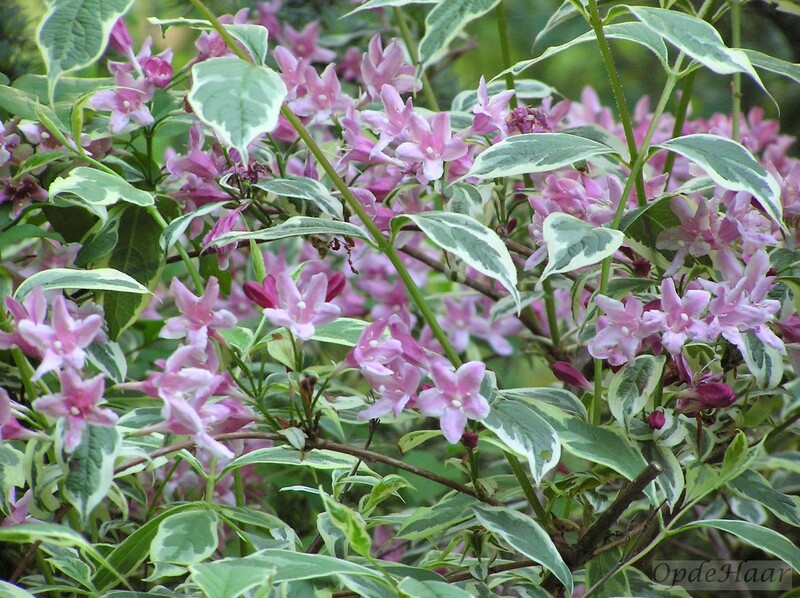 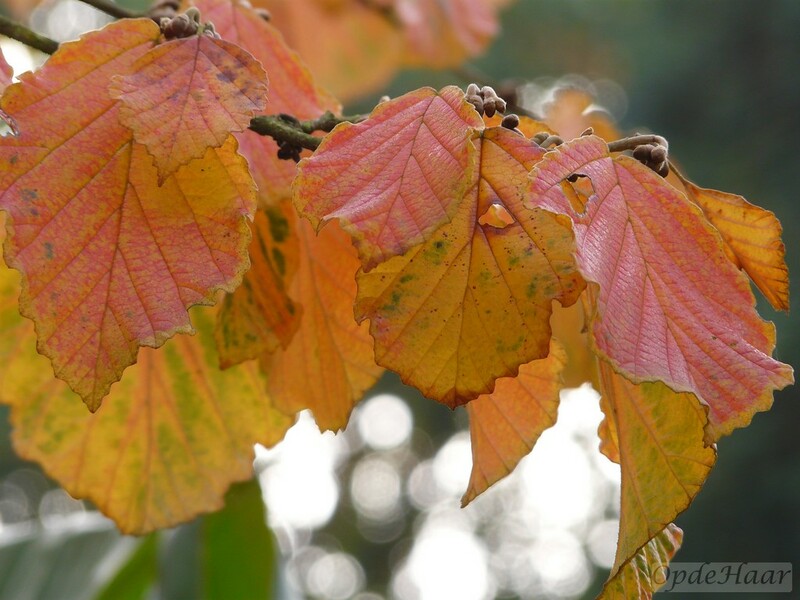 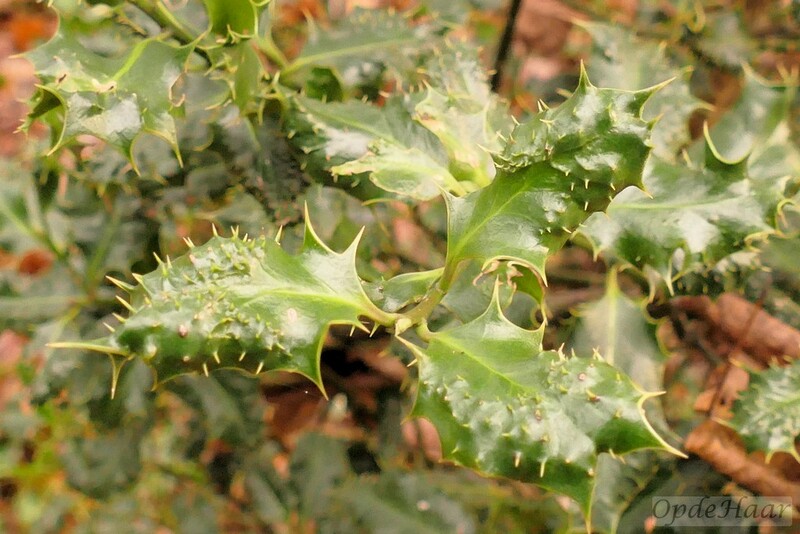 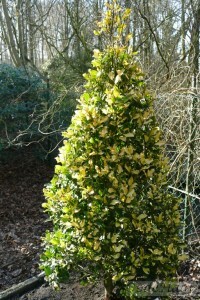 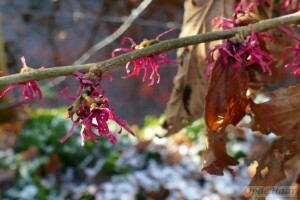 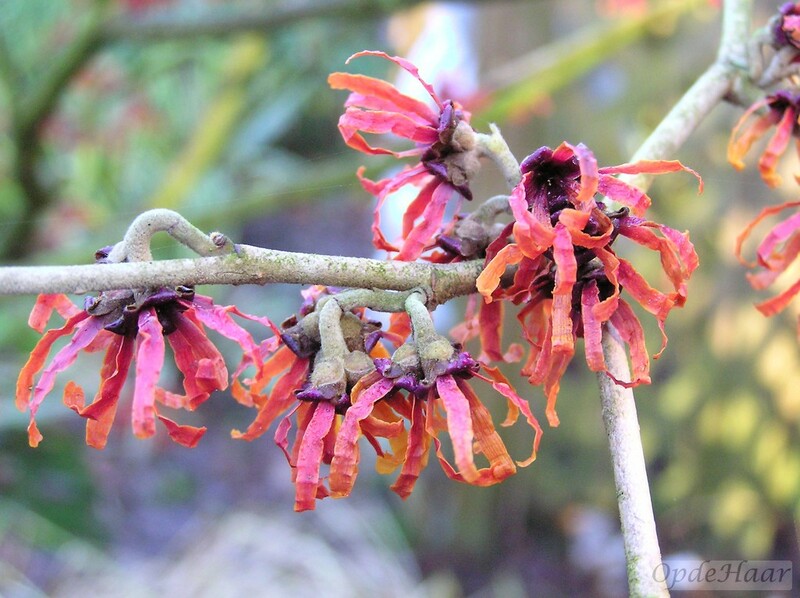 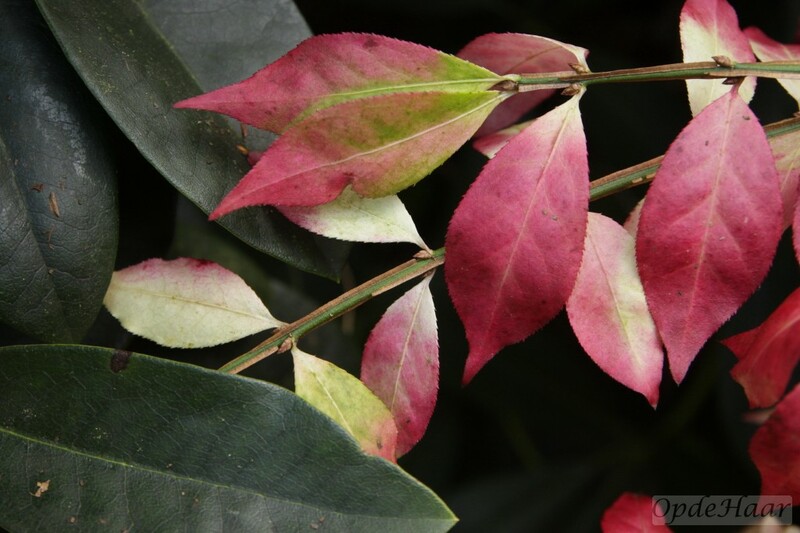 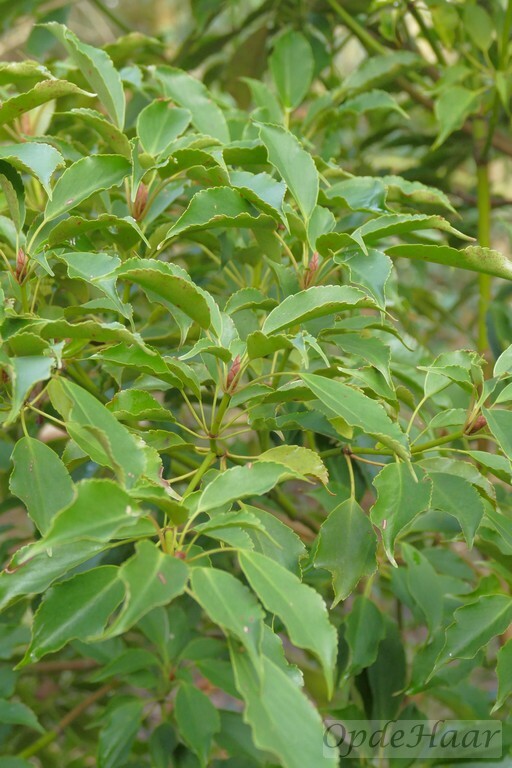 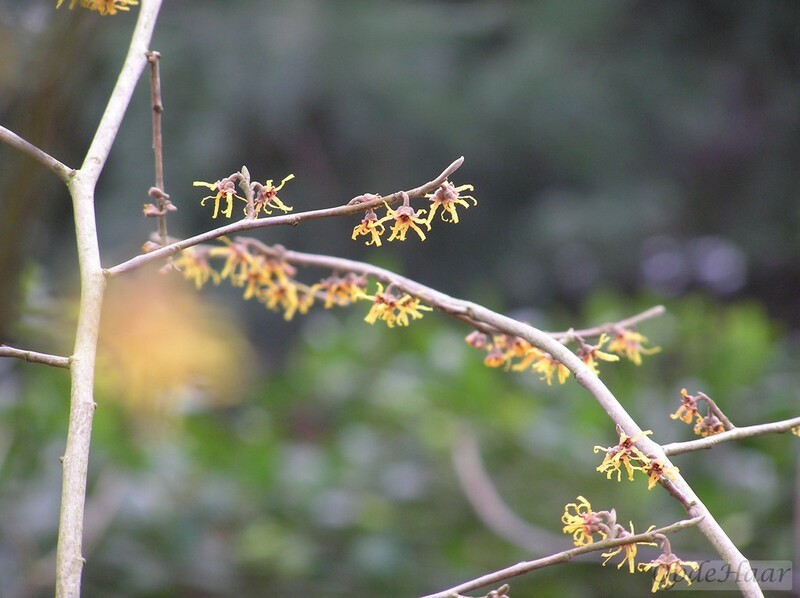 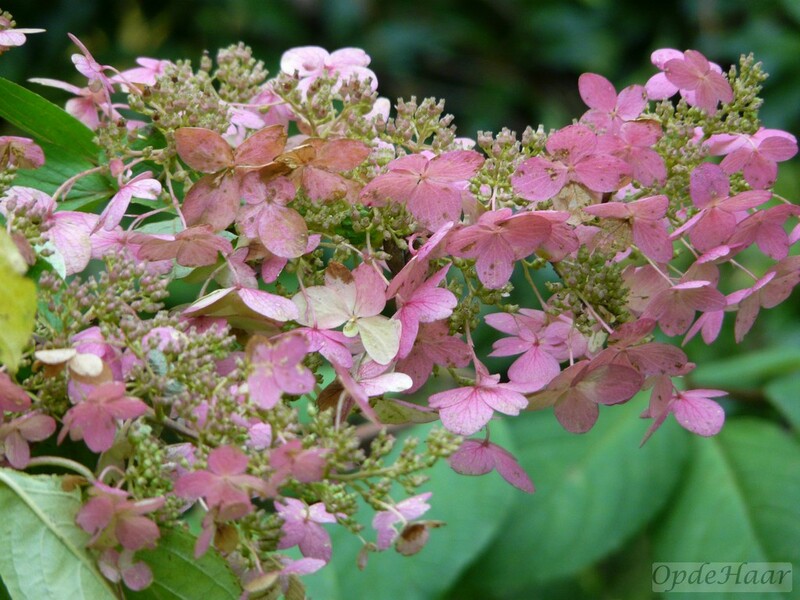 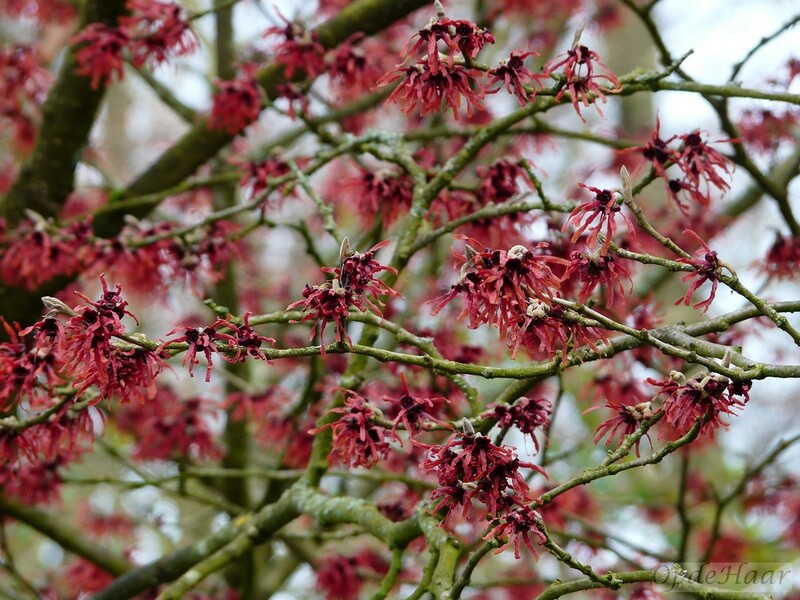 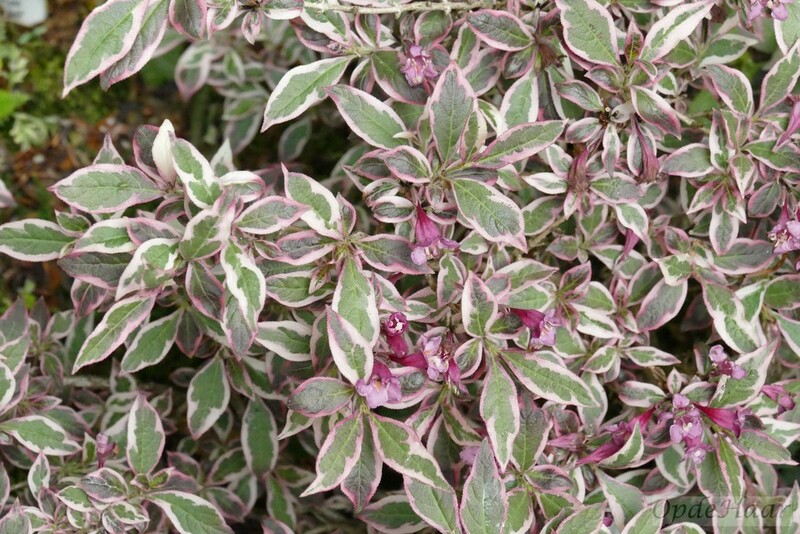 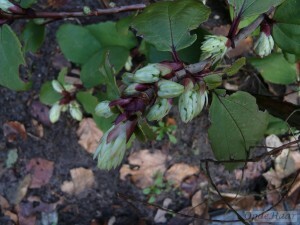 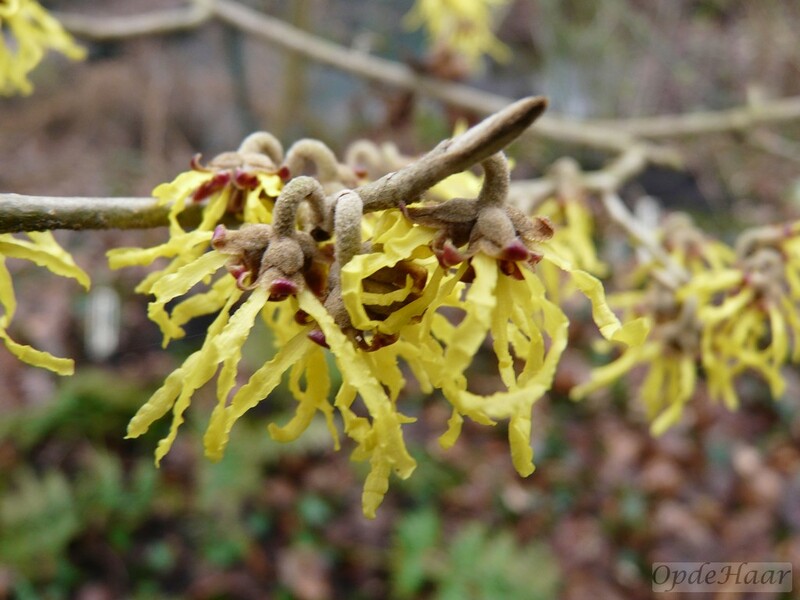 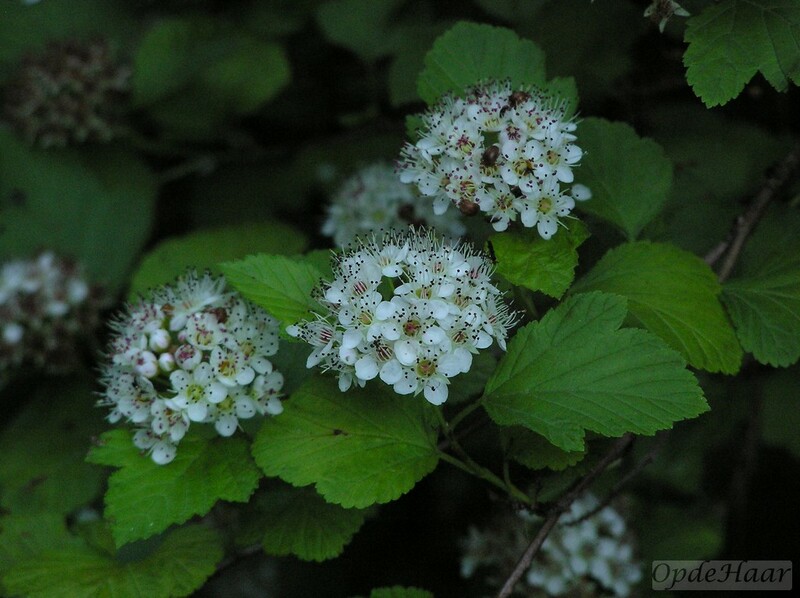 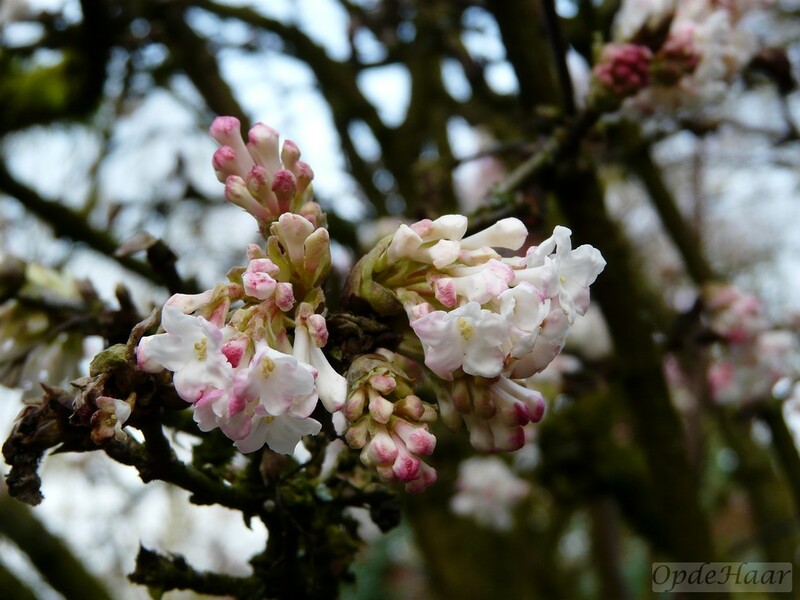 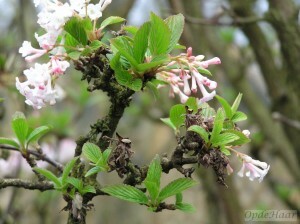 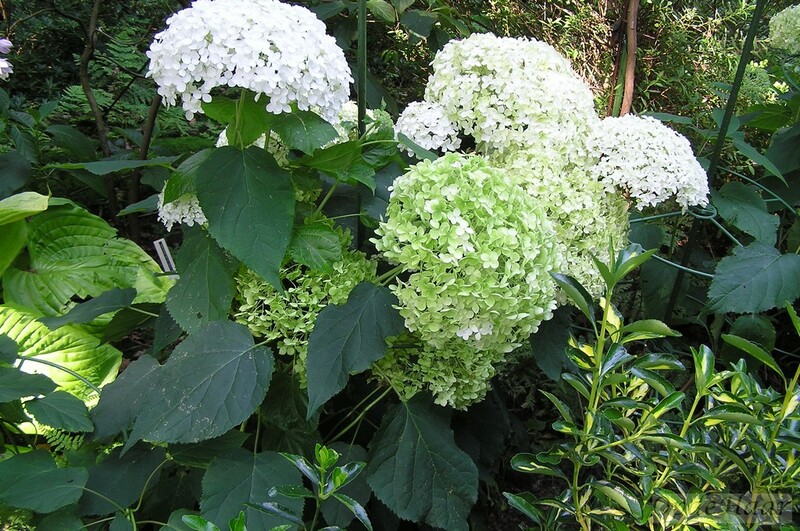 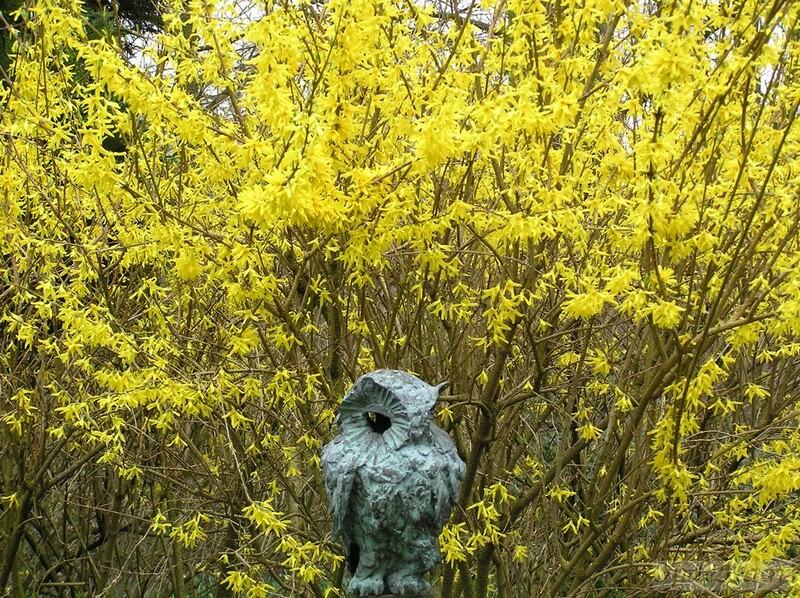 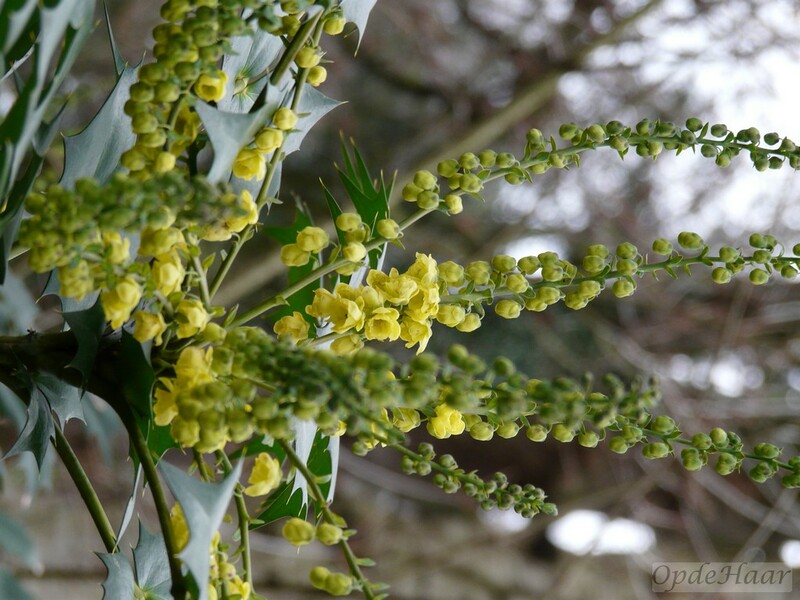 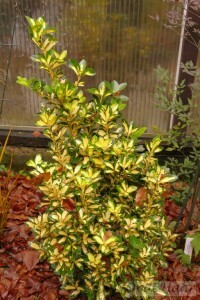 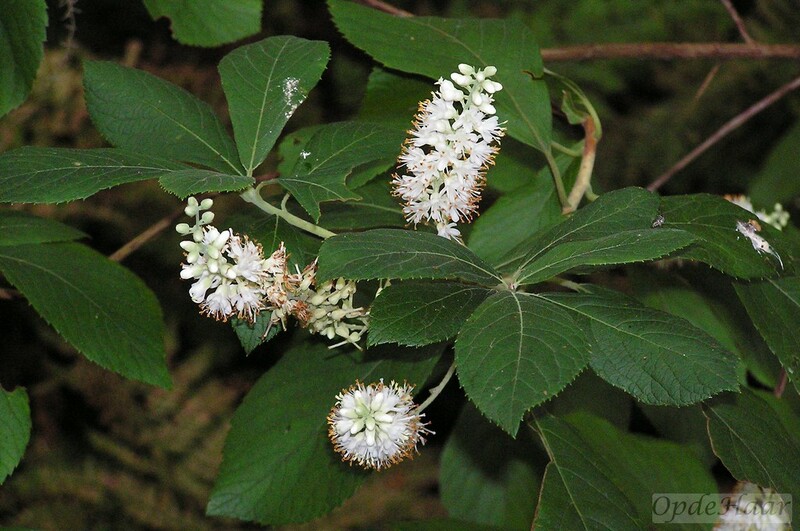 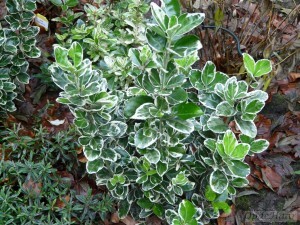 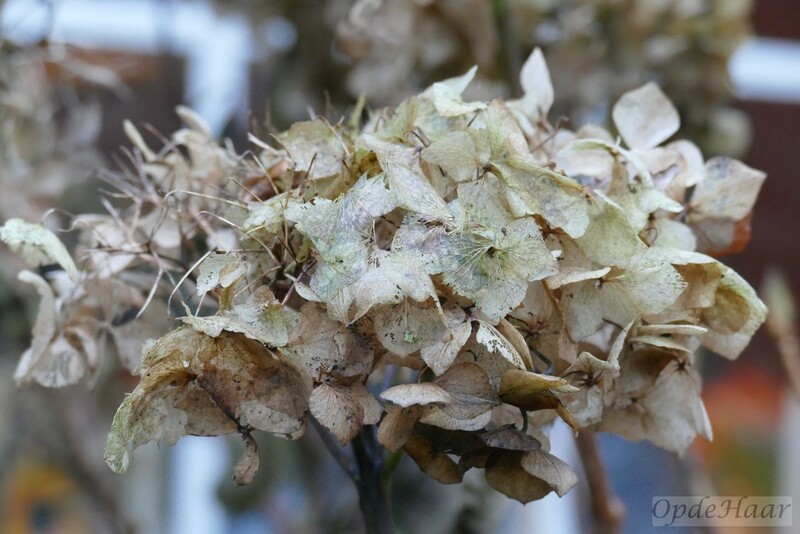 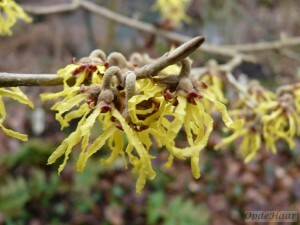 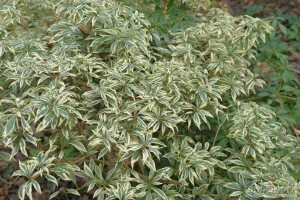 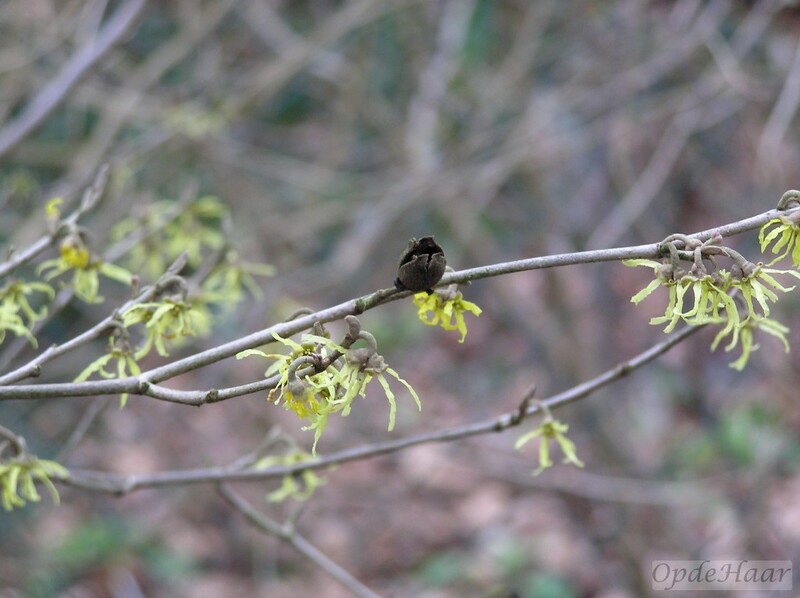 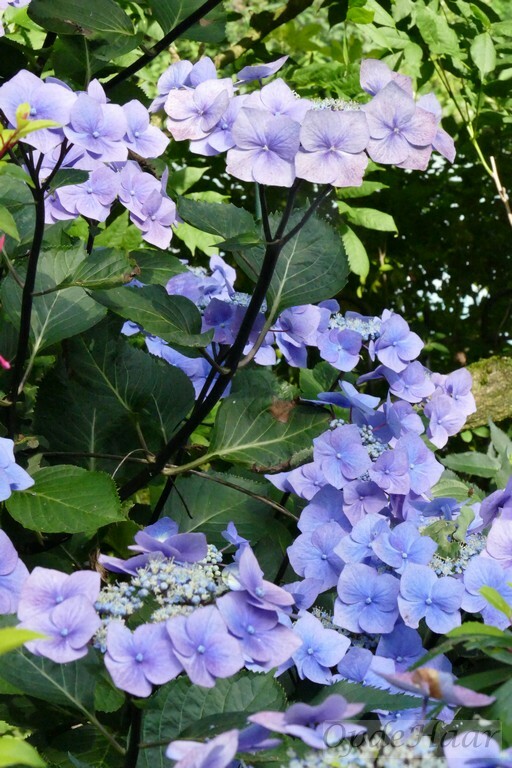 On this page you will find information about and photos of the following shrubs: clethra, corylopsis, daphne, euonymus, fatsia, hamamelis, hibiscus, hydrangea, ilex(holly), kalmia, mahonia, pieris, poncirus, roses, sarcococca, skimmia, weigela en viburnum . 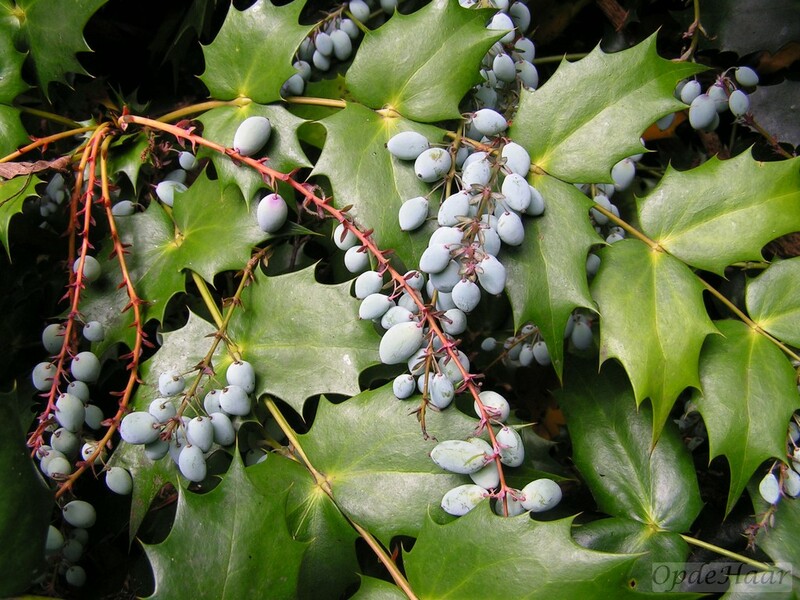 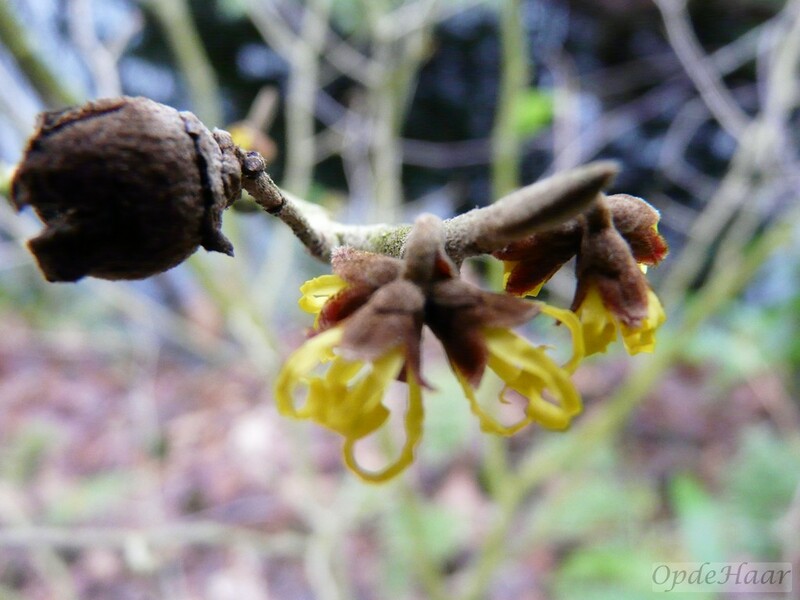 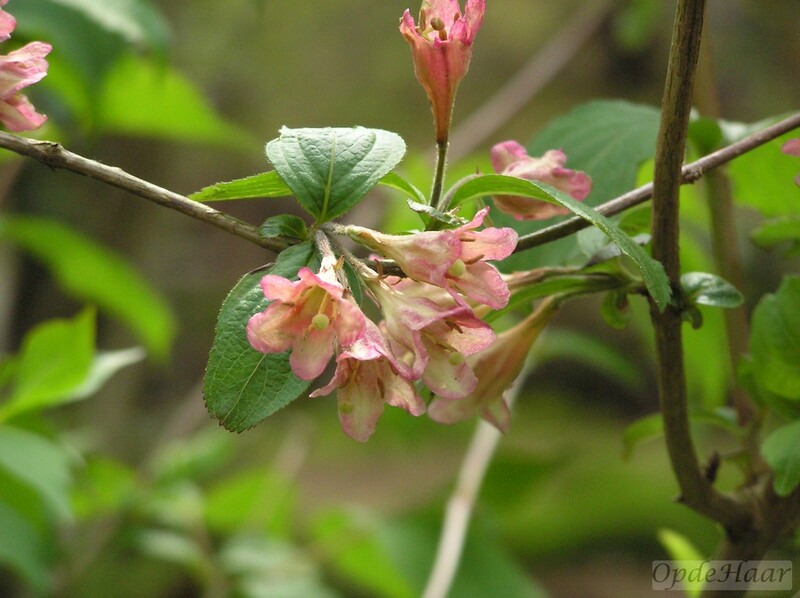 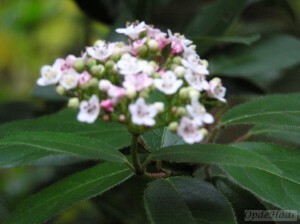 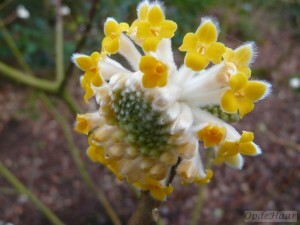 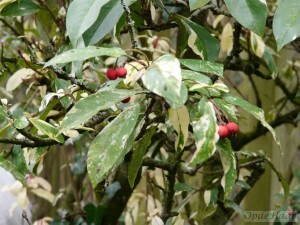 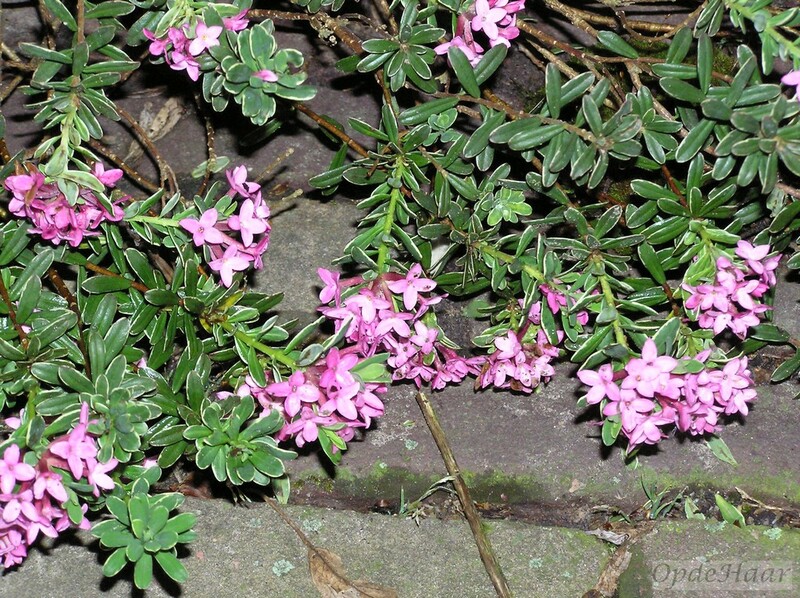 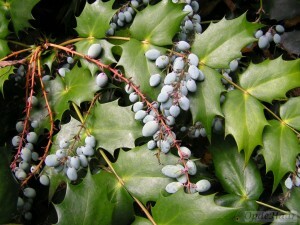 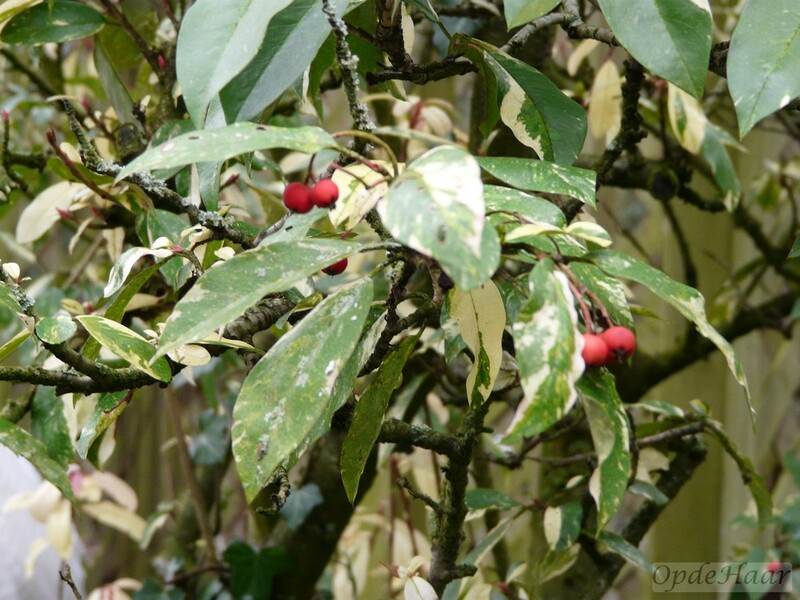 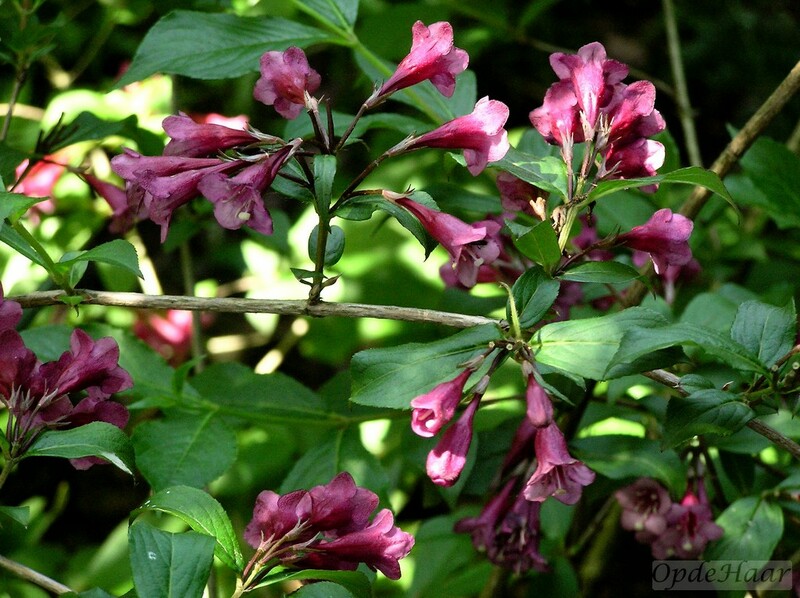 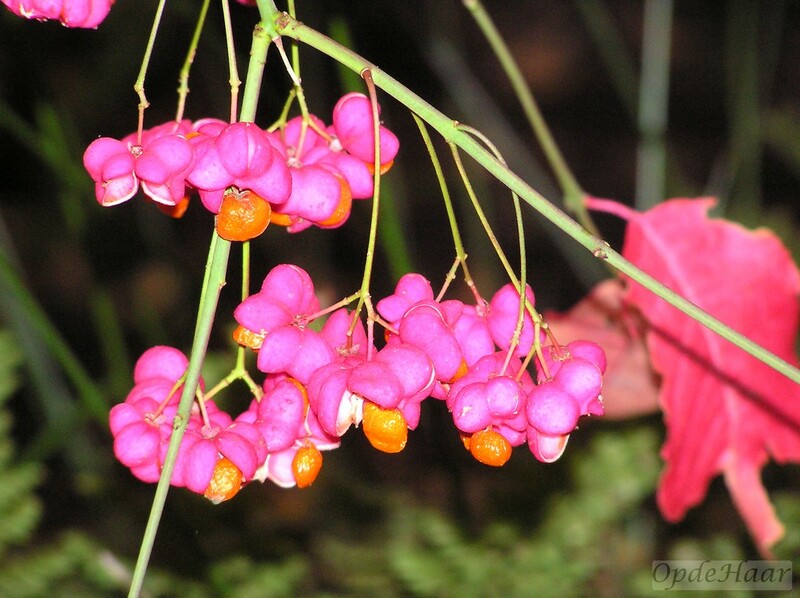 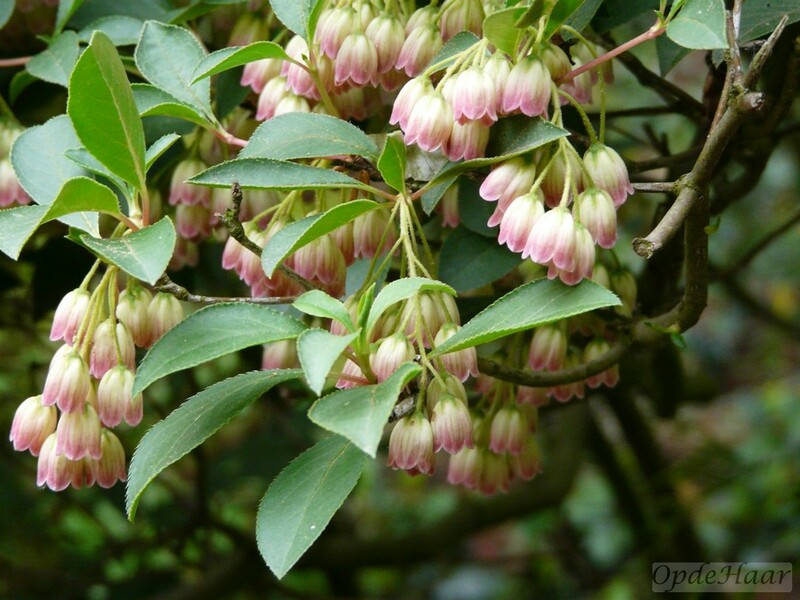 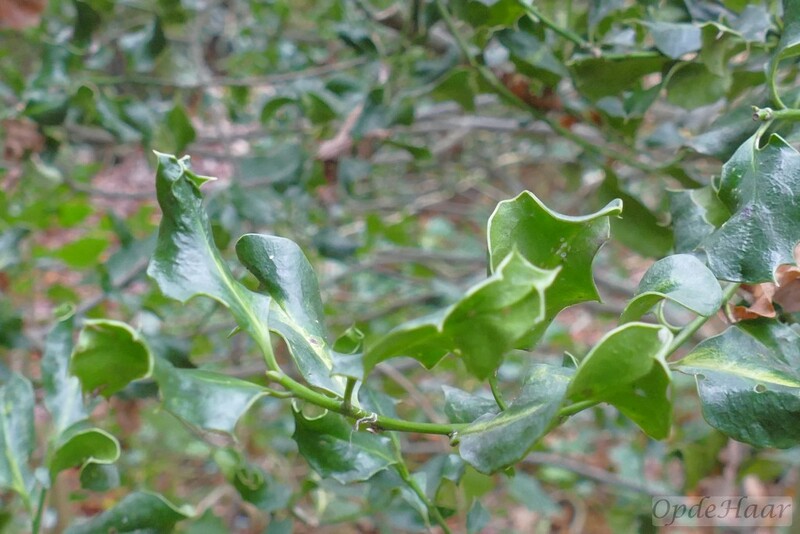 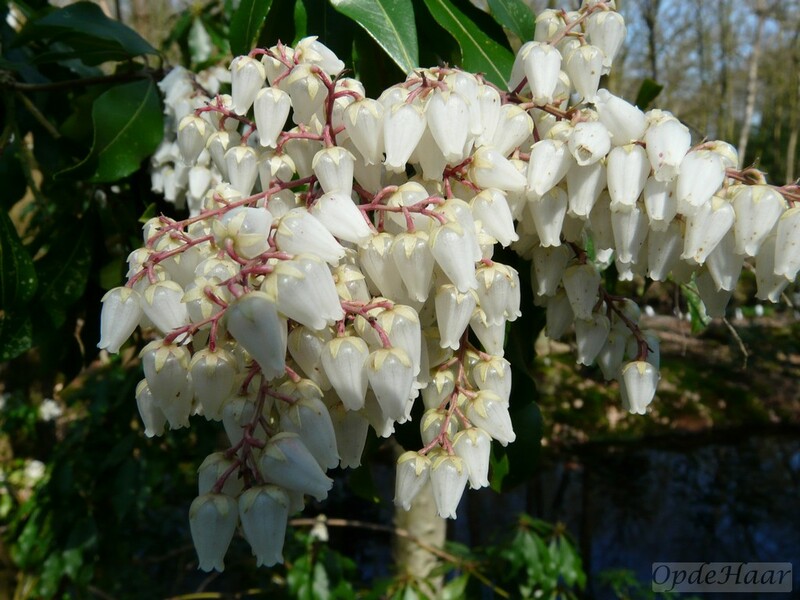 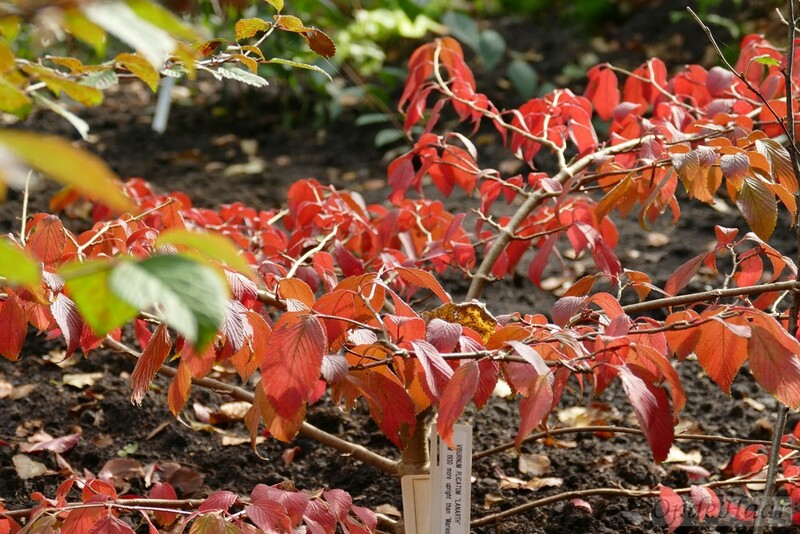 Under Miscellaneous there are also photos of the following shrubs: abelia, arbutus, aucuba, berberis, callicarpa, caryopteris, ceratostigma,chaenomele, chimonanthus, choisya, cornus, cotinus, cytisus, edgeworthia, eleagnus, enkianthus, euonymus, forsythia, gautheria, hovenia, lavatera, leucothoe, leycesteria, nandina, neillia, osmanthus, perovskia, philadelphus, physocarpus, ribes, sambucus, sarcococca, spiraea, stranvesia, symphoricarpos, en trochodendron. 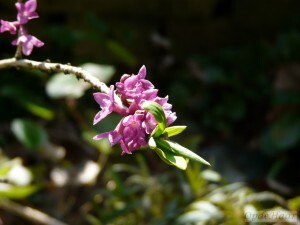 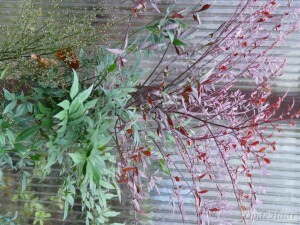 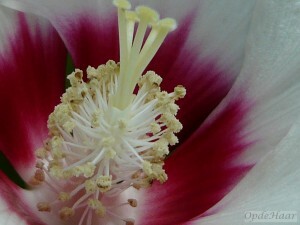 All photos were taken in our garden. 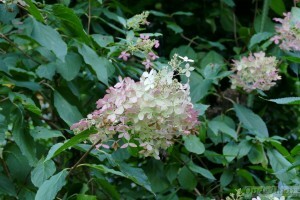 ​Click on the photos for a larger image and a slideshow . 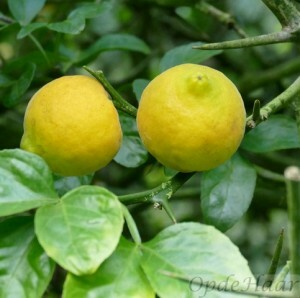 In the summer borders our only hardy citrus plant, Poncirus trifoliata (Japanese bitter orange) is loaded with oranges as I write on this frosty November morning. 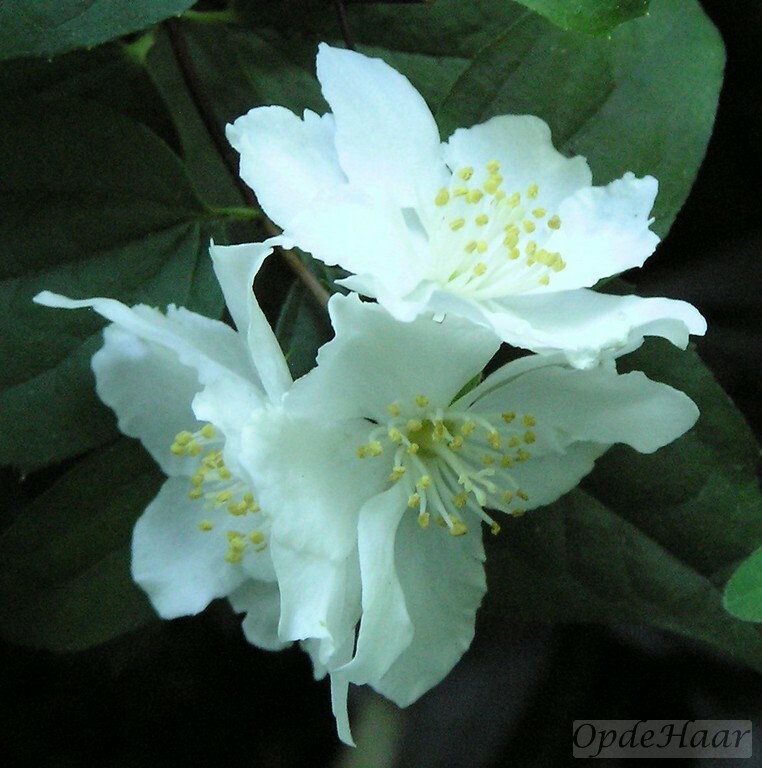 I notice that Hans Prins, Kwekerij de Groene Prins has ambitions to start a mini-citrus plantation an hour to the north of here but I don’t think we will go to these lengths. 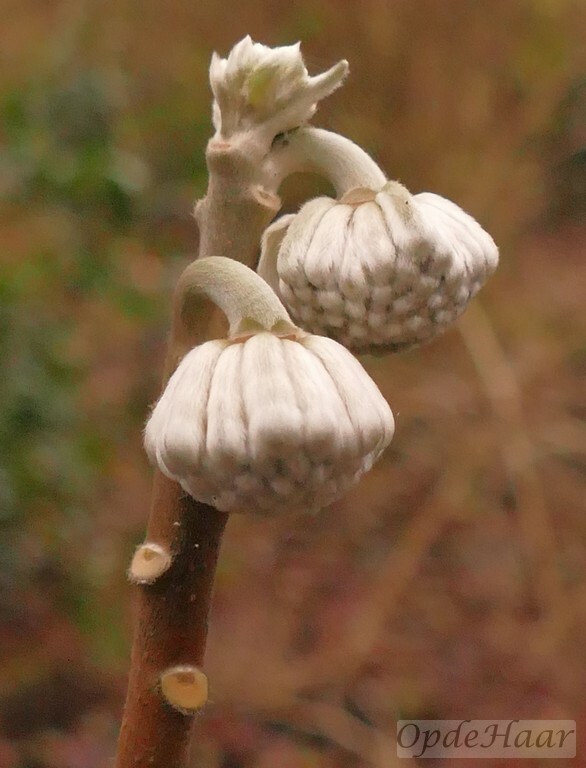 Poncirus trifoliata carries remarkable spines on its stems and is, I have read, used as a hedge to keep out unwelcome intruders. 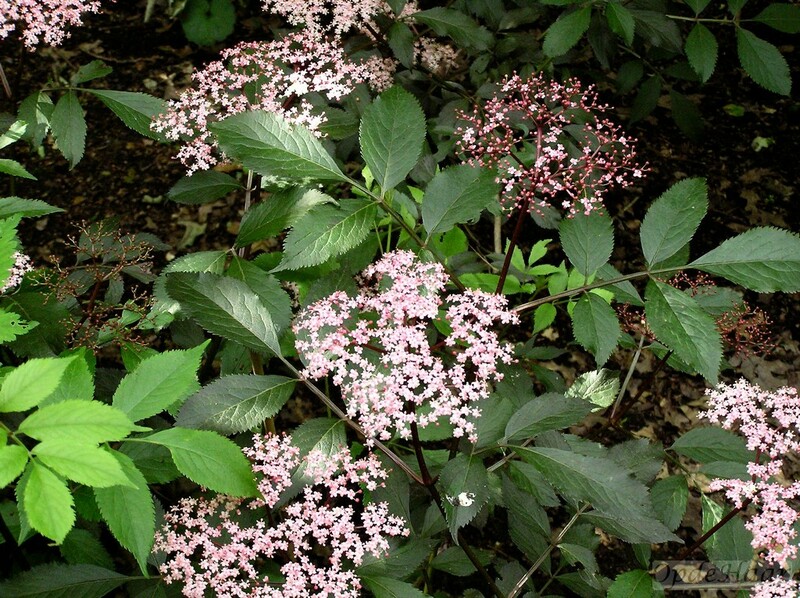 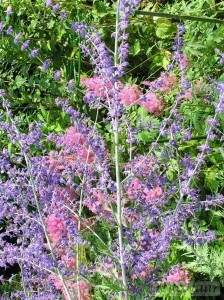 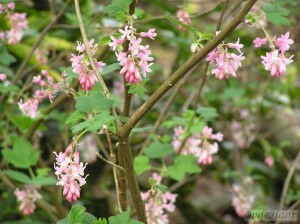 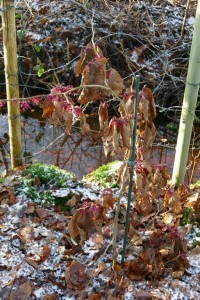 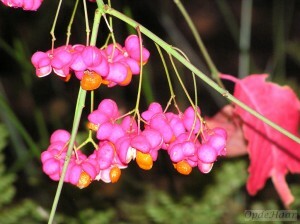 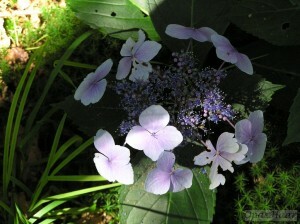 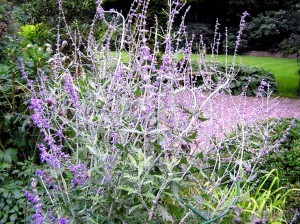 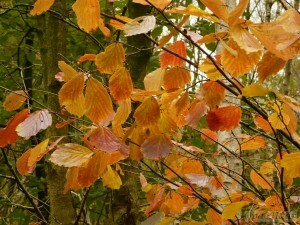 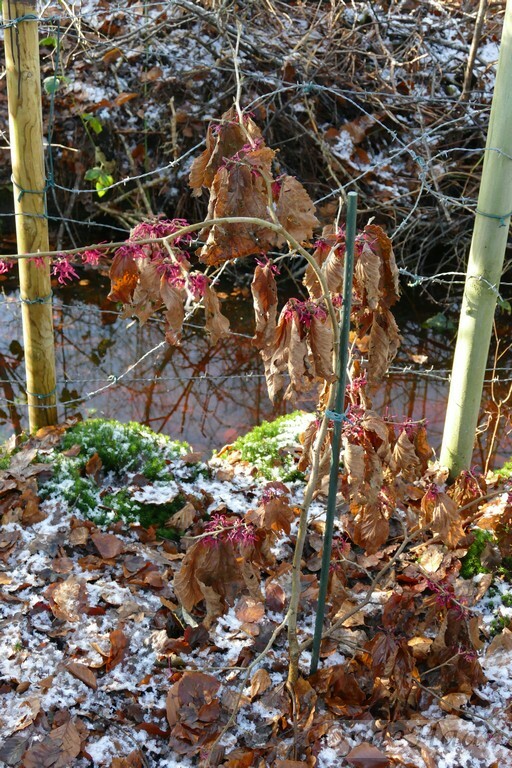 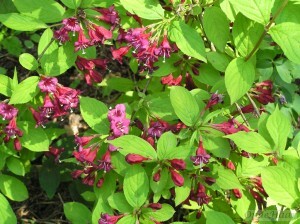 Take care not to plant it next to a path where it could catch an arm or a leg. 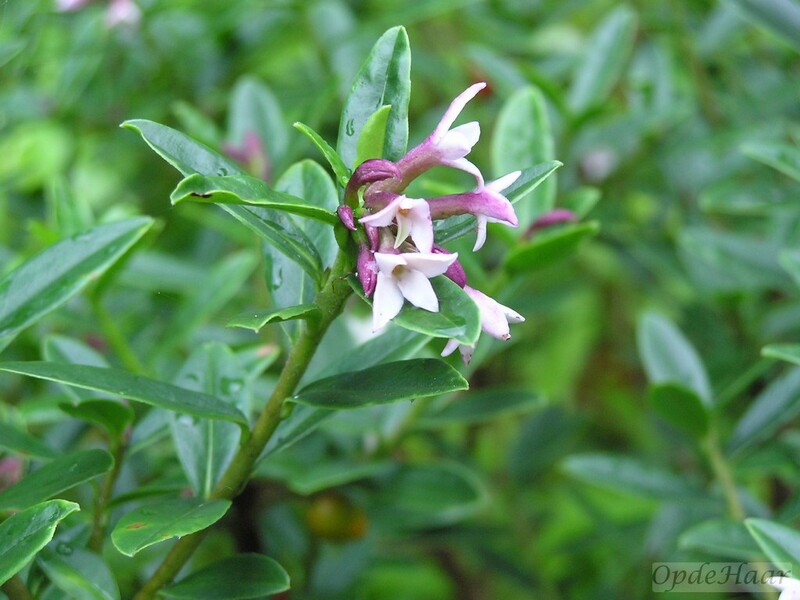 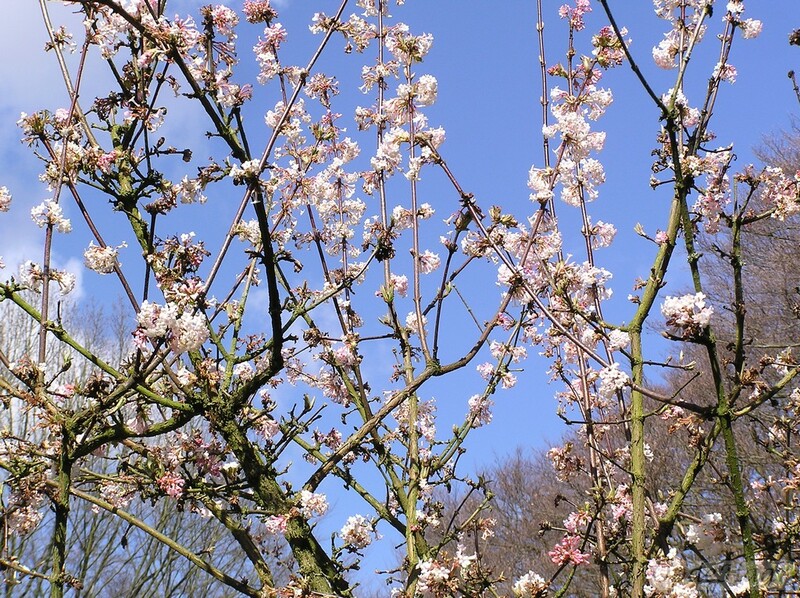 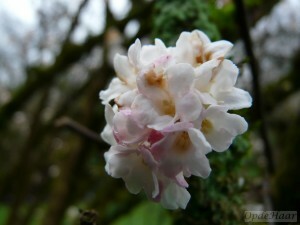 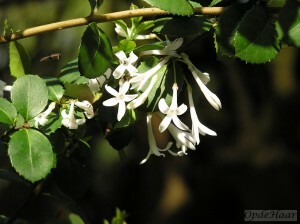 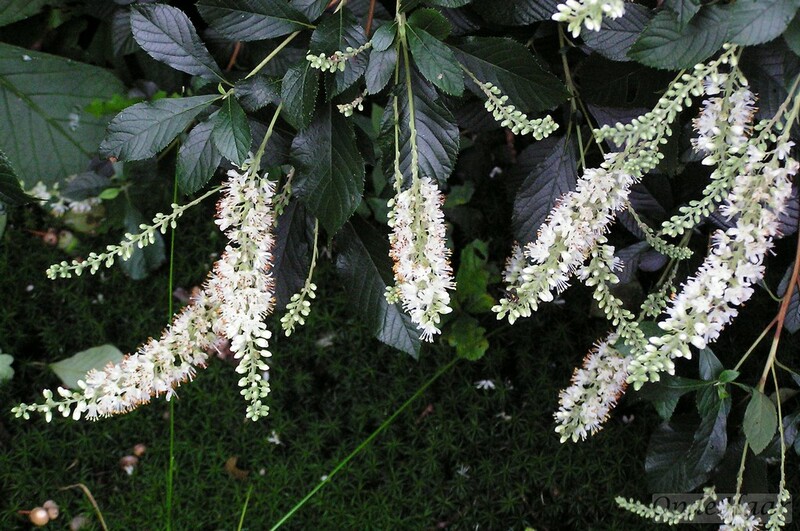 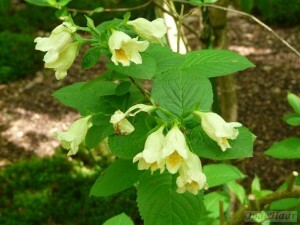 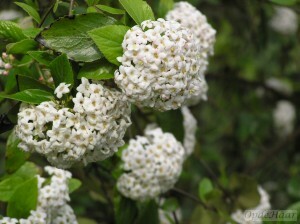 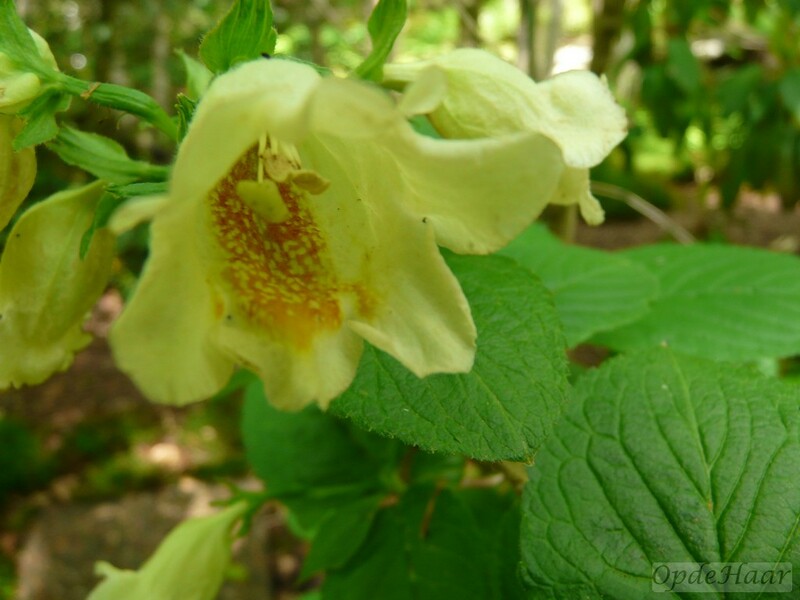 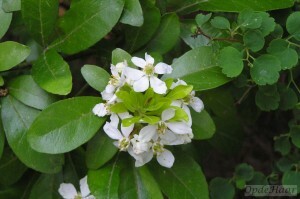 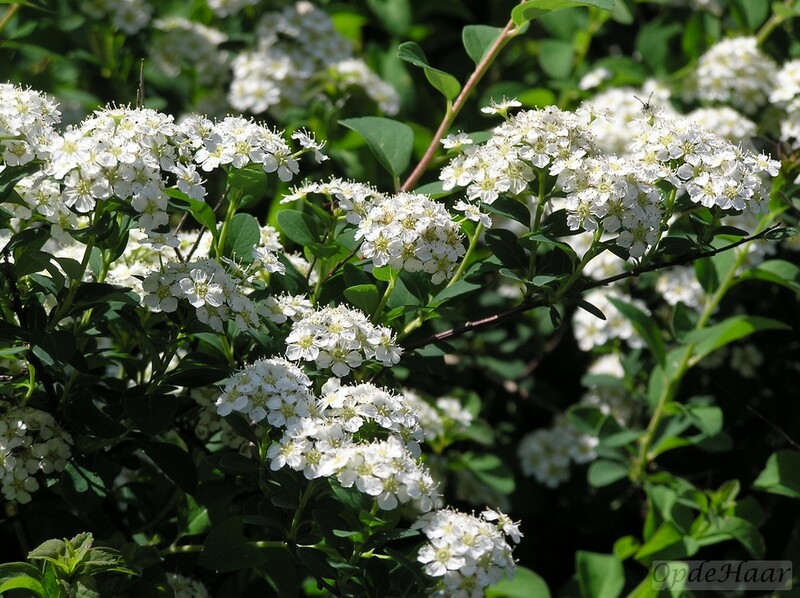 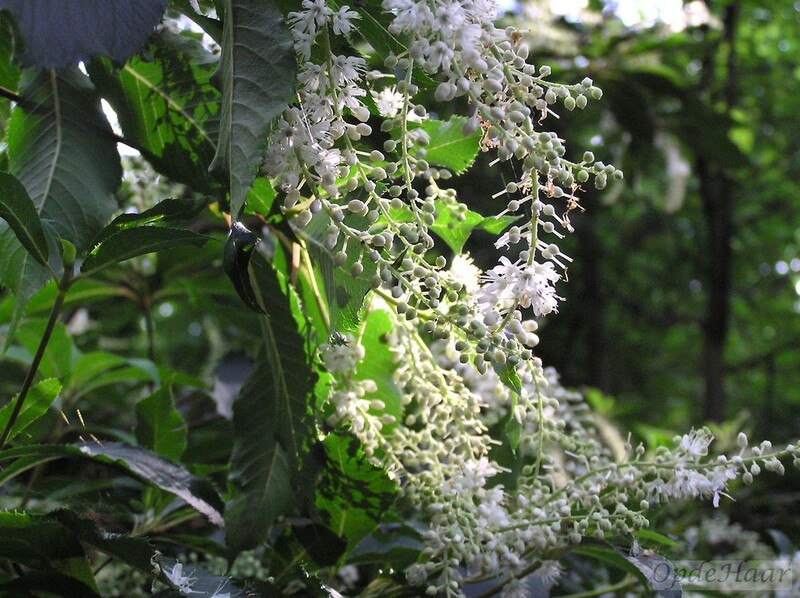 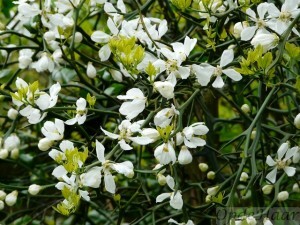 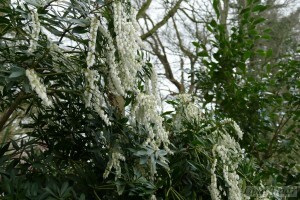 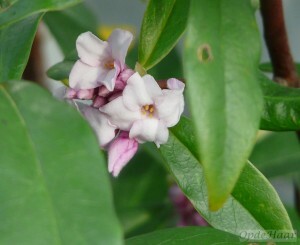 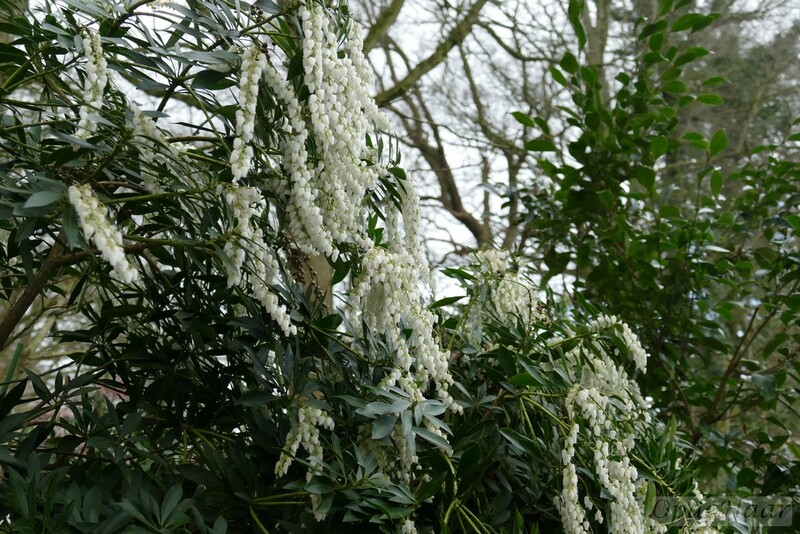 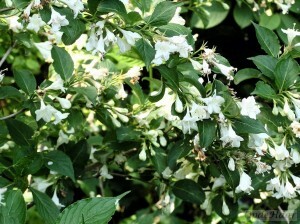 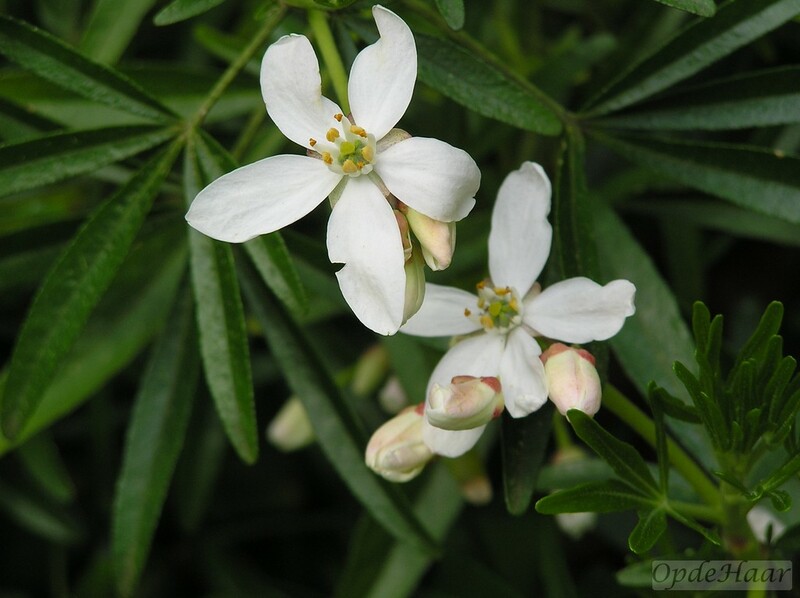 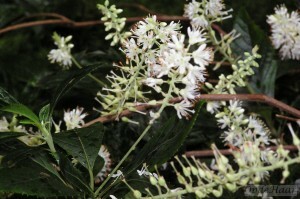 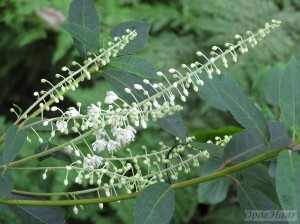 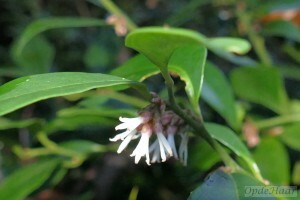 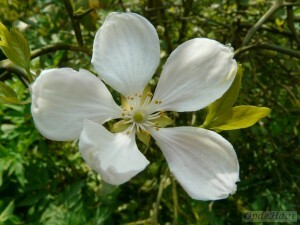 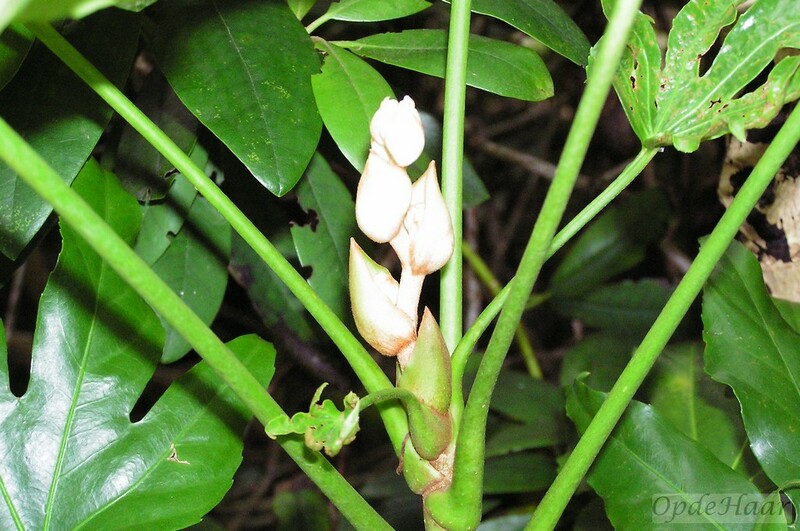 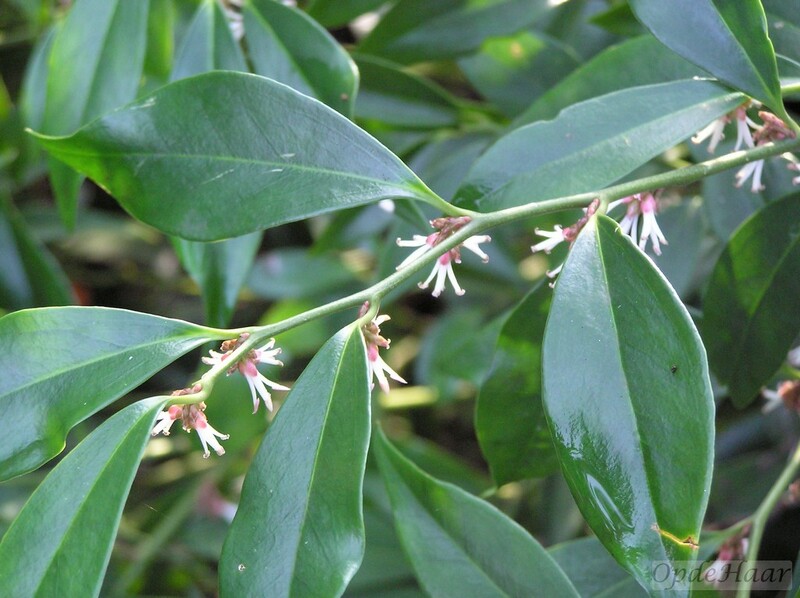 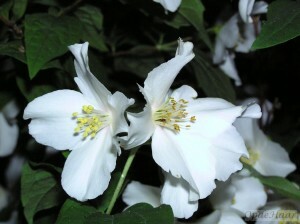 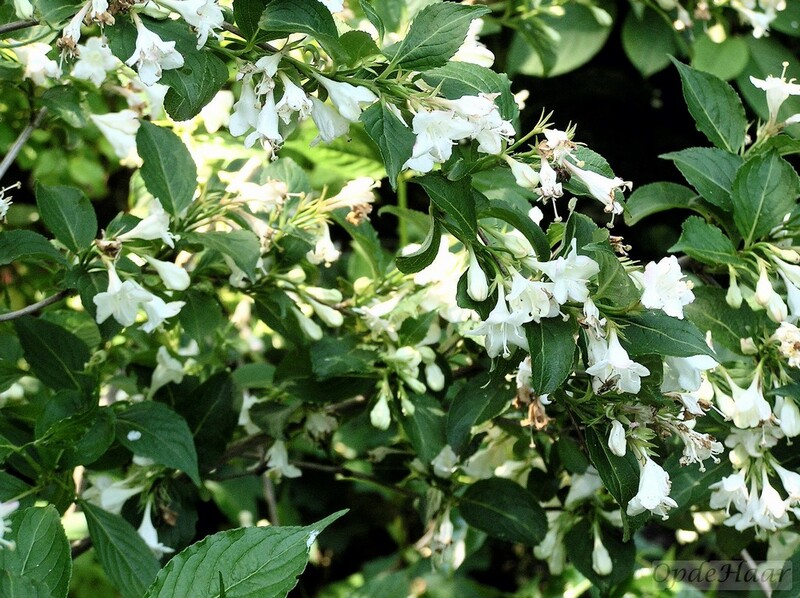 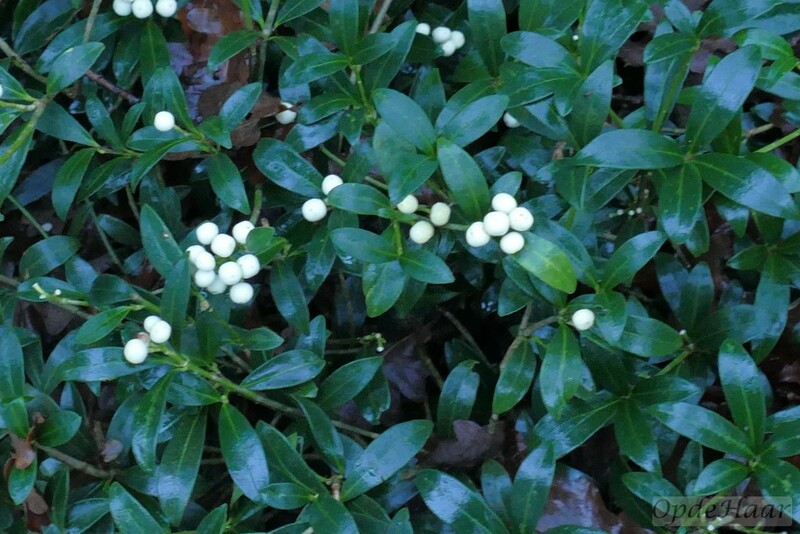 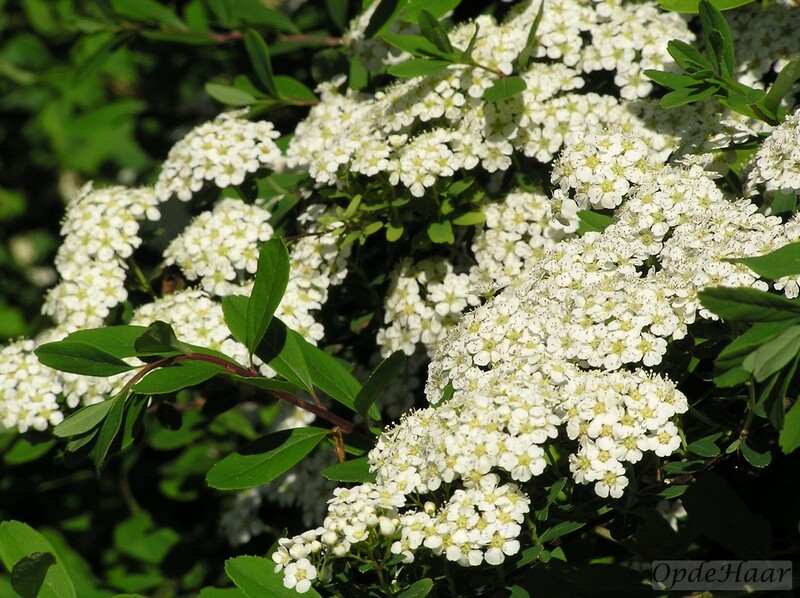 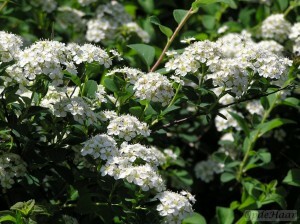 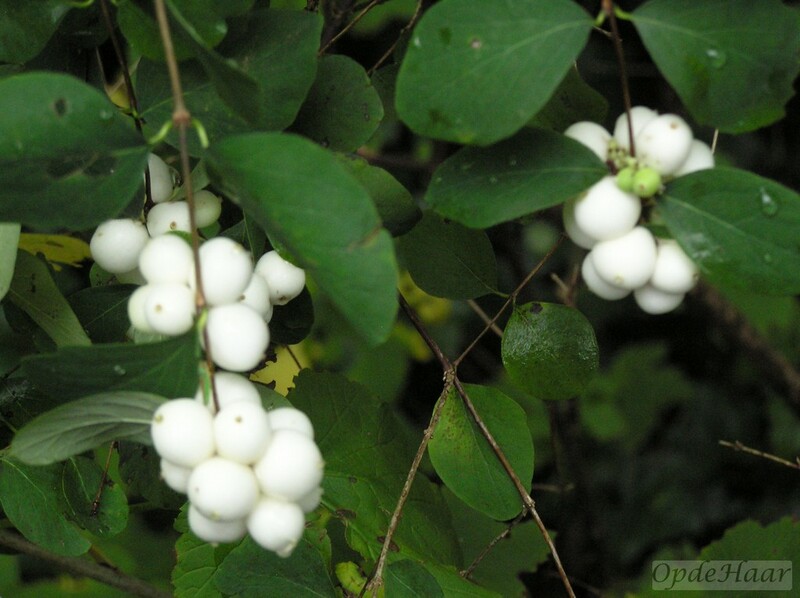 In spring, it carries beautifully scented white flowers that ripen into tomato-sized yellow fruits in the autumn. 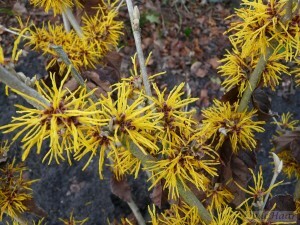 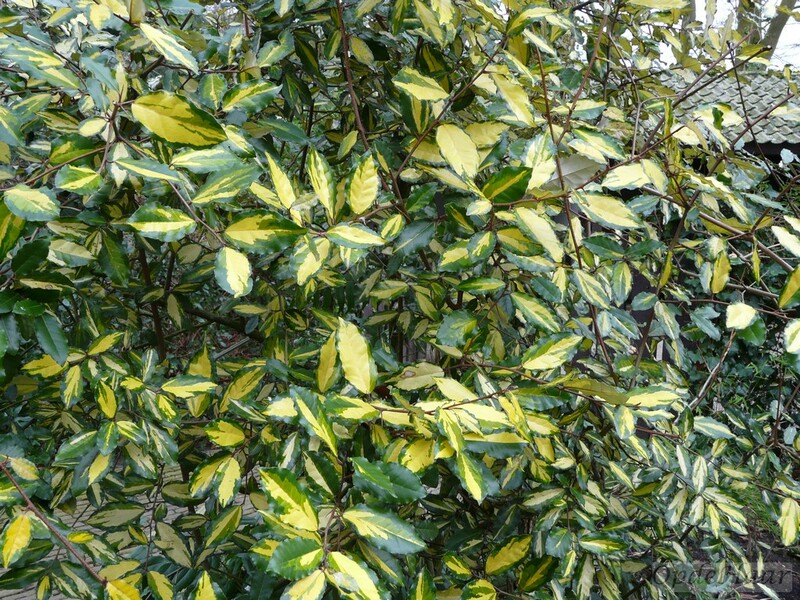 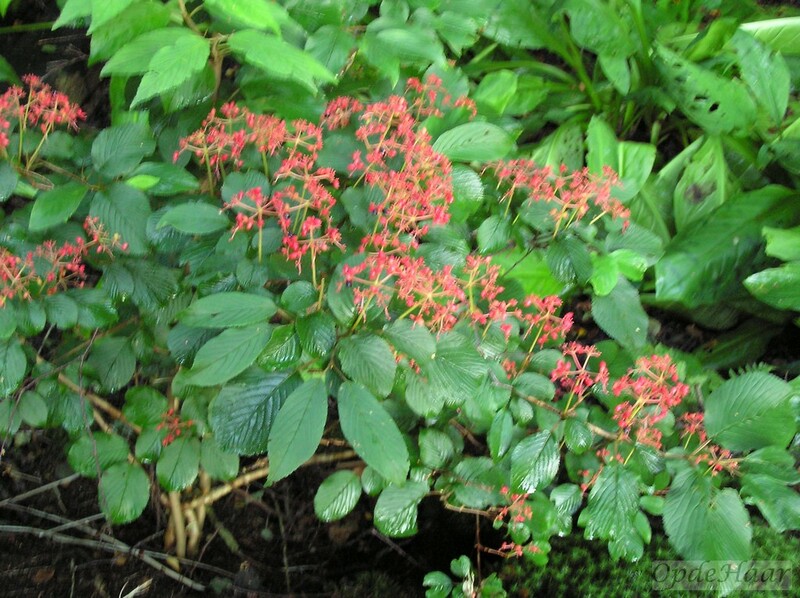 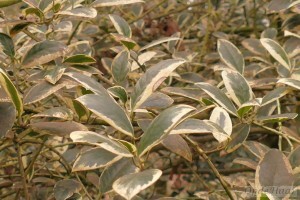 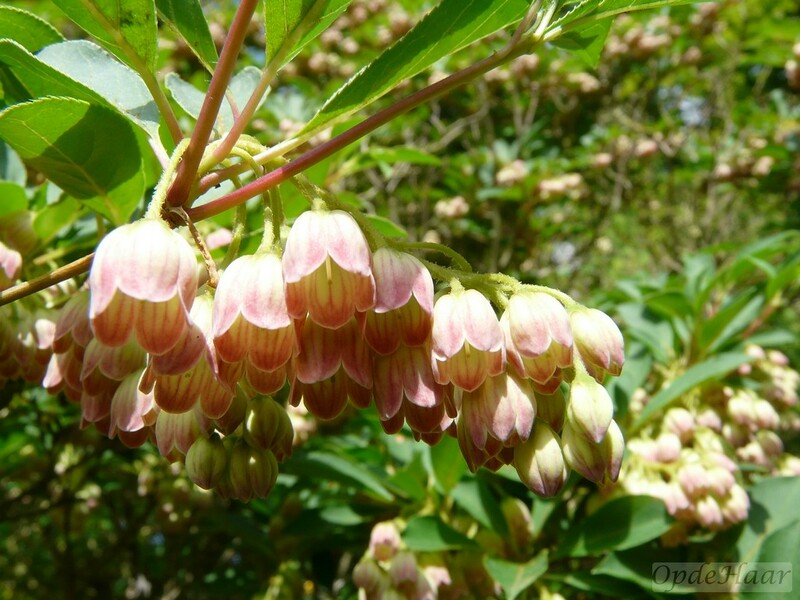 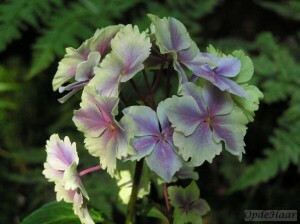 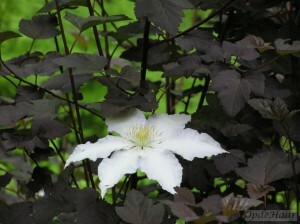 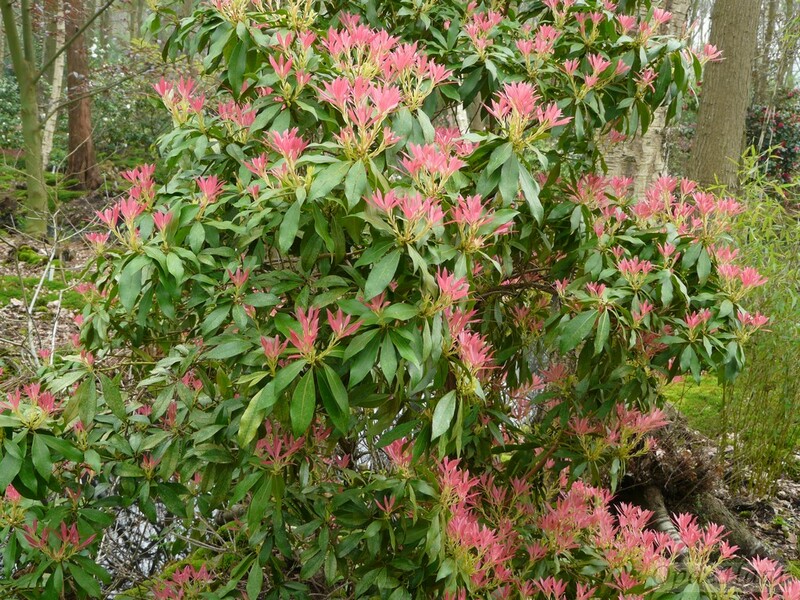 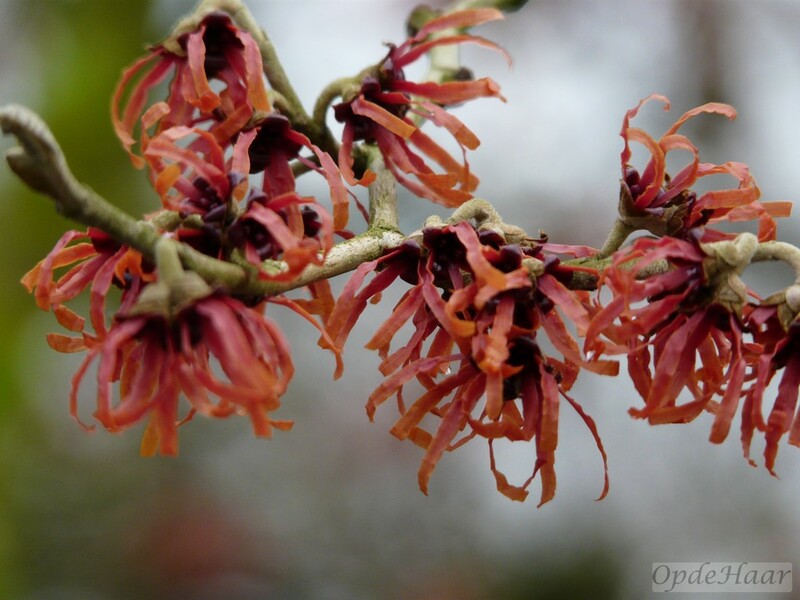 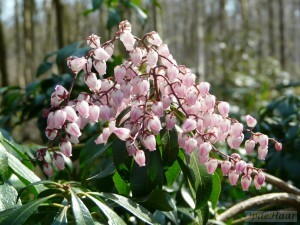 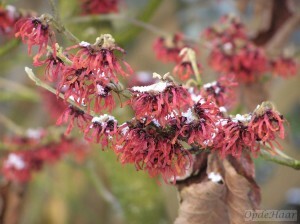 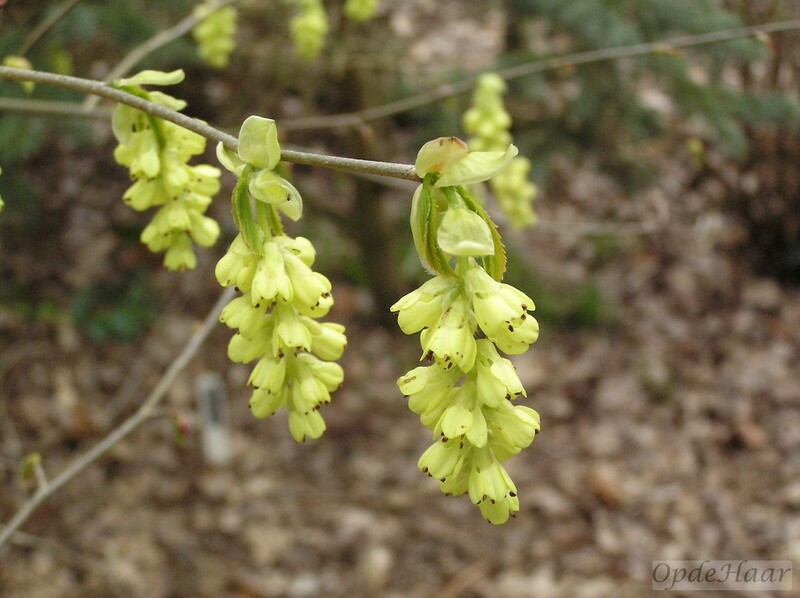 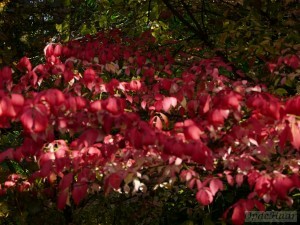 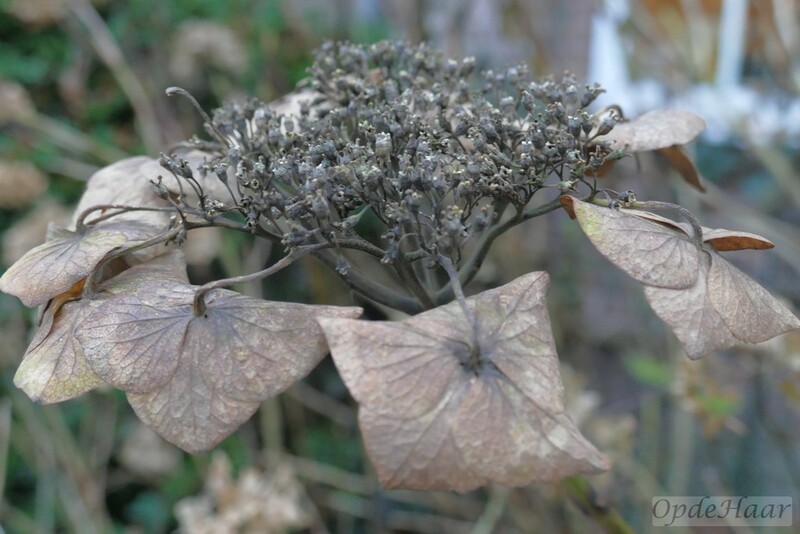 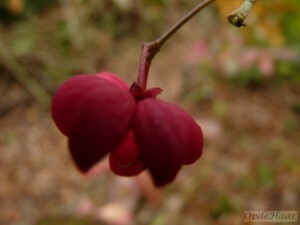 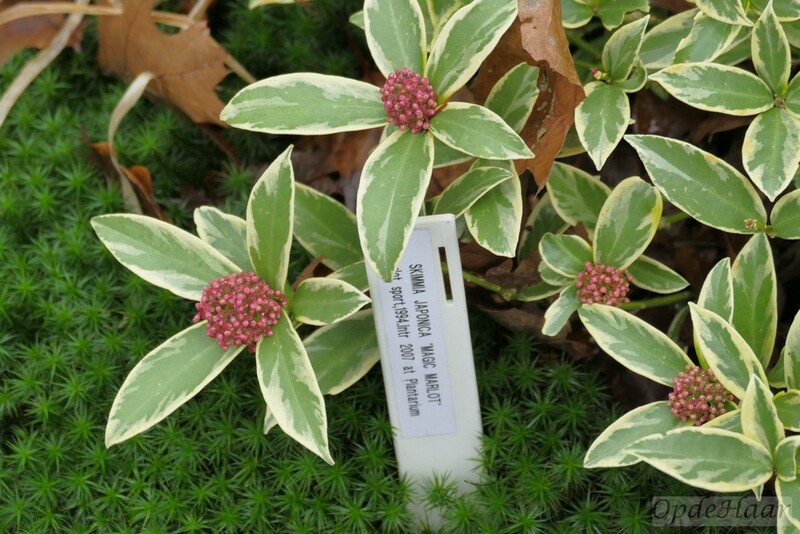 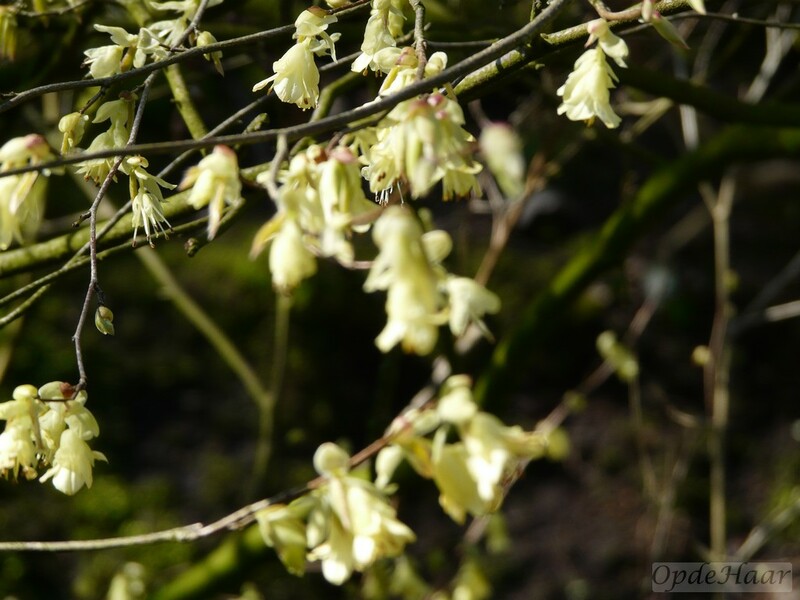 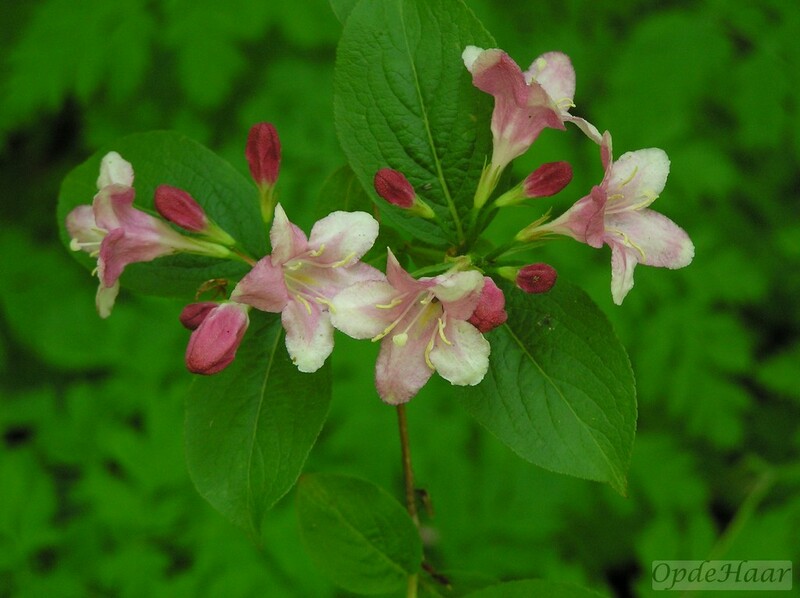 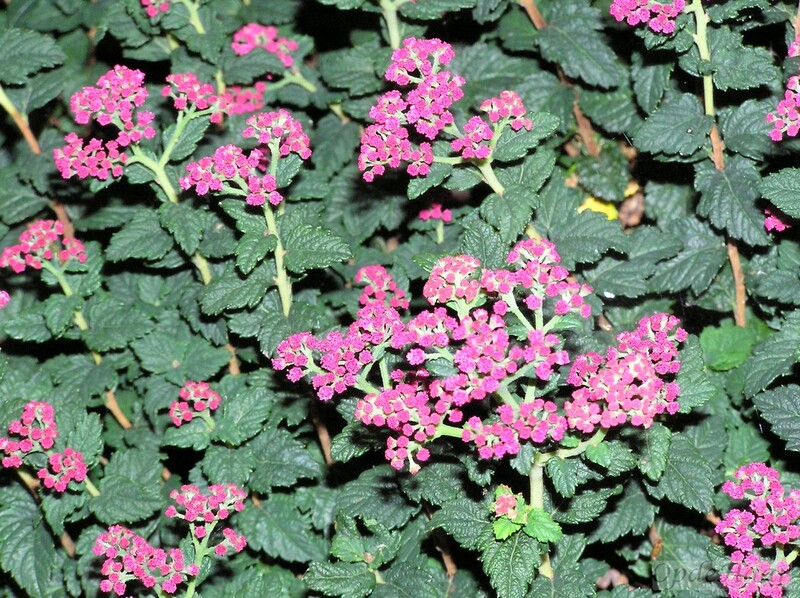 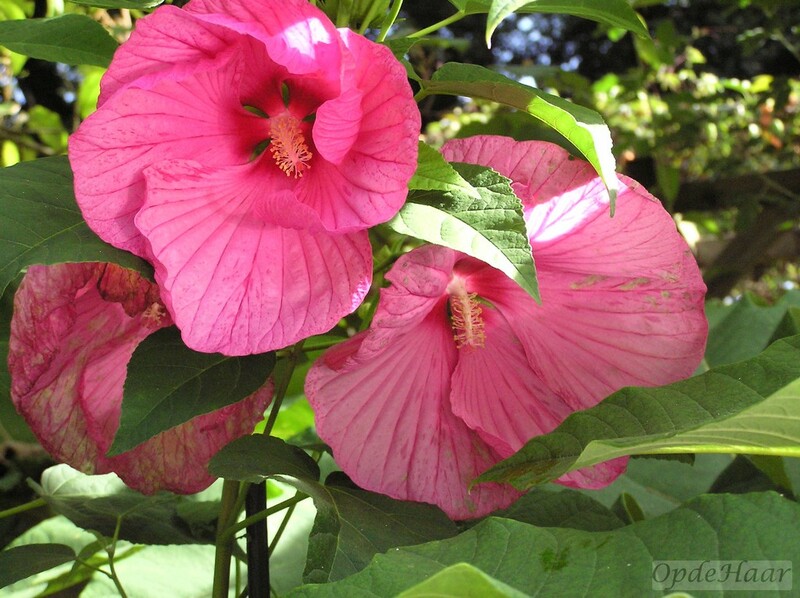 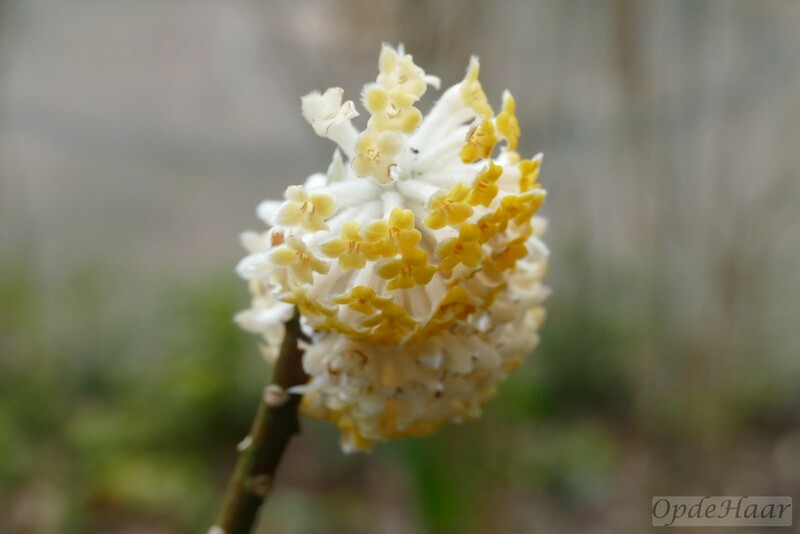 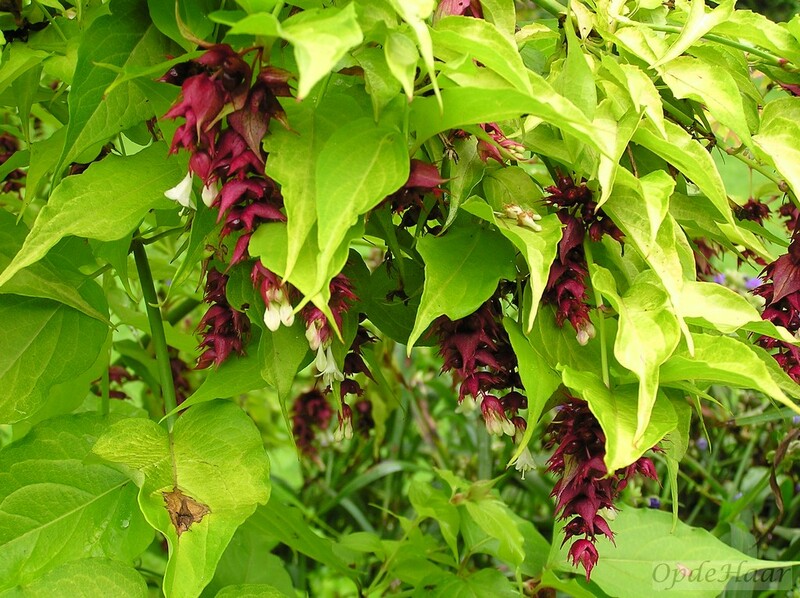 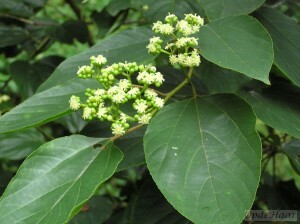 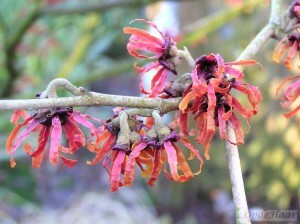 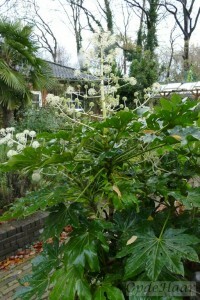 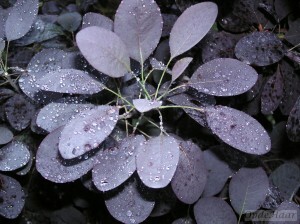 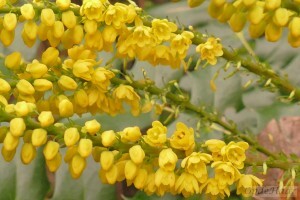 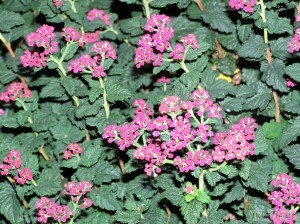 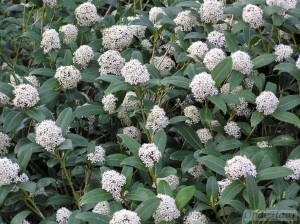 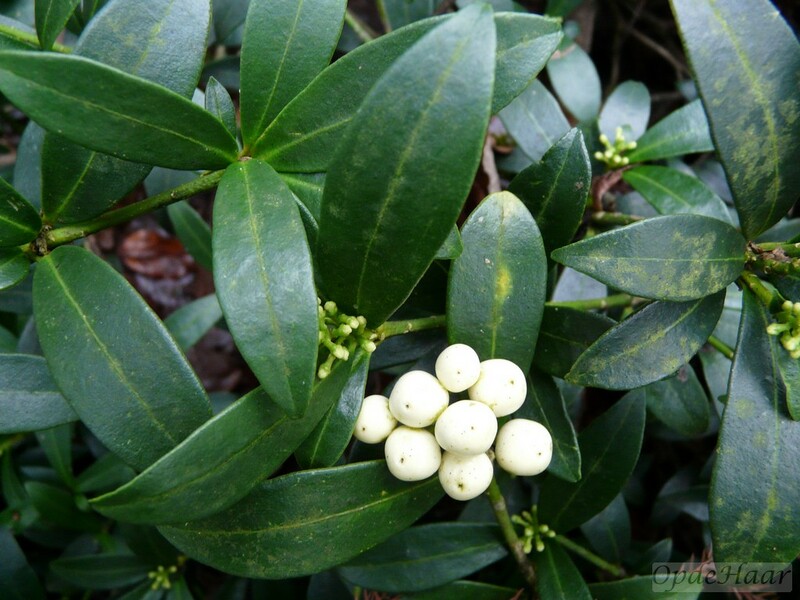 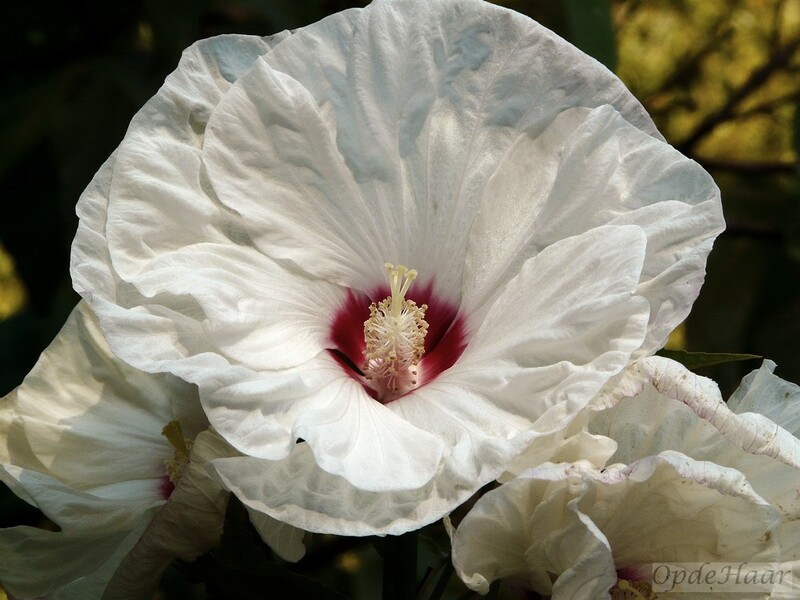 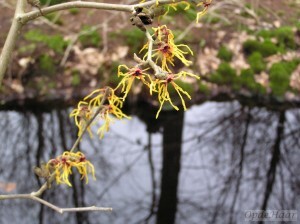 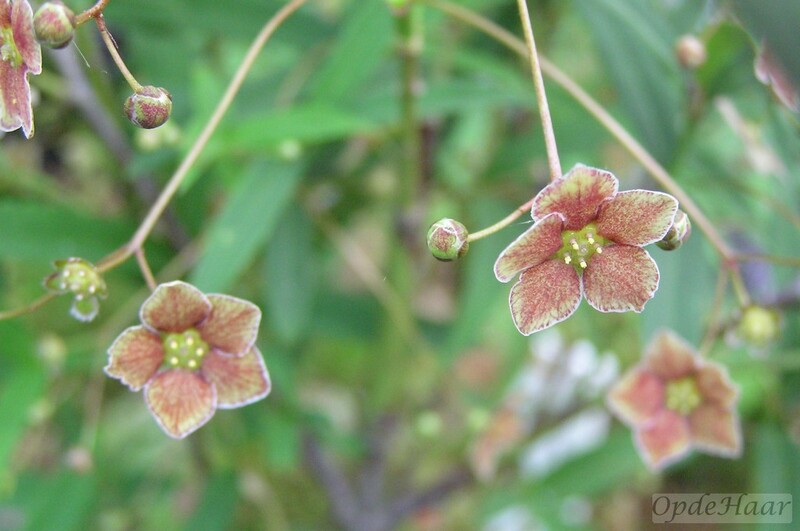 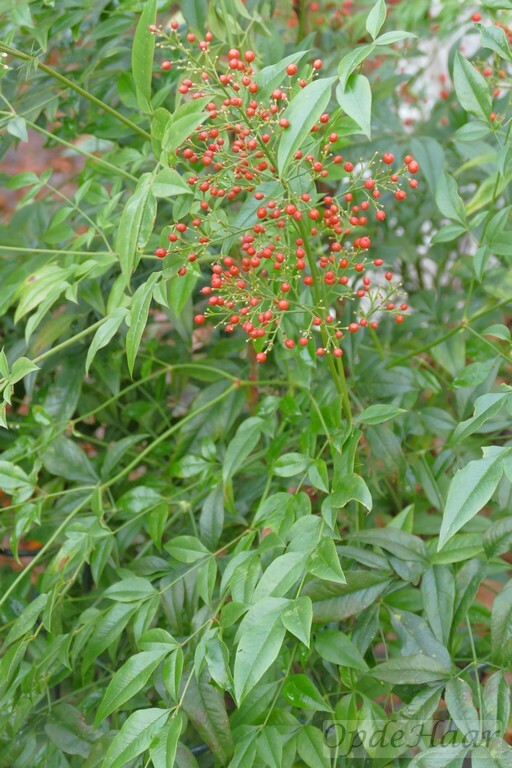 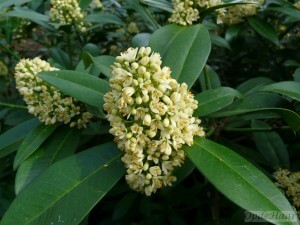 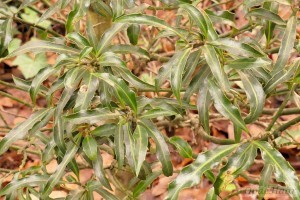 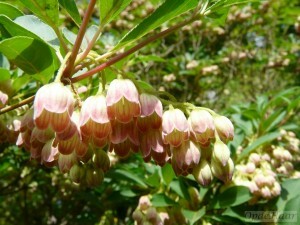 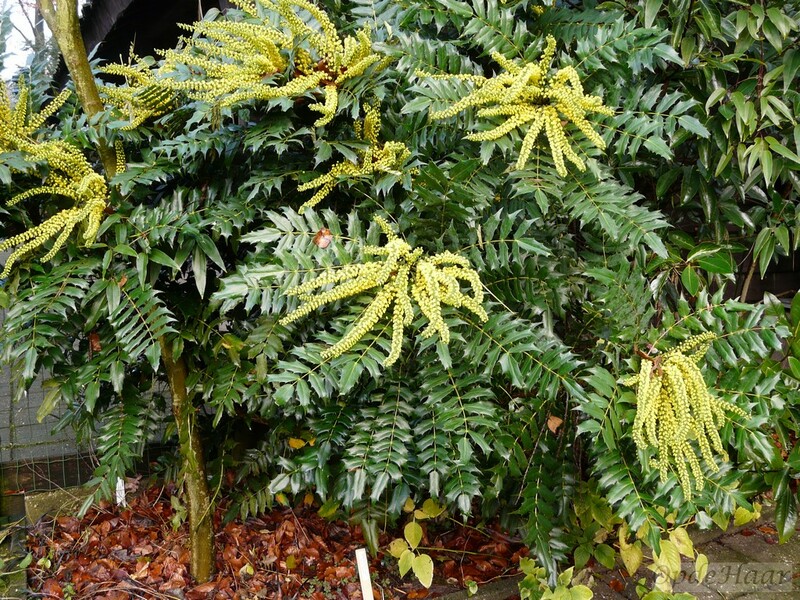 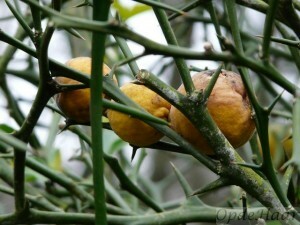 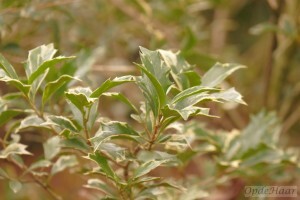 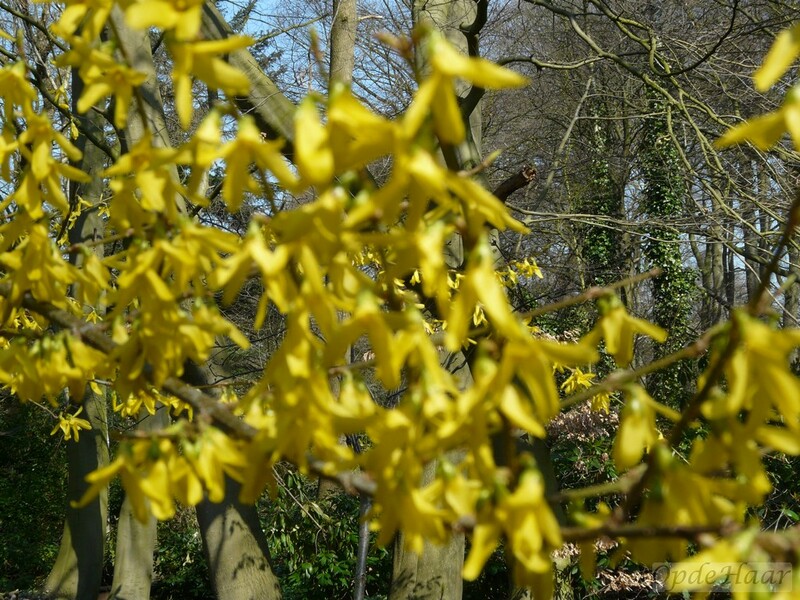 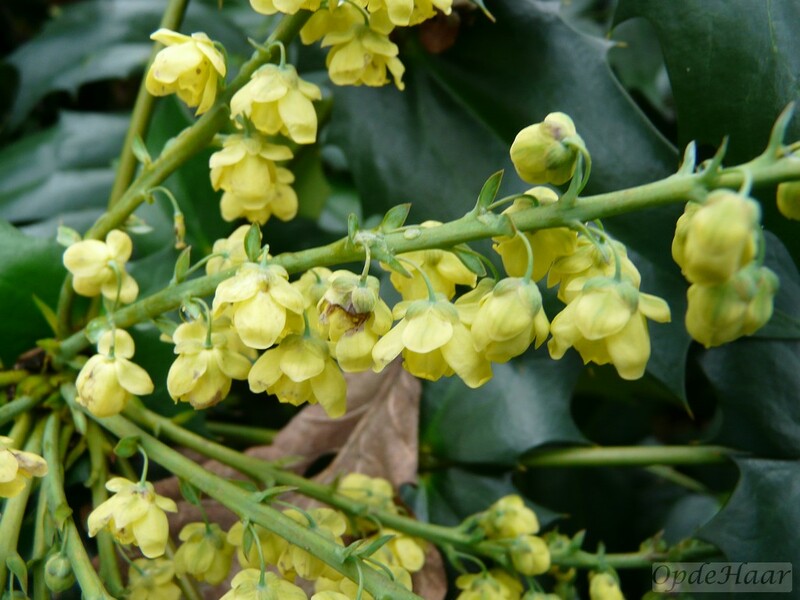 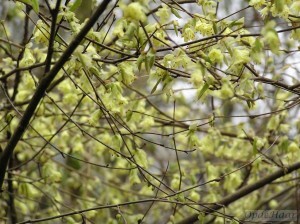 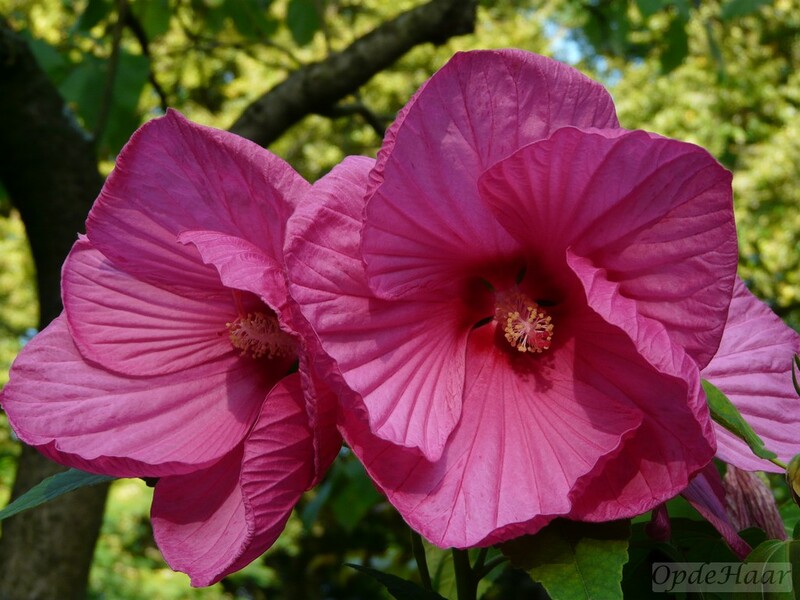 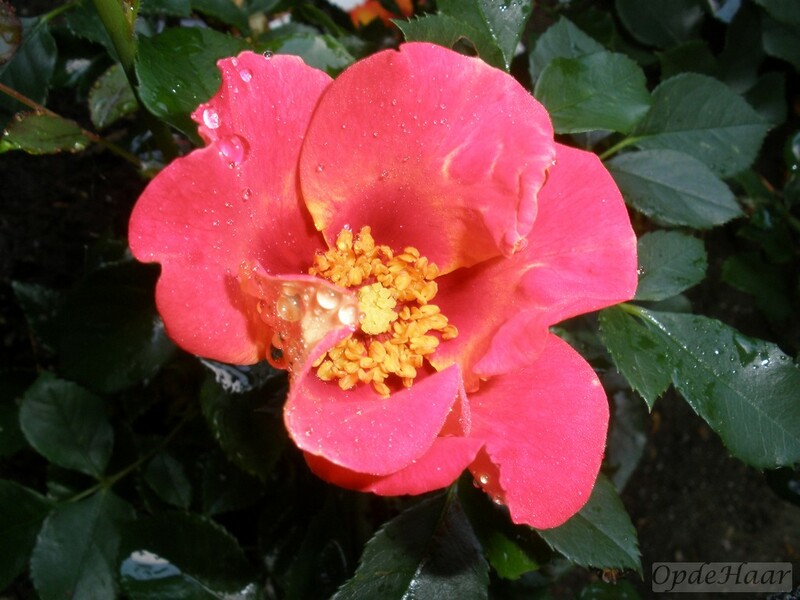 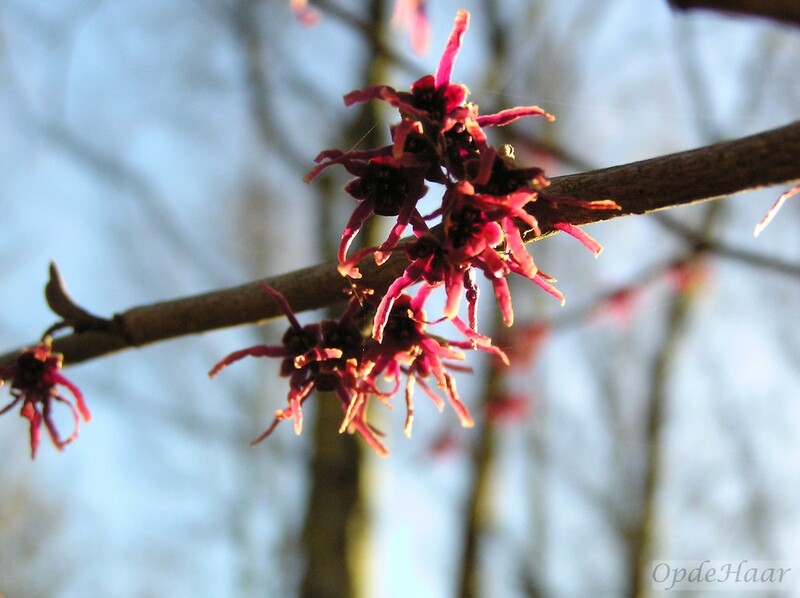 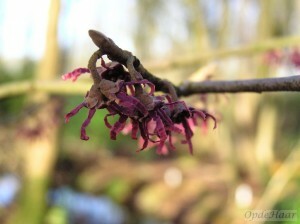 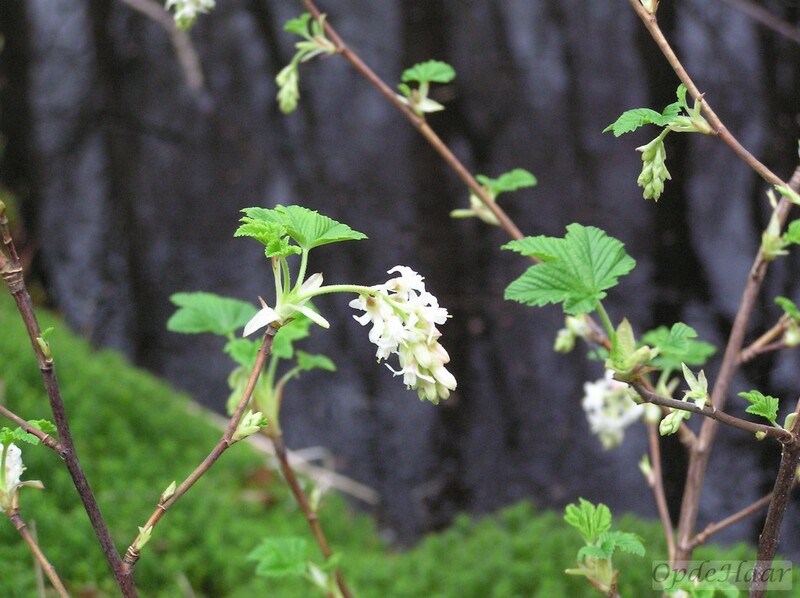 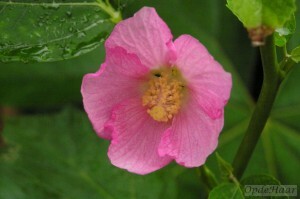 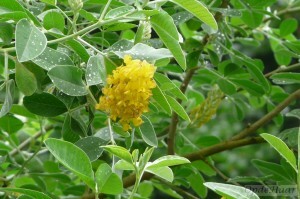 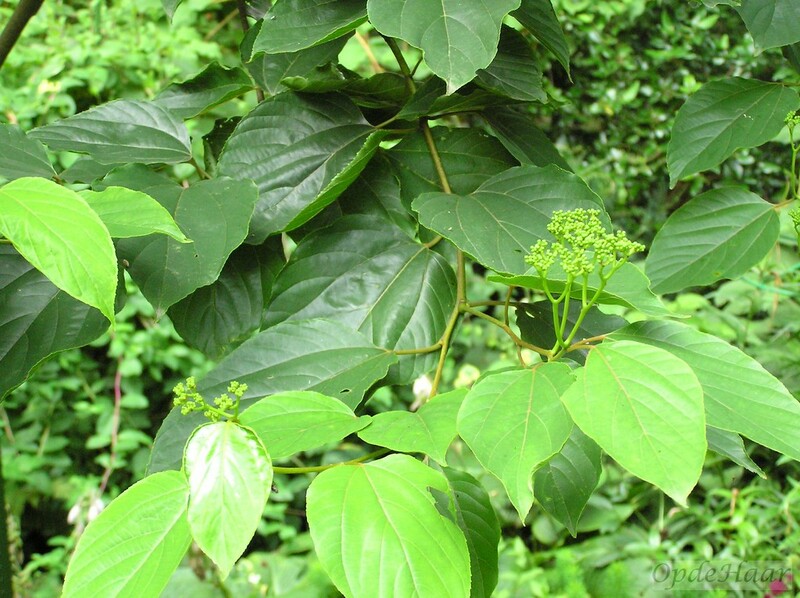 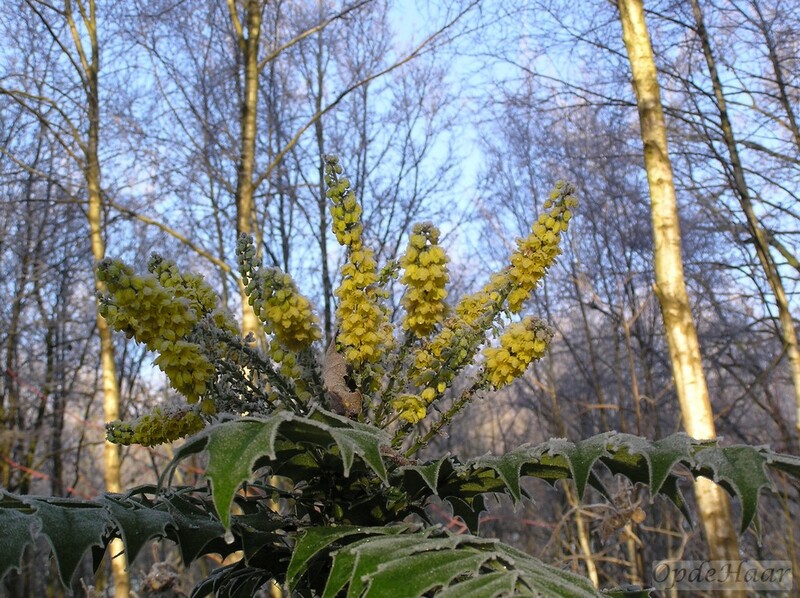 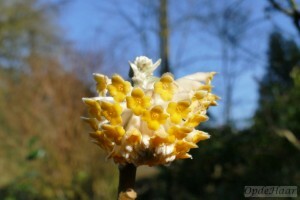 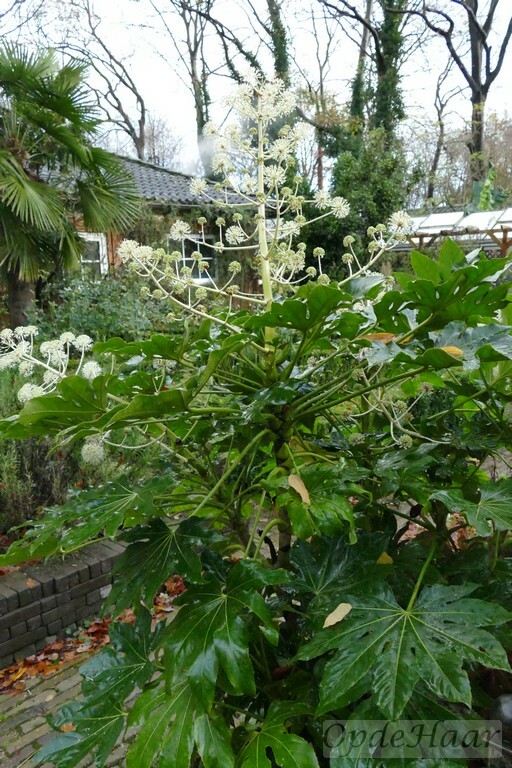 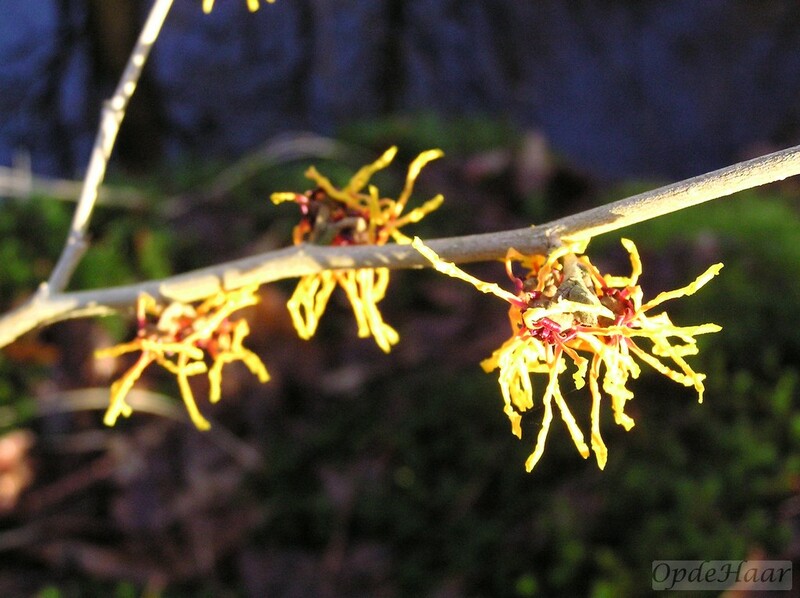 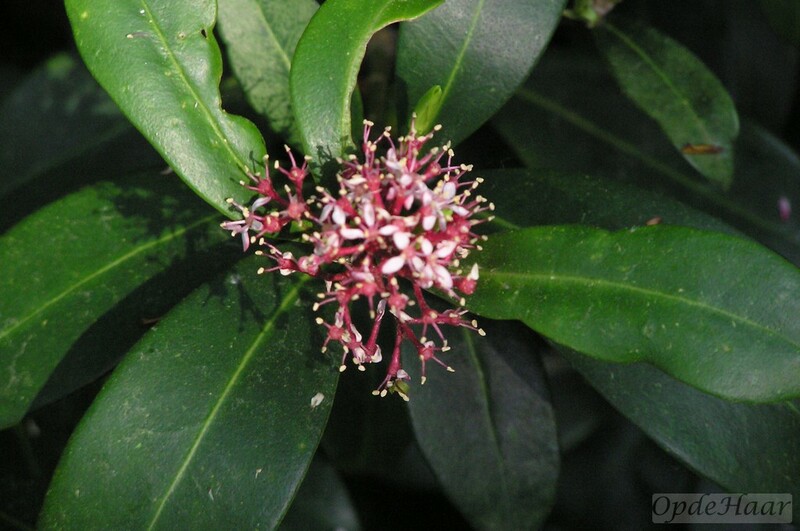 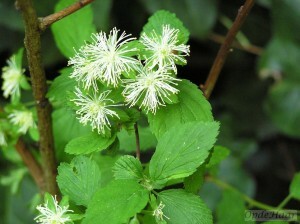 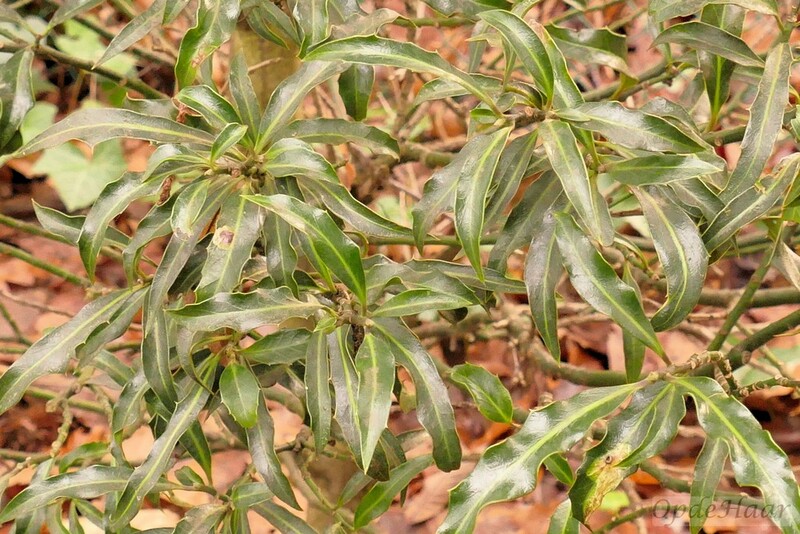 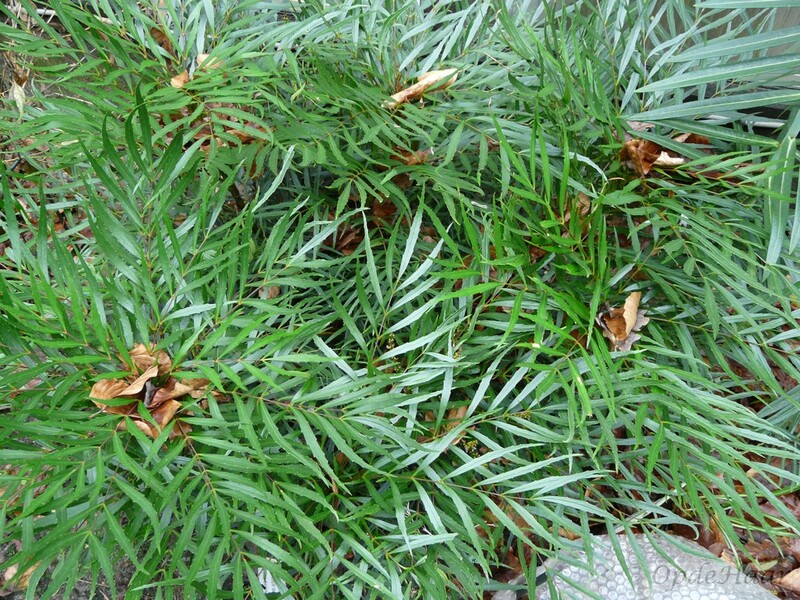 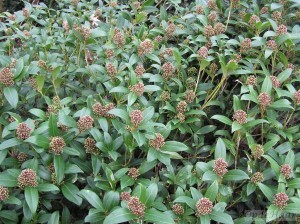 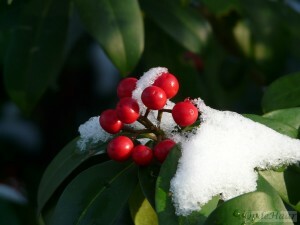 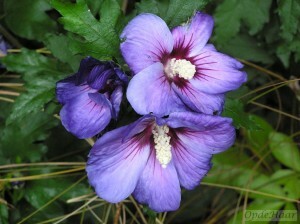 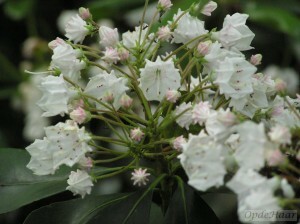 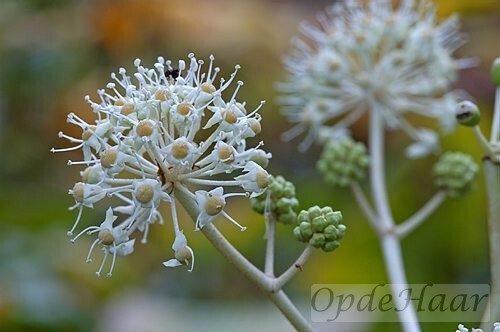 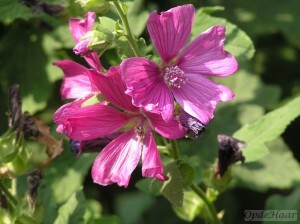 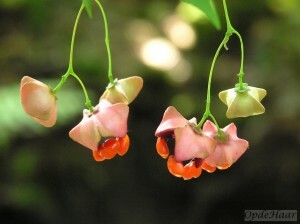 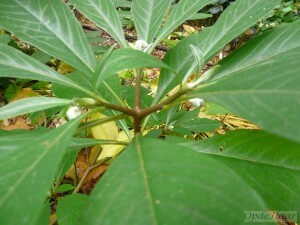 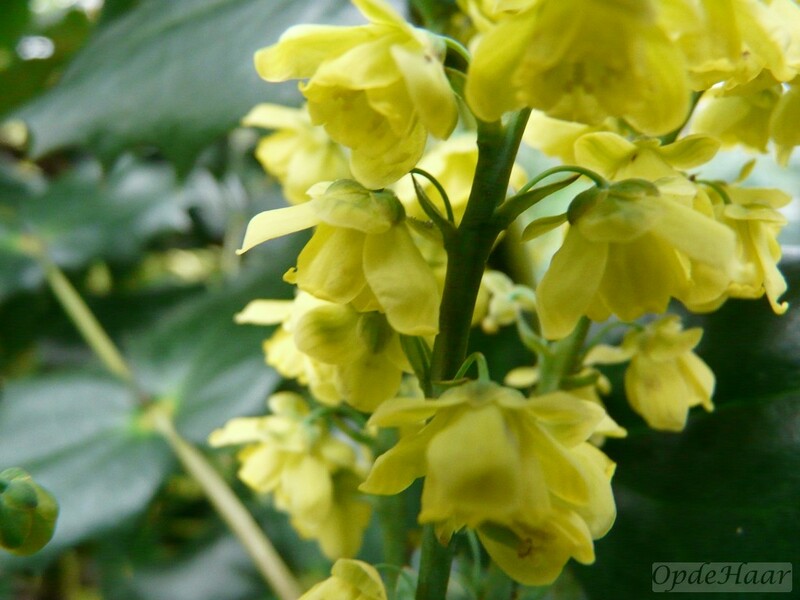 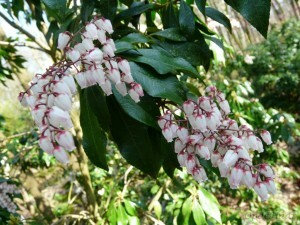 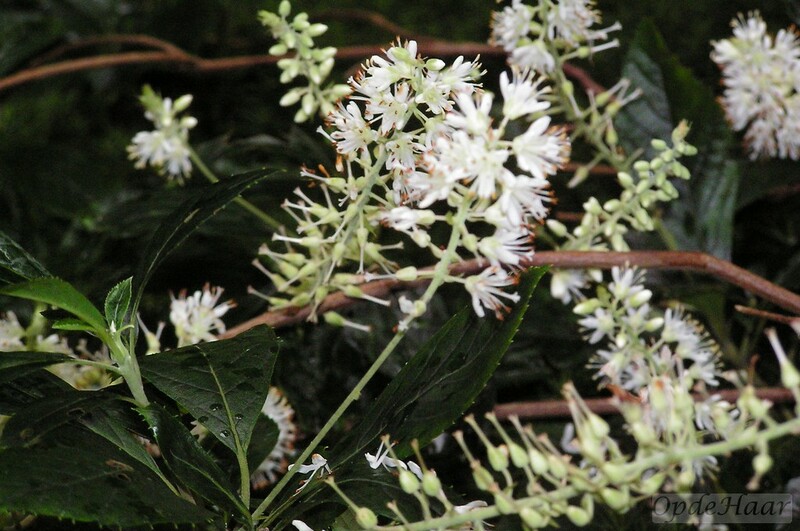 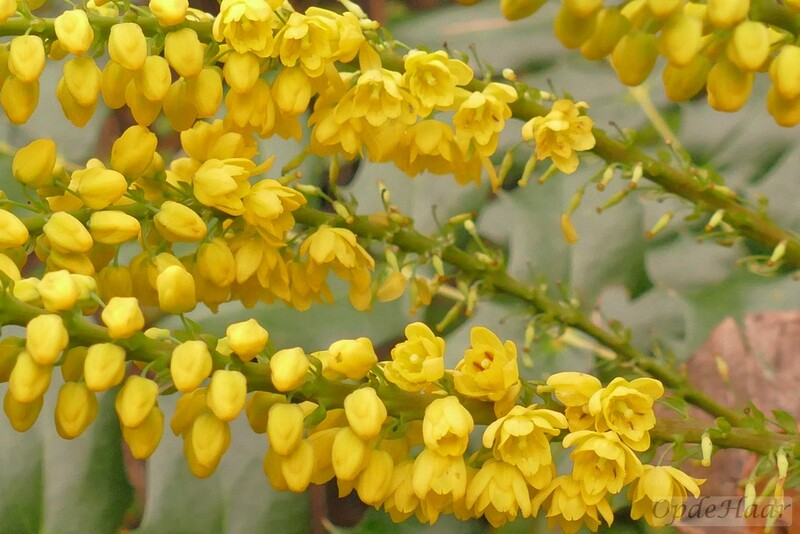 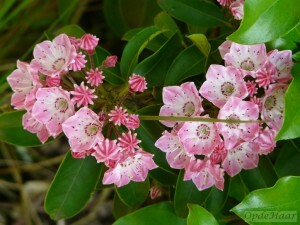 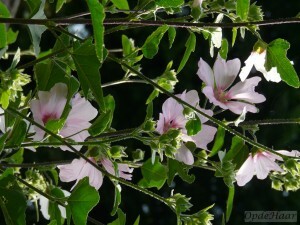 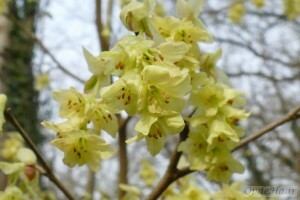 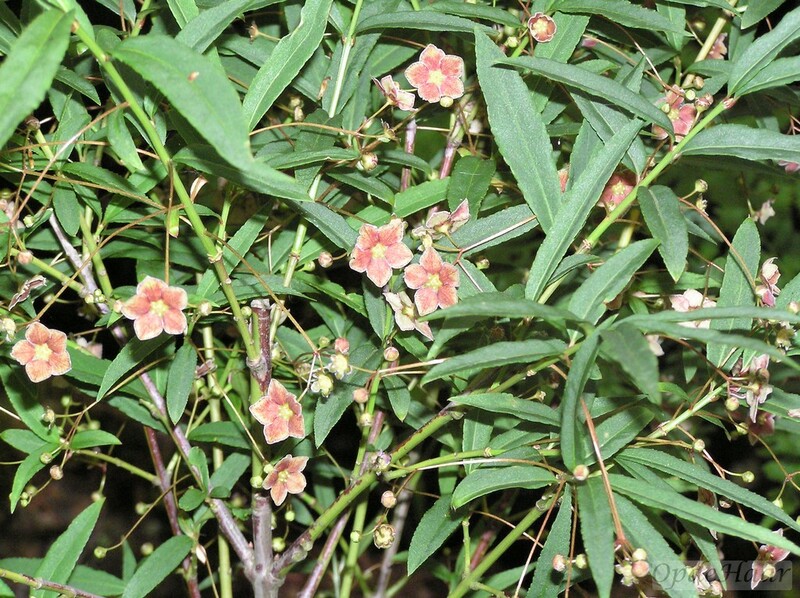 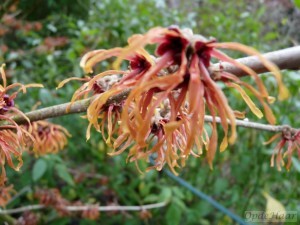 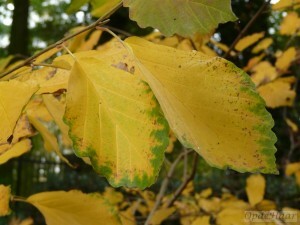 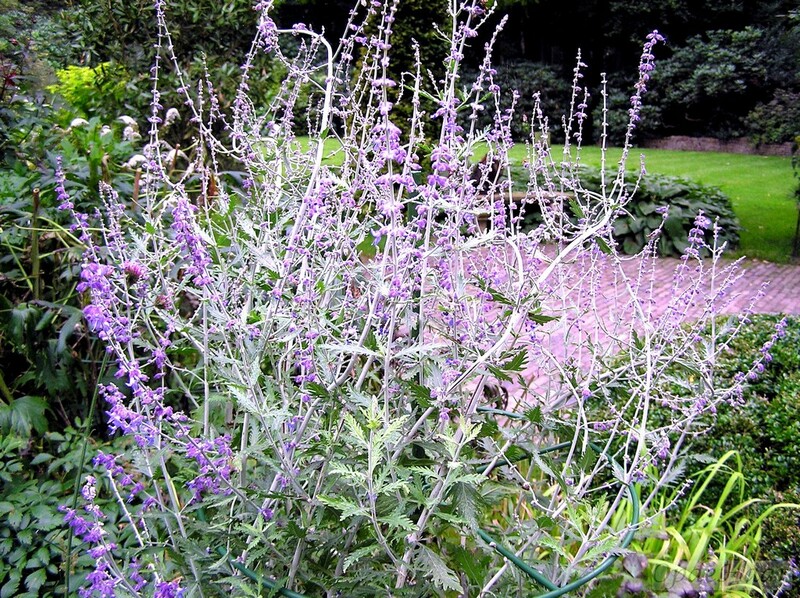 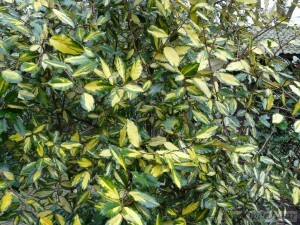 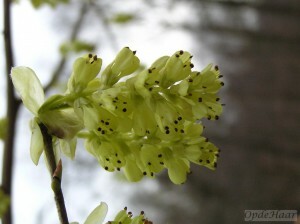 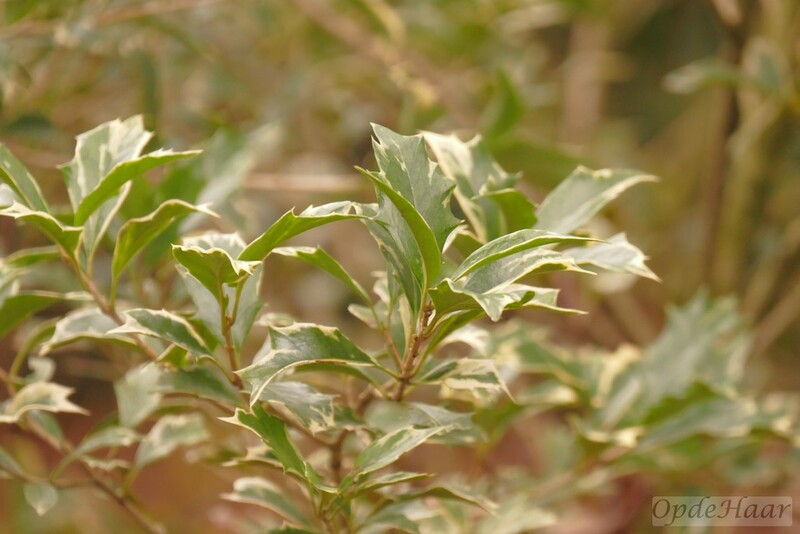 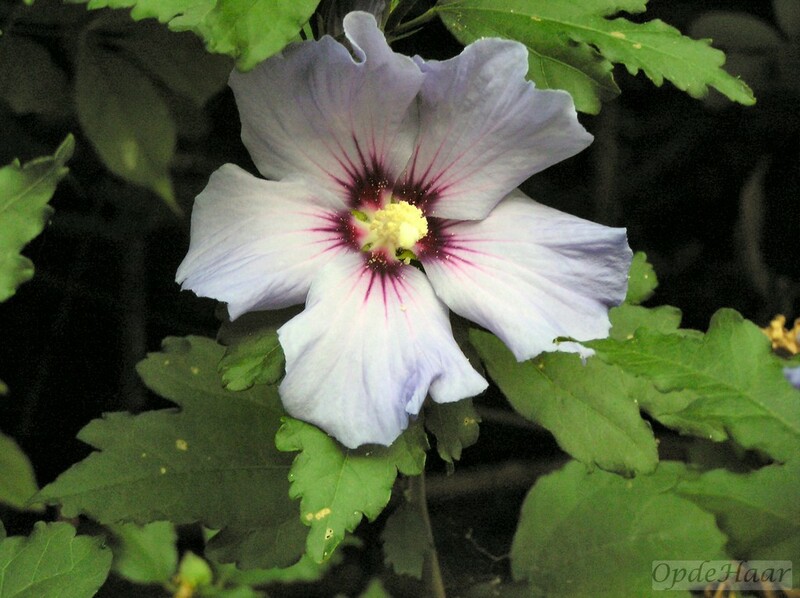 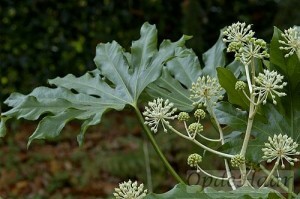 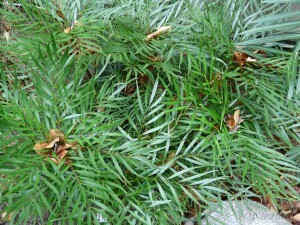 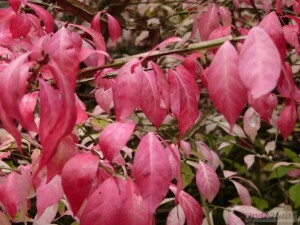 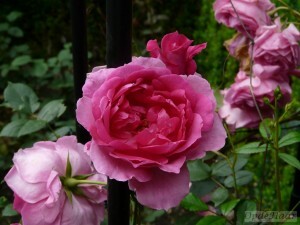 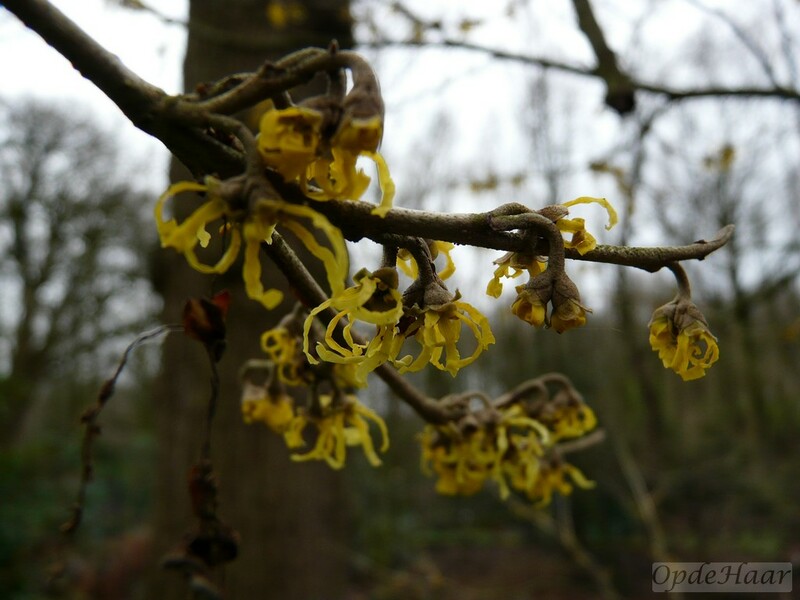 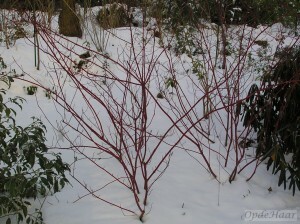 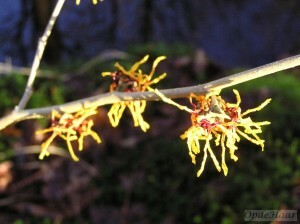 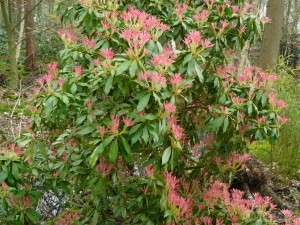 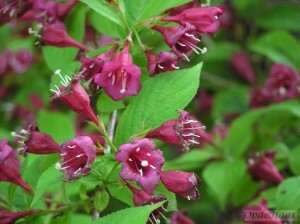 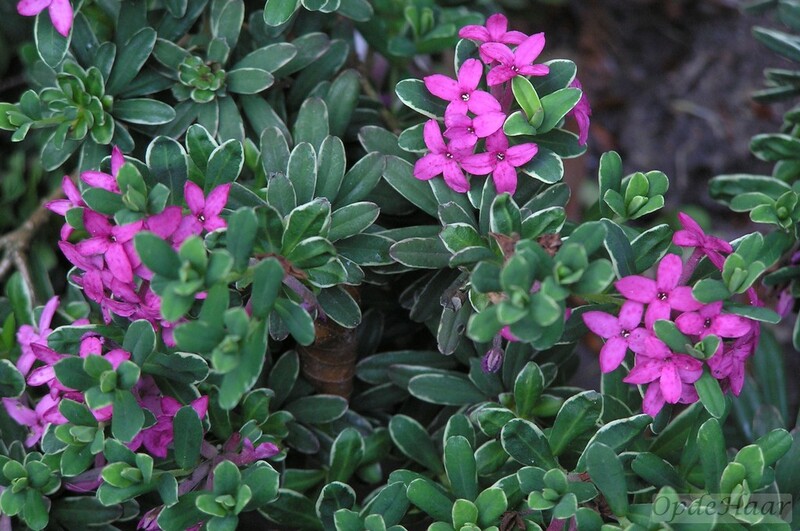 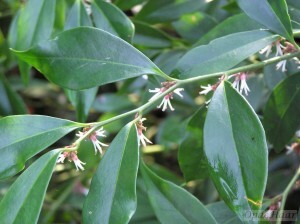 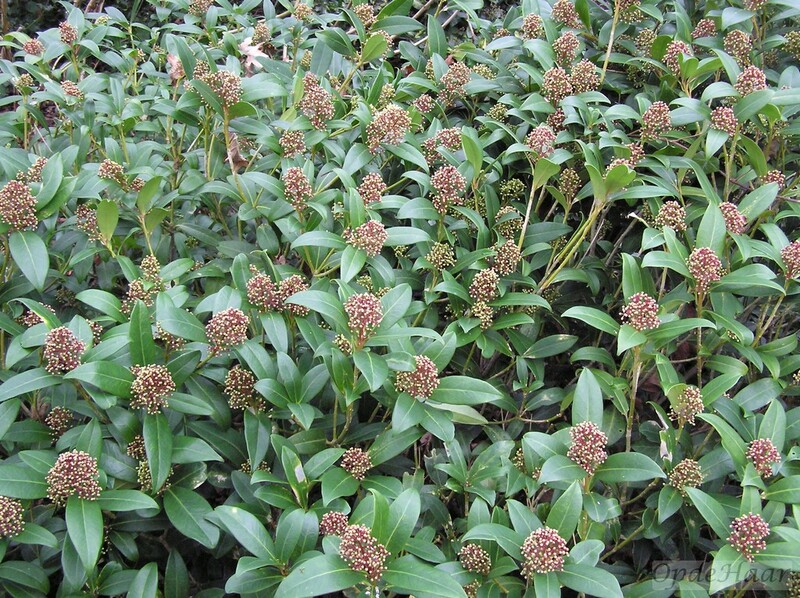 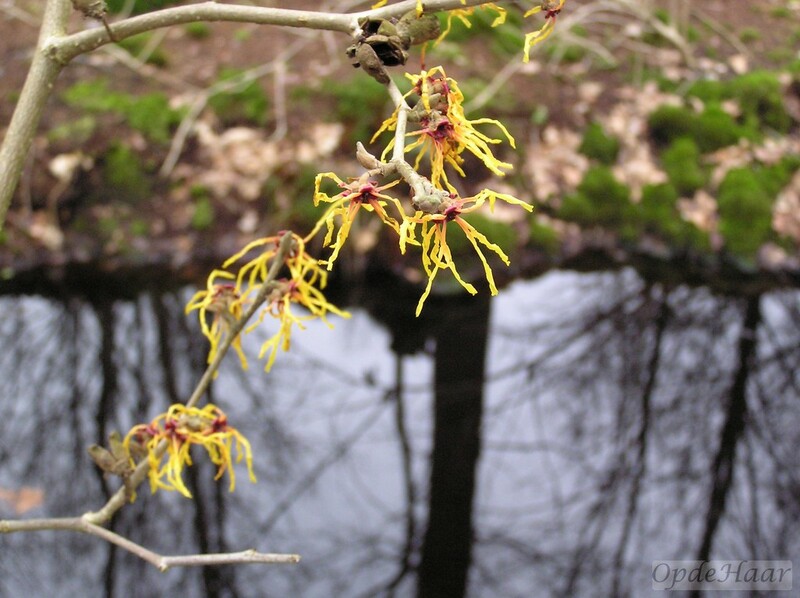 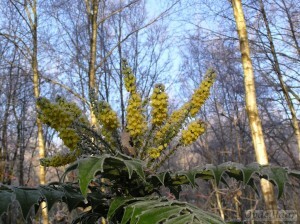 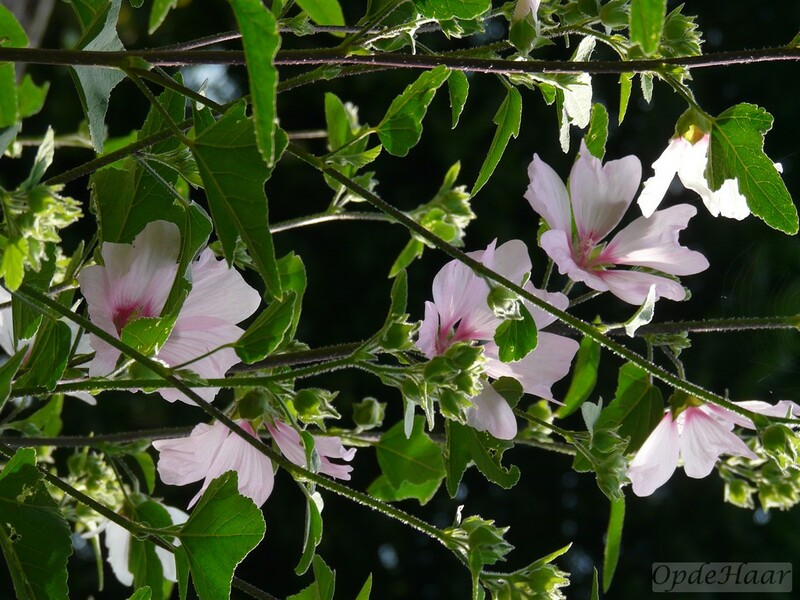 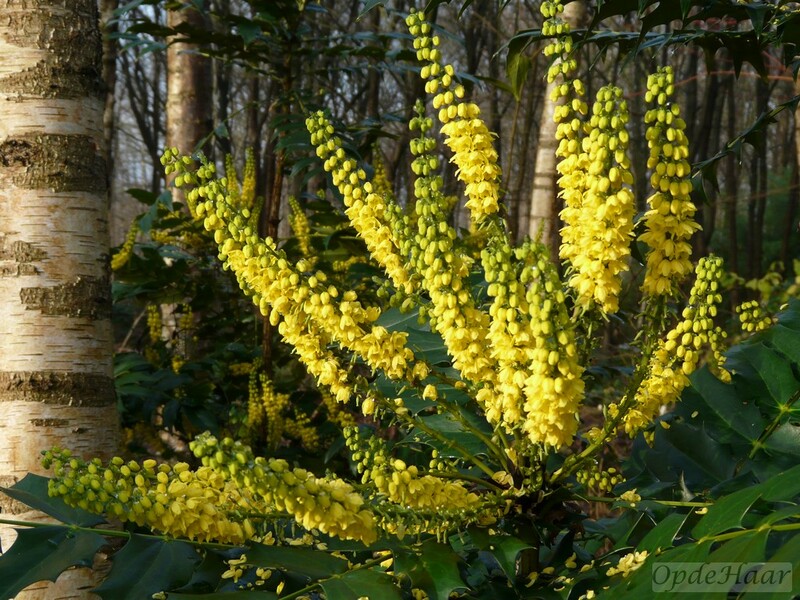 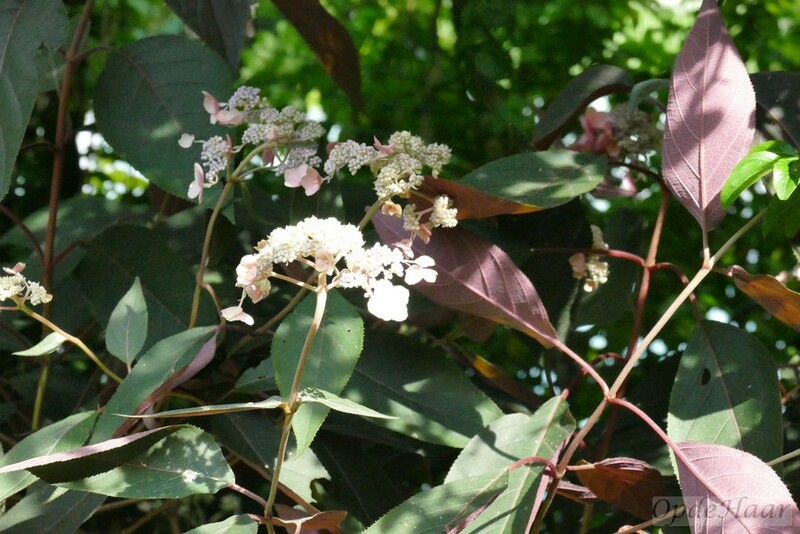 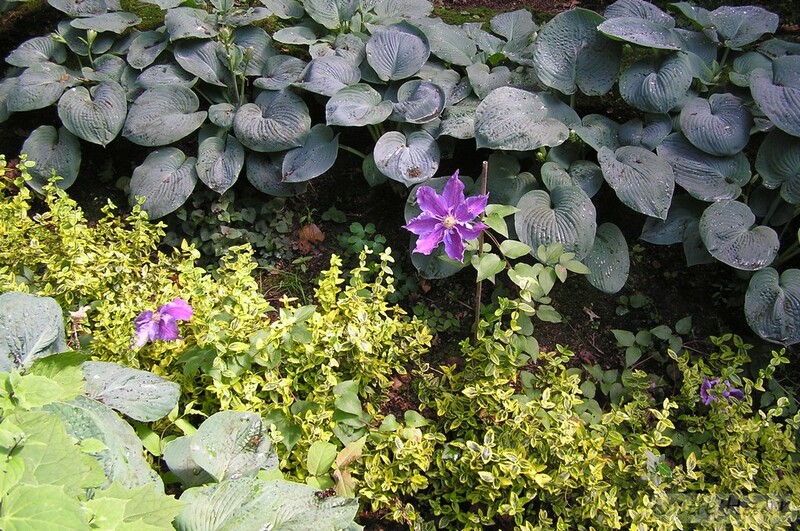 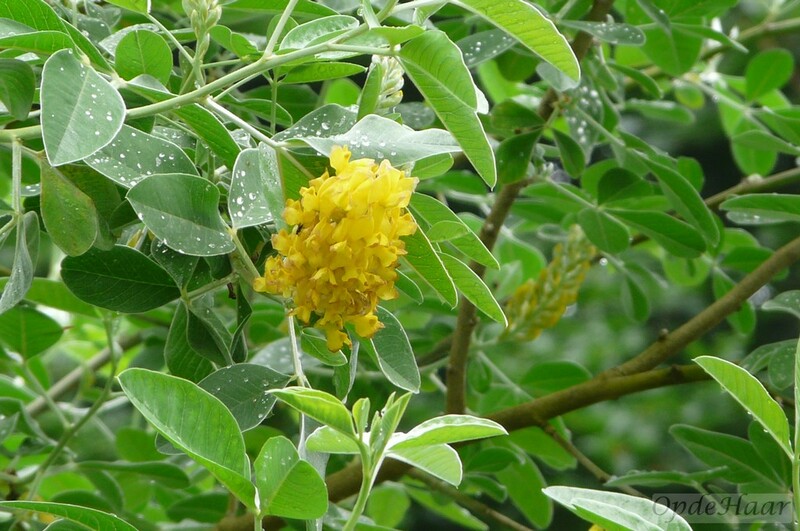 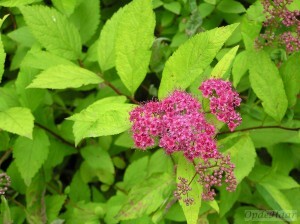 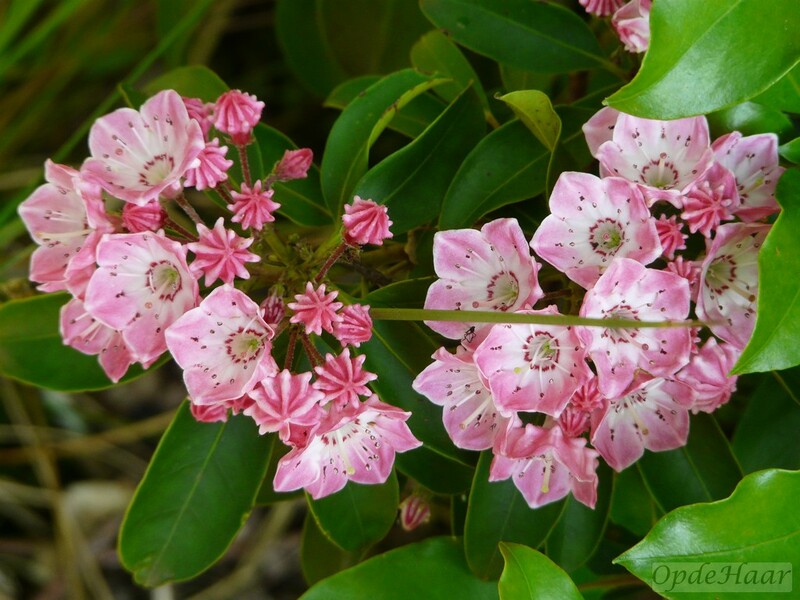 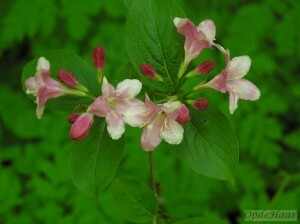 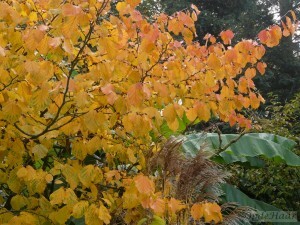 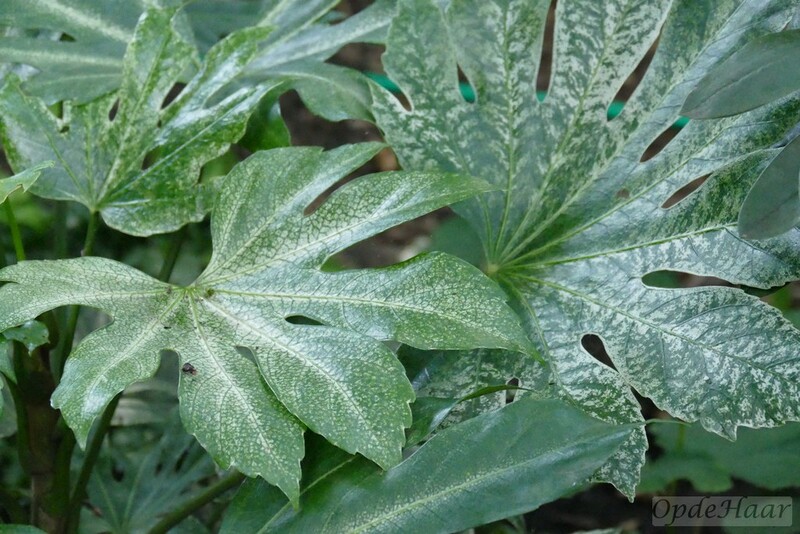 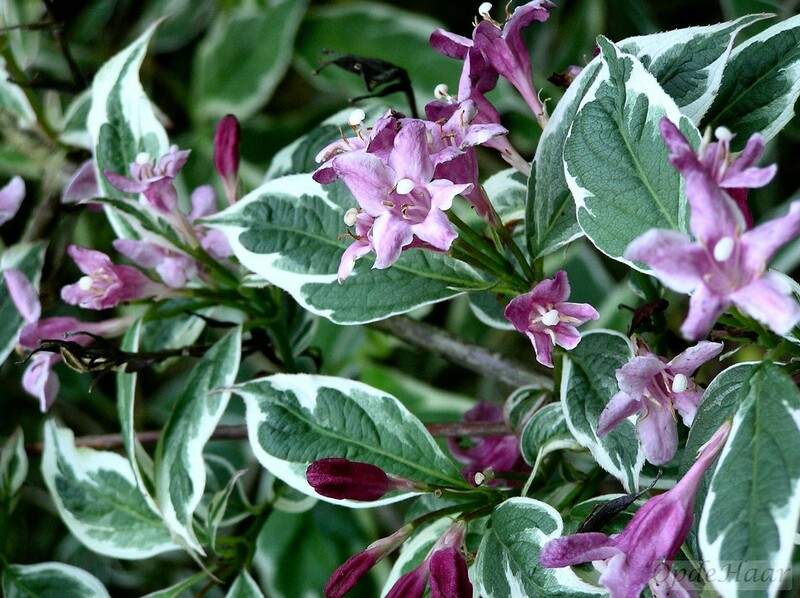 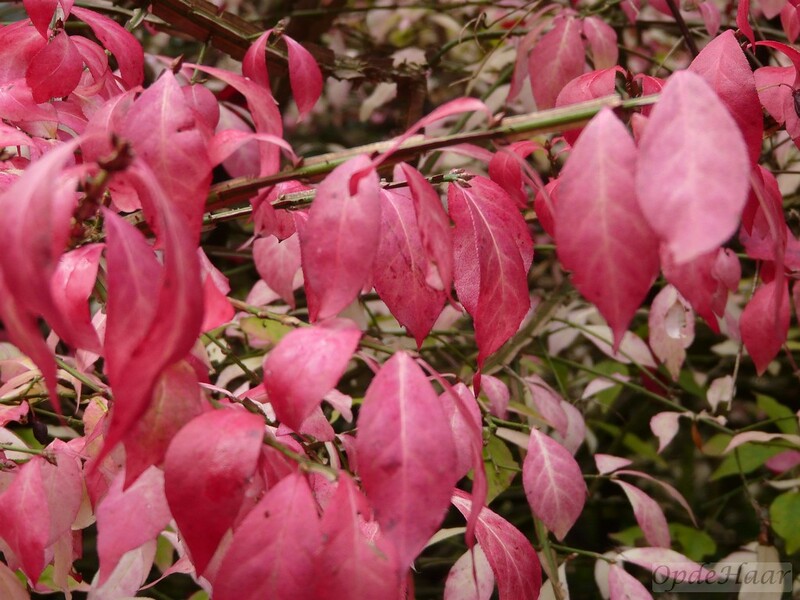 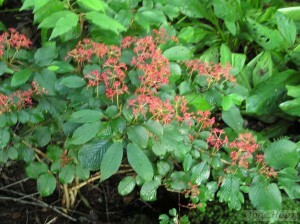 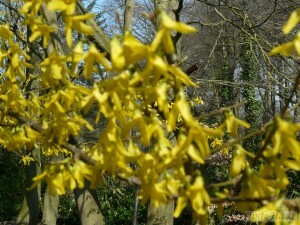 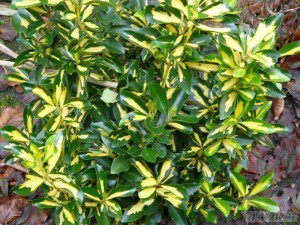 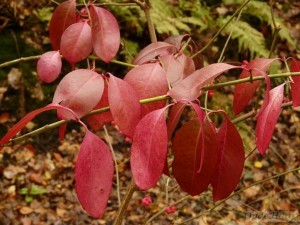 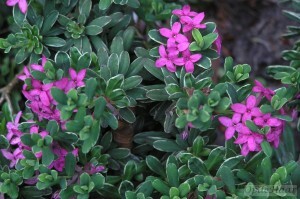 It came from N. china to Europe in 1850 and does best in full sun and is perfectly hardy without winter protection. 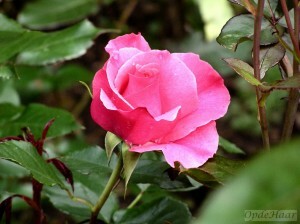 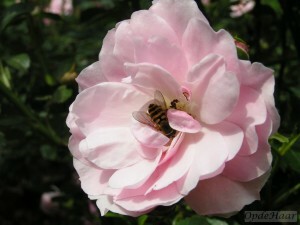 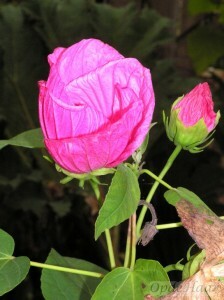 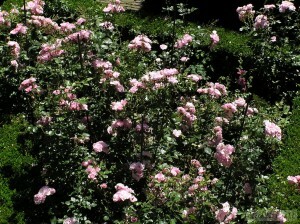 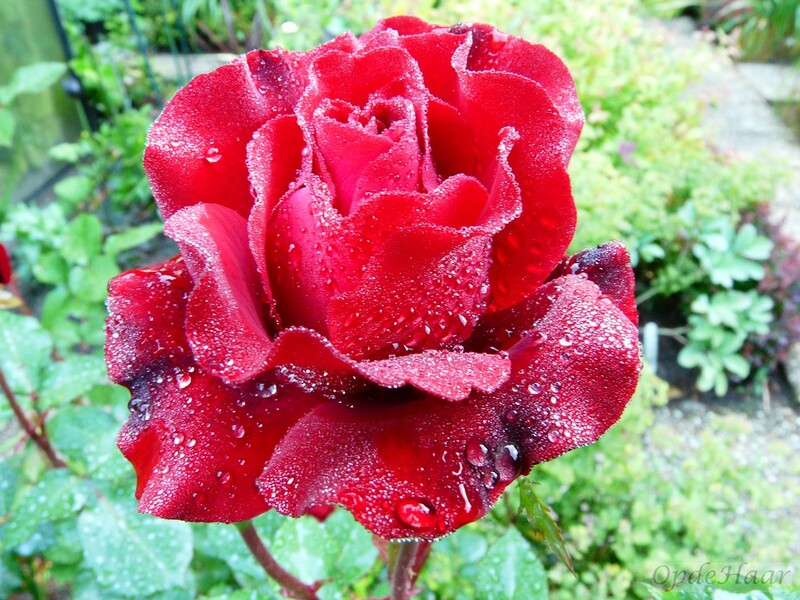 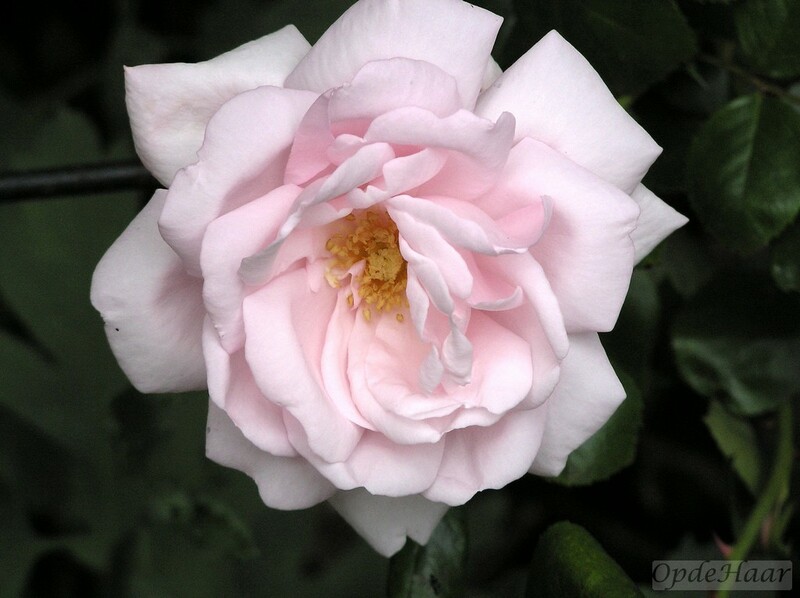 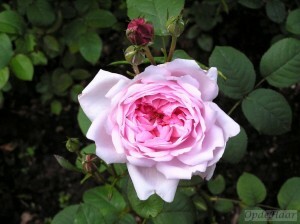 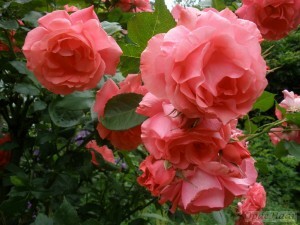 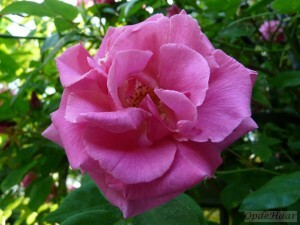 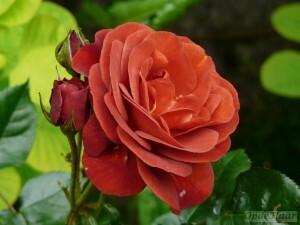 The mere mention of the word “rose” conjures up images of scent-filled beds of fully petalled flowers. 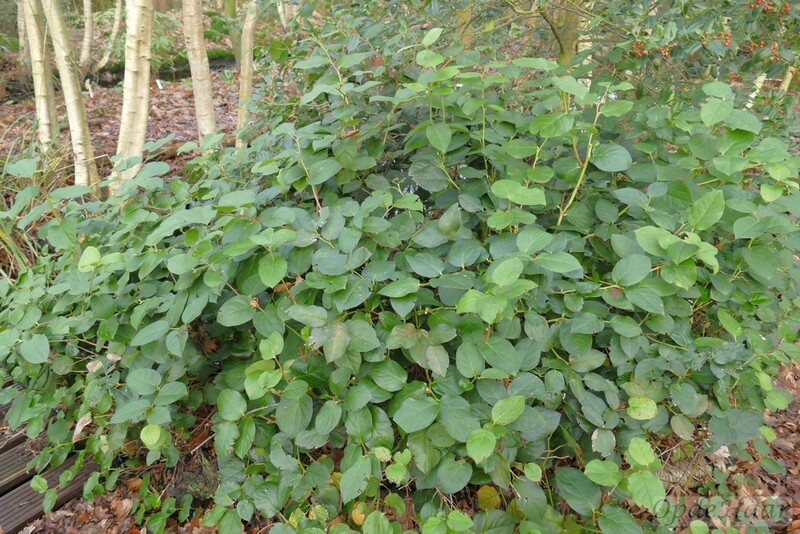 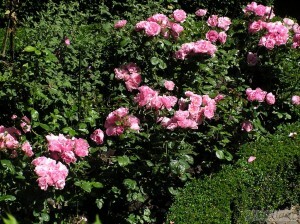 However, at the first sight of one of the recently introduced varieties of Persica or Hulthemia roses, my first thought amounted to “What is it?”. We were cycling in northern Limburg in The Netherlands near Lottum which is central to several rose nurseries and has an exhibition garden. It was early and flowers were not in full flush but a bed of what can only be described as explosive colour almost shouted out for attention; the cause of all this turned out to be a collection of Peter Ilsink’s “Babylon Eyes” hybrids which are currently marketed by Interplant in the Netherlands. 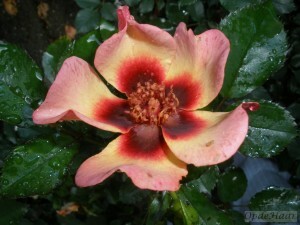 As I said, most of us have a fairly standard image of roses in our mind’s eye but this new range of hybrids offer something completely different and I find myself wondering how long it will be before garden designers discover the dramatic colour contrasts which somebody like the late Christopher Lloyd would undoubtedly have pounced upon. 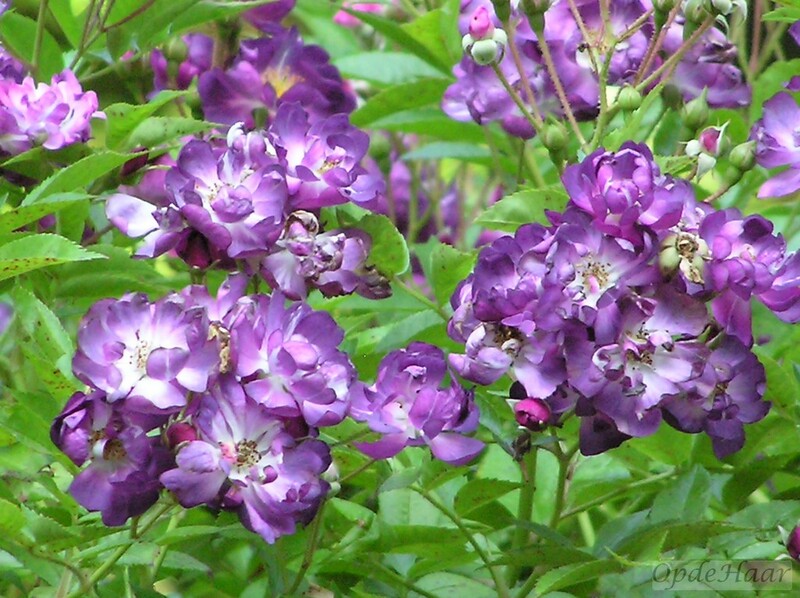 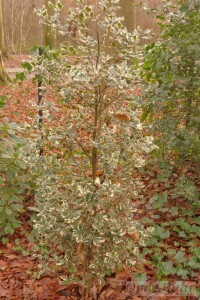 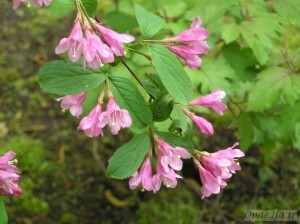 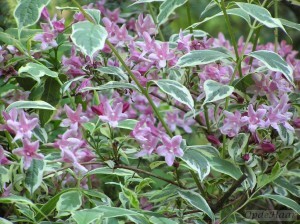 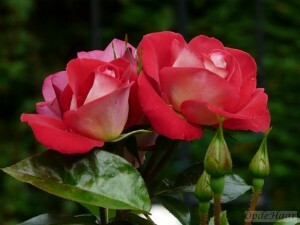 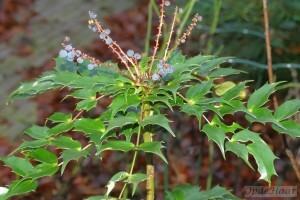 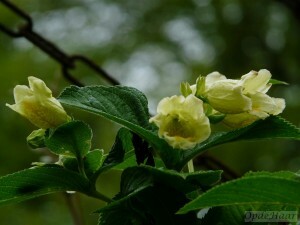 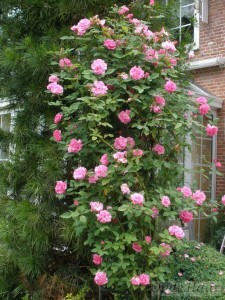 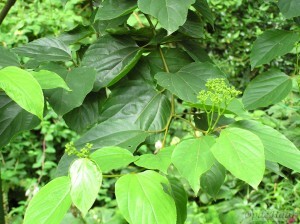 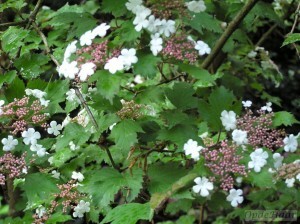 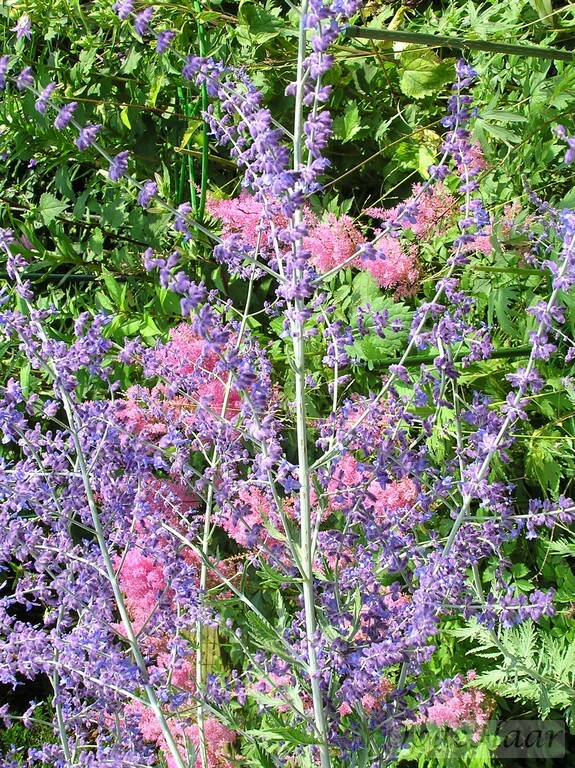 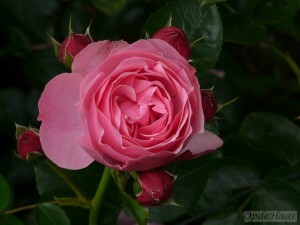 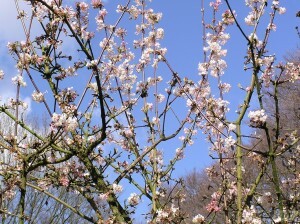 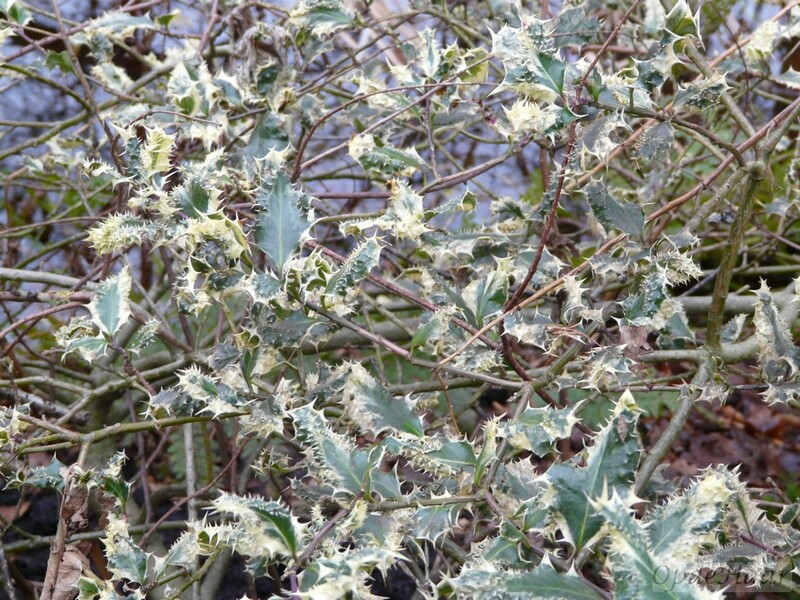 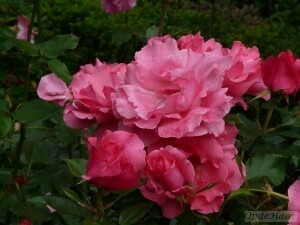 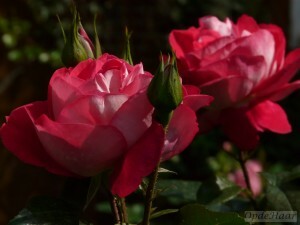 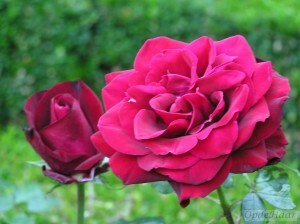 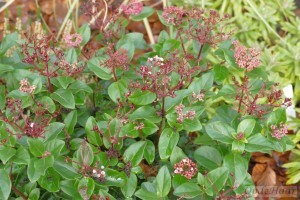 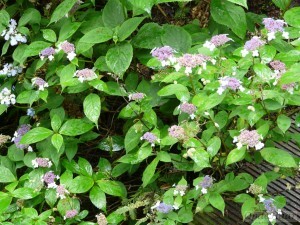 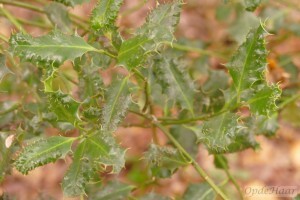 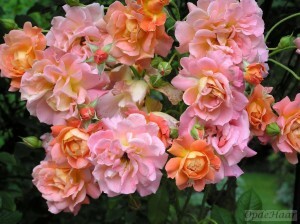 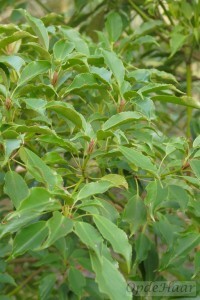 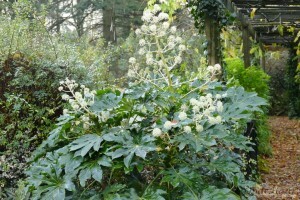 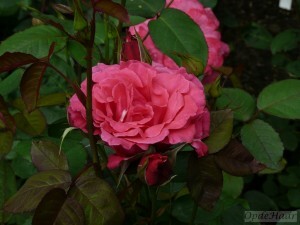 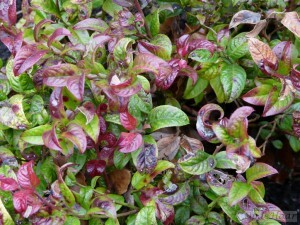 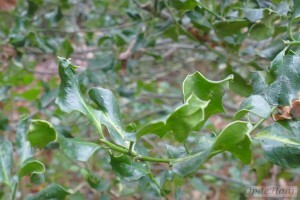 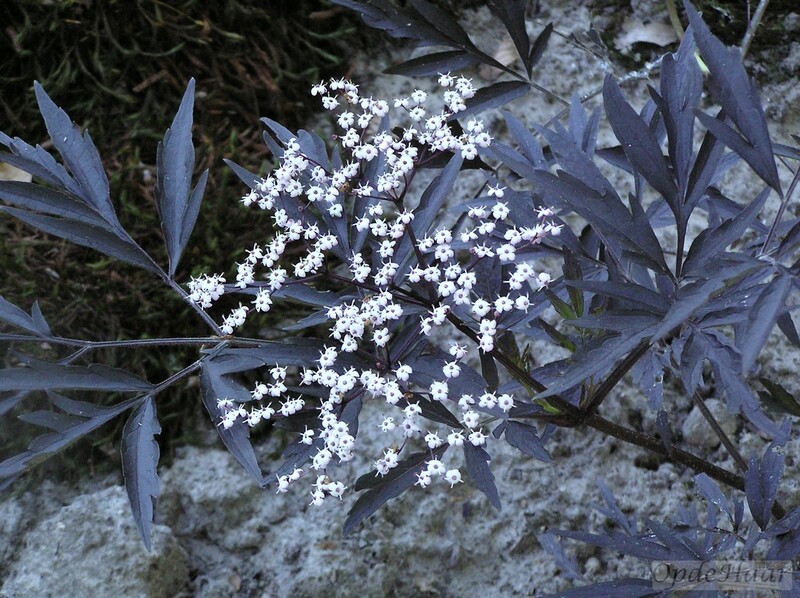 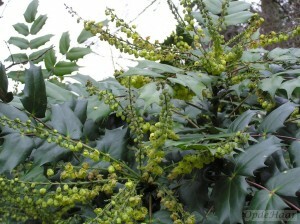 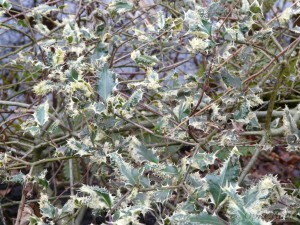 Nowadays, searches on Internet soon reveal that even in the late 1960’s, rose hybridisers such as Jack Harkness and Alex Cocker had targeted Hulthemia persica as having flowers of interest in breeding programmes. 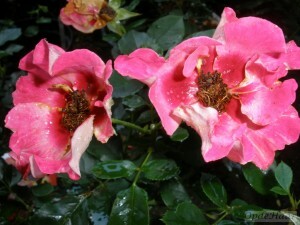 Other rose breeders were quick to pick up on the potential of the idea and the US hybridiser James A. Sproul has done a lot of work which he discusses very informatively and is available on Internet – “Hulthemia roses and the red blotch” on the helpmefind.com website is particularly noteworthy. 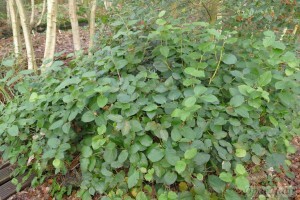 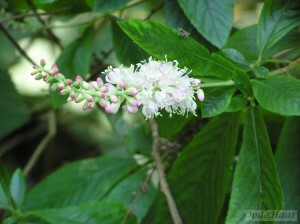 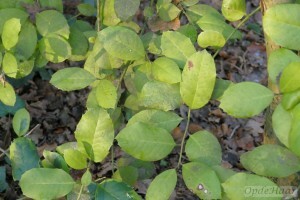 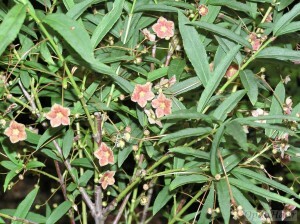 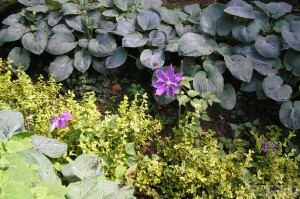 Hulthemia persica, a sub member of the rose family, is a weed occurring in central Asia – principally Iran and Afghanistan . 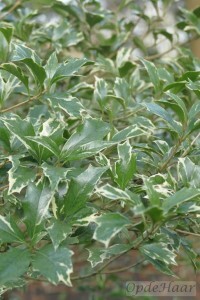 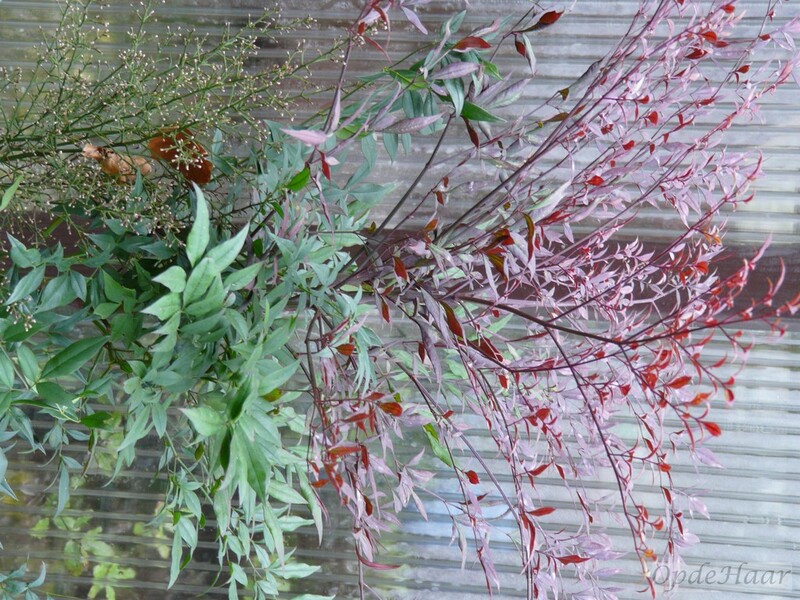 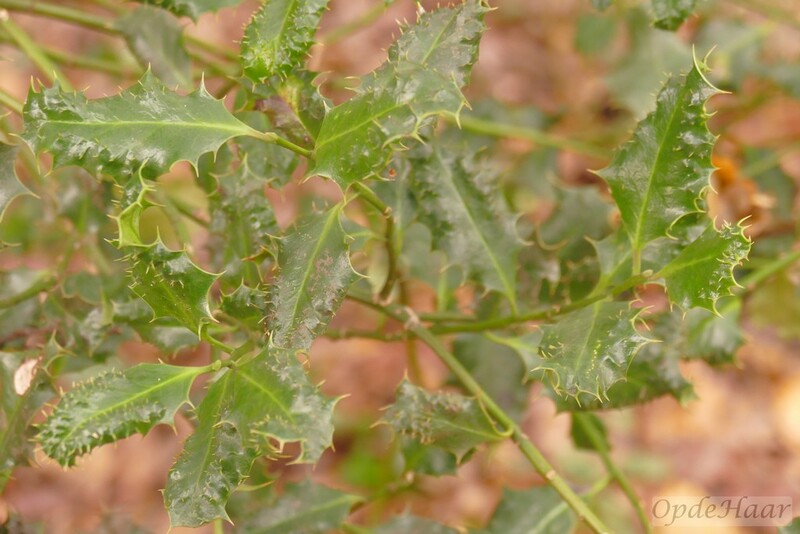 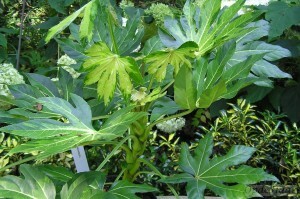 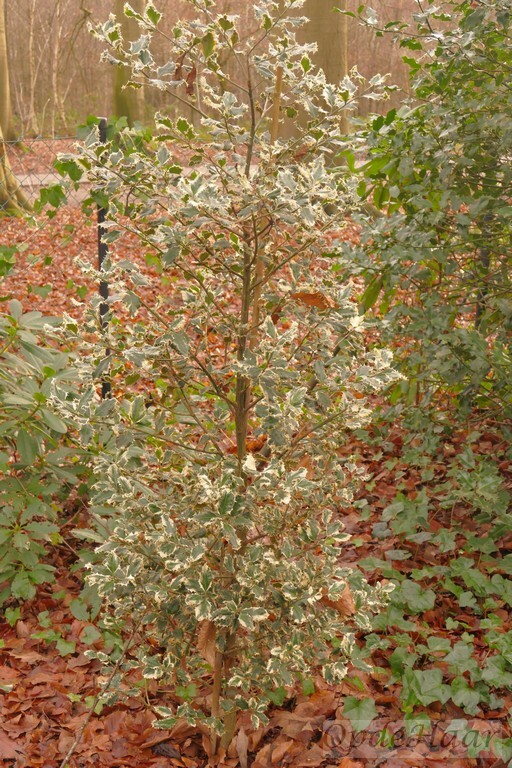 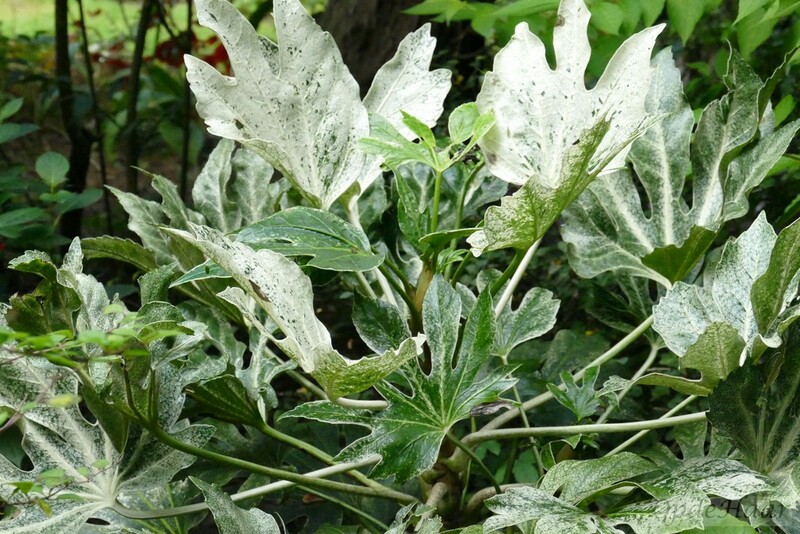 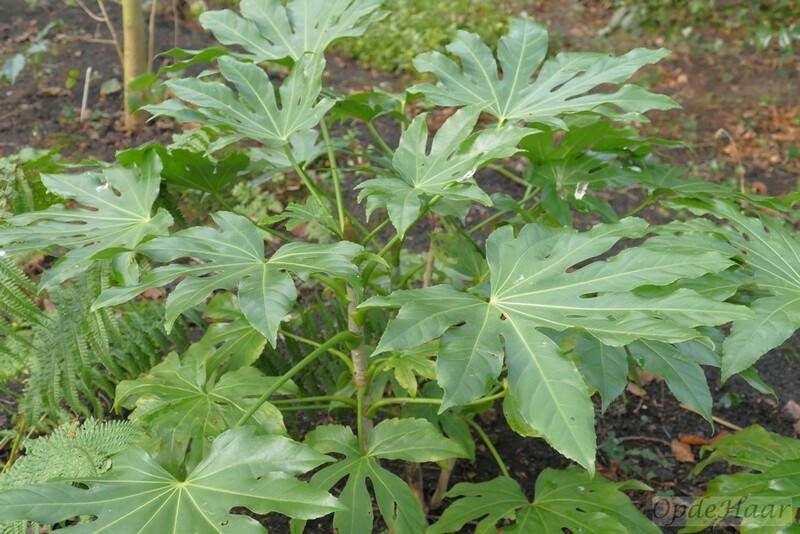 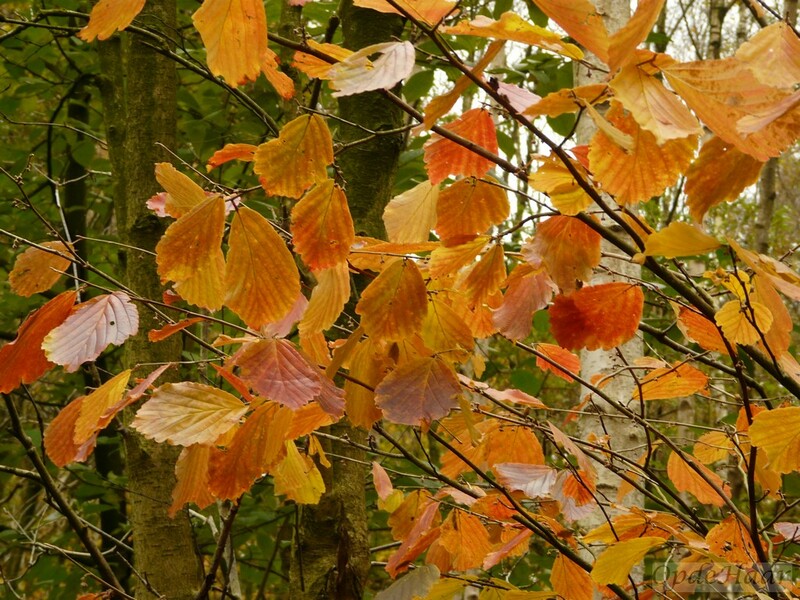 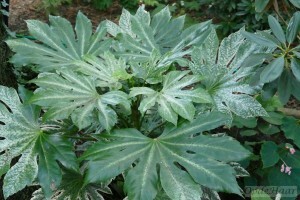 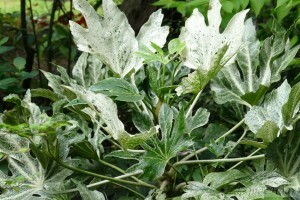 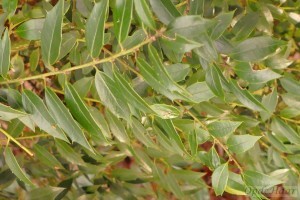 However the foliage firmly rules them out of any garden catalogue and the plants are dried and locally used as firewood after harvesting. 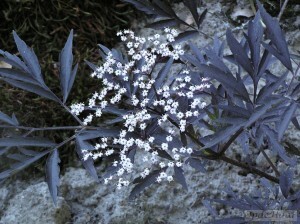 The flower is characterised by dark central flecks (which conjured up images of Cistus varieties when I first saw them). 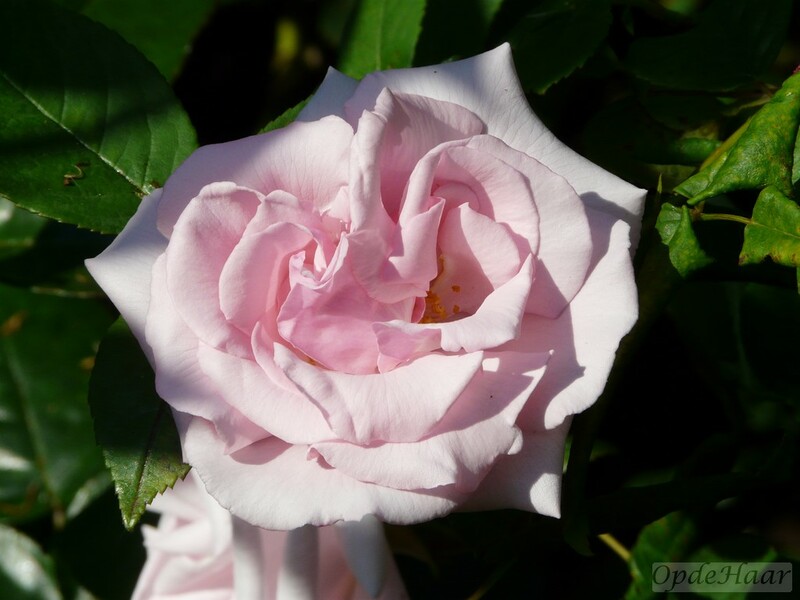 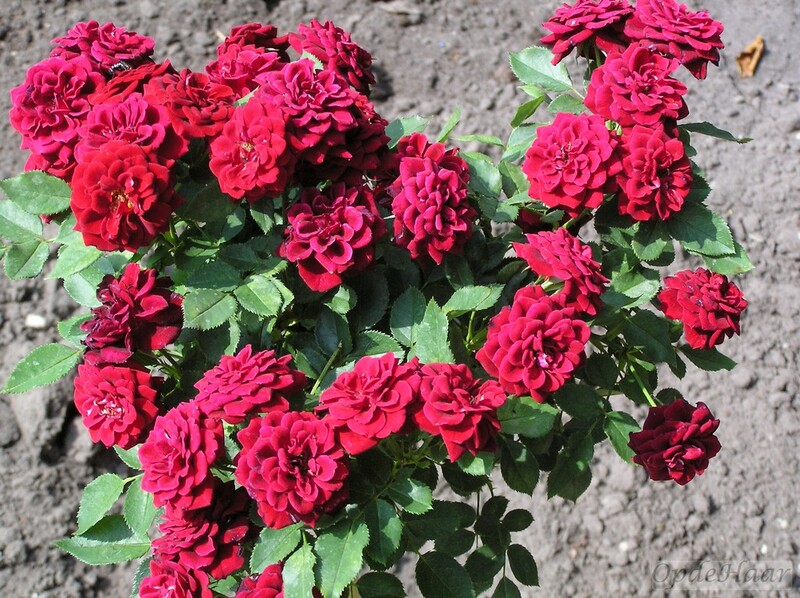 Rose hybridisers have now achieved plants having attractive foliage, long-season repeat flowering and claims including fragrance, disease resistance and no necessity for dead-heading. 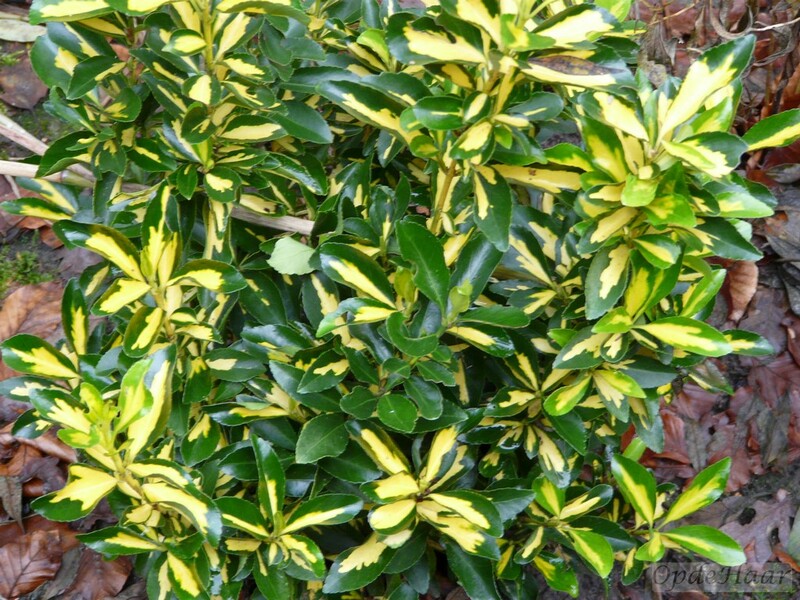 We have several of the “Babylon Eyes” series still in pots and I therefore can’t yet offer any comment on performance in the light of the claims (summer 2017) or to how they perform in planting schemes in the open garden. As I said, reference to Internet quickly reveals that rose breeders around the world are introducing these hybrid Persica or Hulthemia roses and one can’t help but feel they have a big future. Indeed, practically all groups visiting the garden since I bought the plants spontaneously group around the pots and ask first if they are for sale and then want to know where they can buy them! 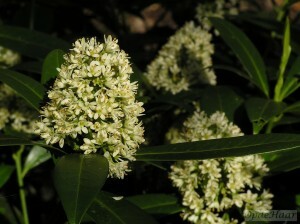 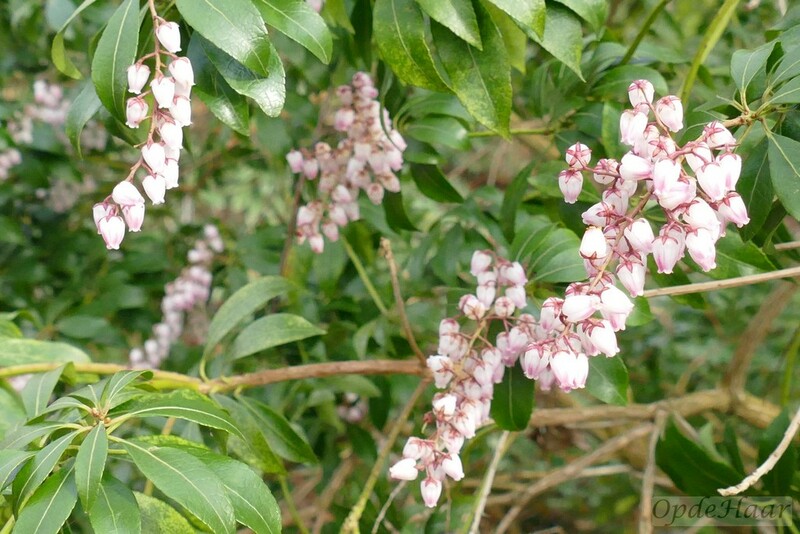 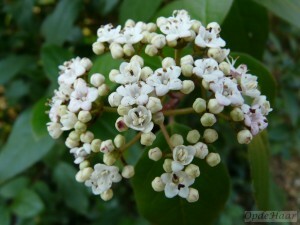 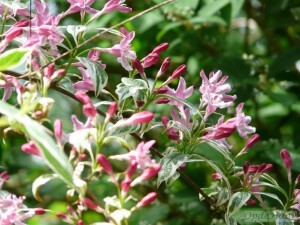 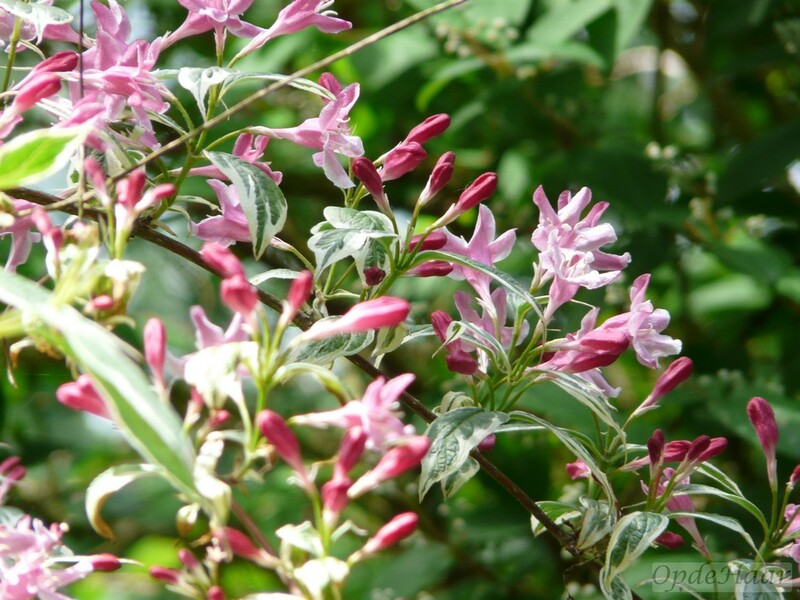 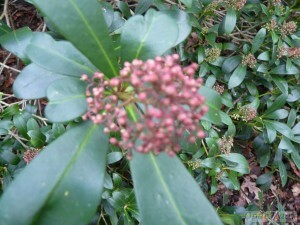 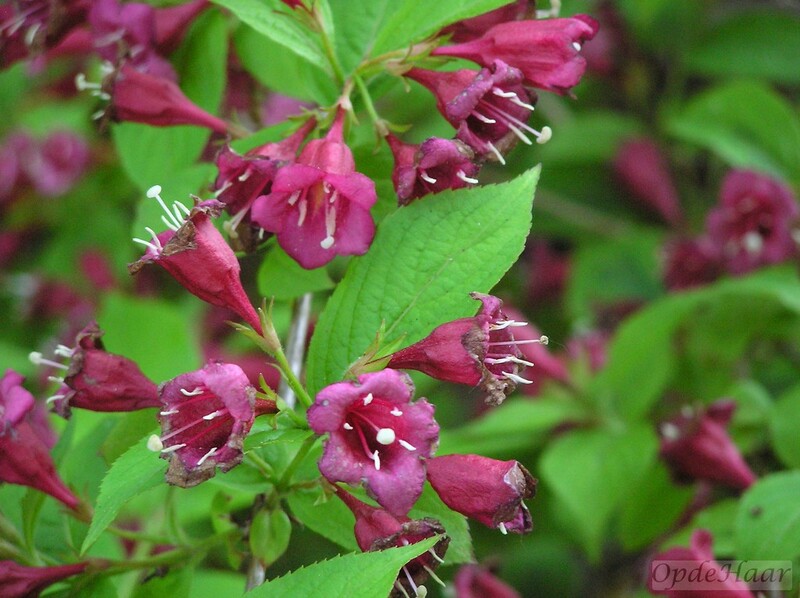 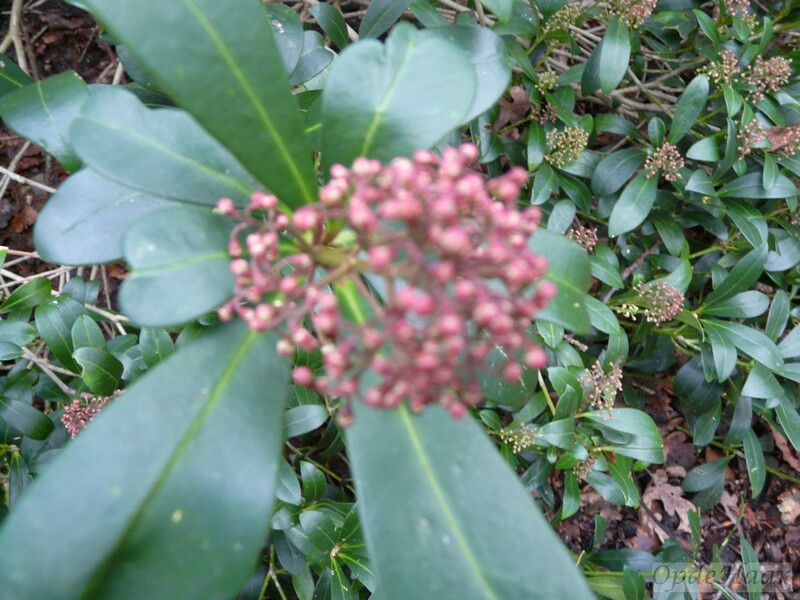 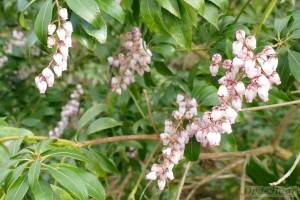 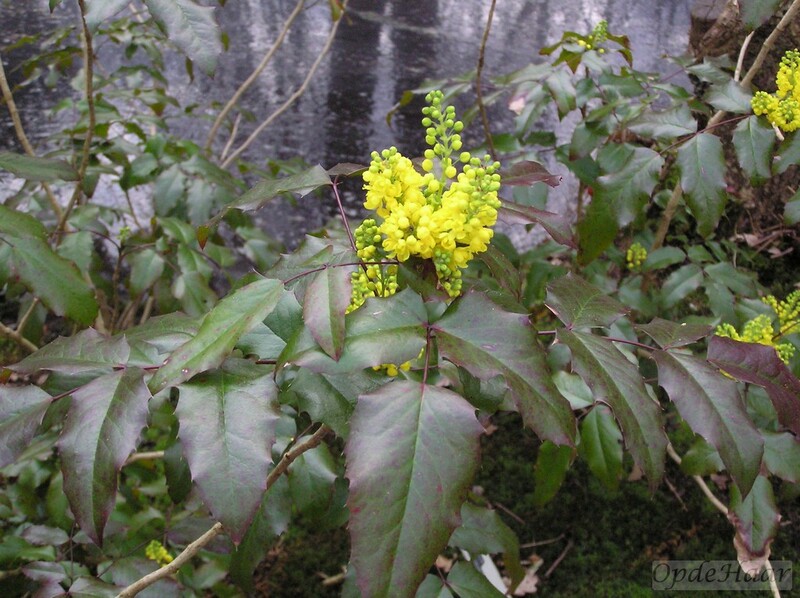 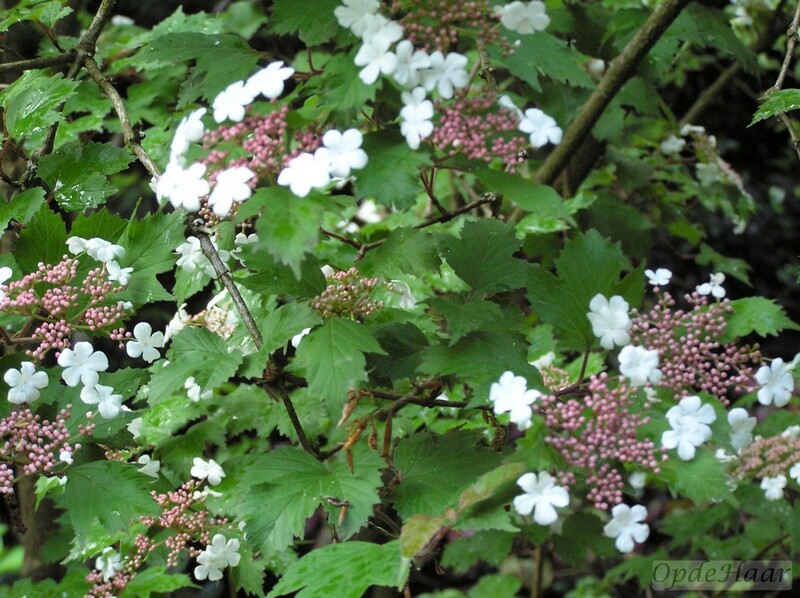 Under Miscellaneous there are photos of the following shrubs: abelia, arbutus, aucuba, berberis, callicarpa, caryopteris, ceratostigma,chaenomele, chimonanthus, choisya, cornus, cotinus, cytisus, edgeworthia, eleagnus, enkianthus, euonymus, forsythia, gautheria, hovenia, lavatera, leucothoe, leycesteria, nandina, neillia, osmanthus, perovskia, philadelphus, physocarpus, ribes, sambucus, sarcococca, spiraea, stranvesia, symphoricarpos, en trochodendron.